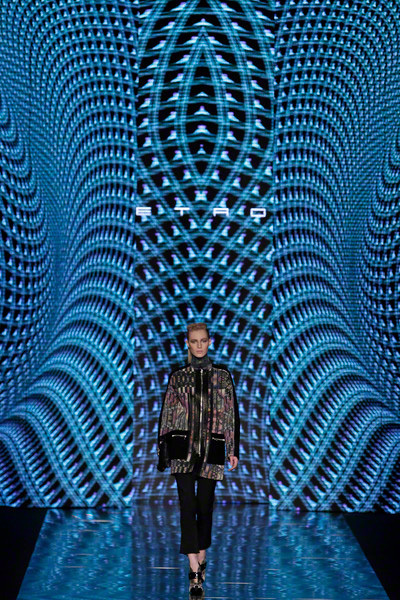 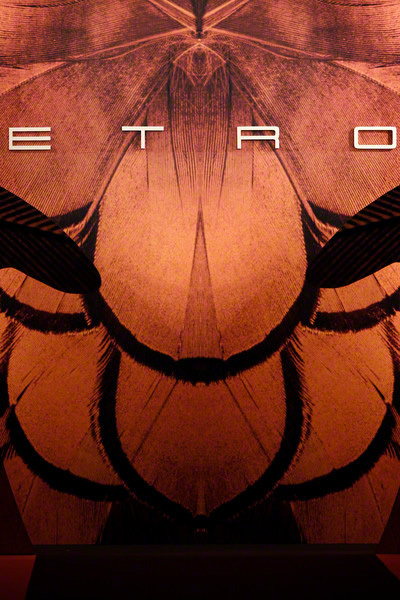 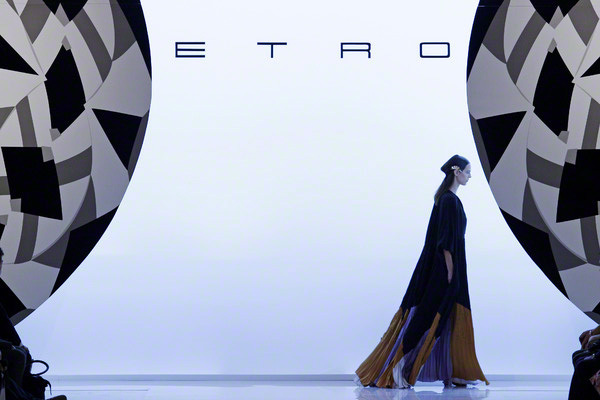 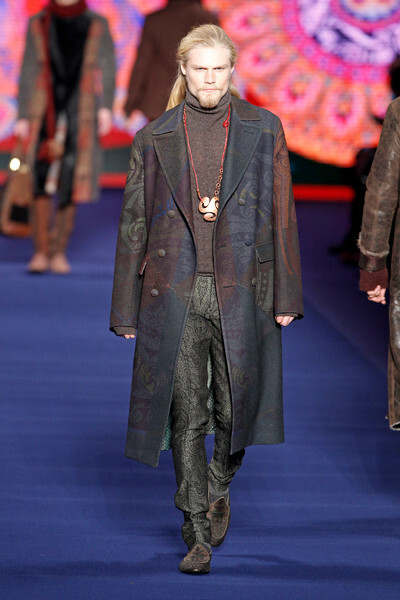 Veronica Etro built her fw2013 collection around a few themes: Renaissance ceiling murals, Russian ceramics — and, literally, the digital era, using the former as background for cyber-inspired geometric motifs. 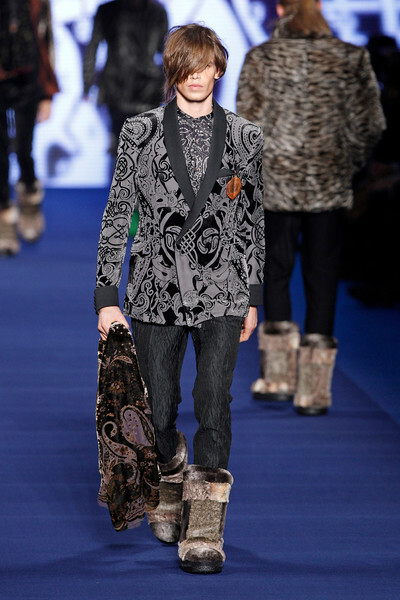 It made for an interesting collection. 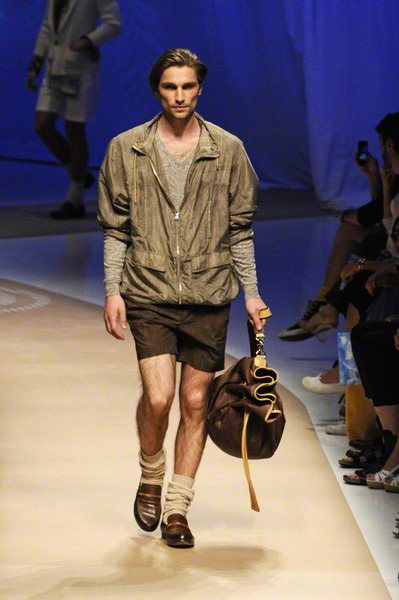 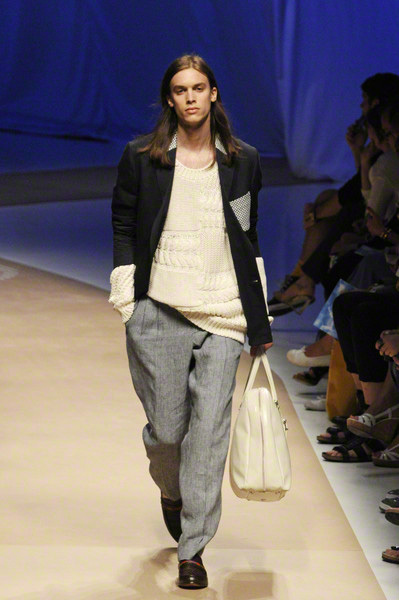 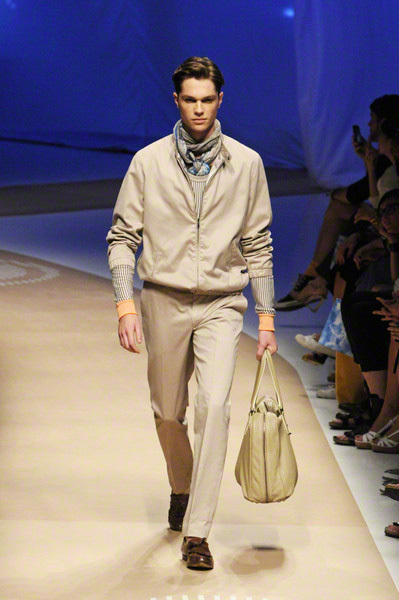 There was a modern side with a sporty sensibility. 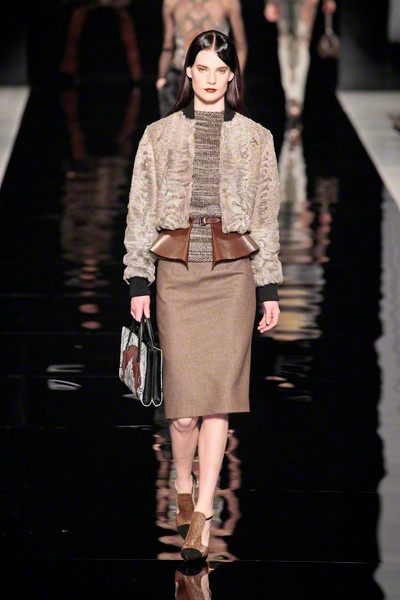 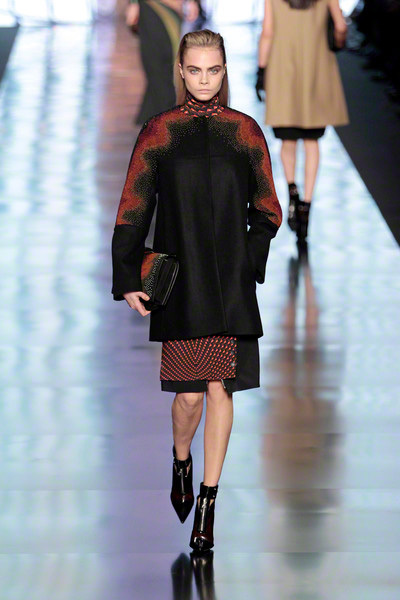 The outerwear was cut with attitude — and with that rounded-shoulder-of-the-season. 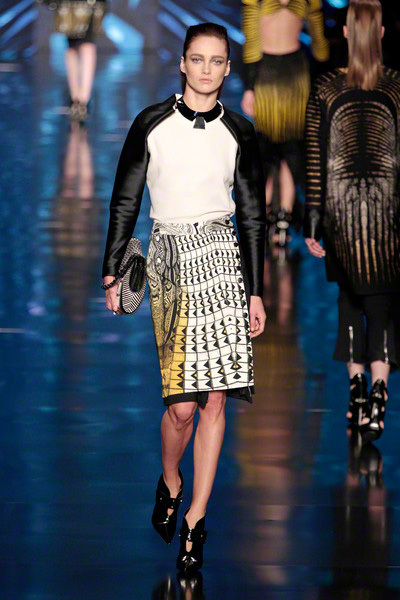 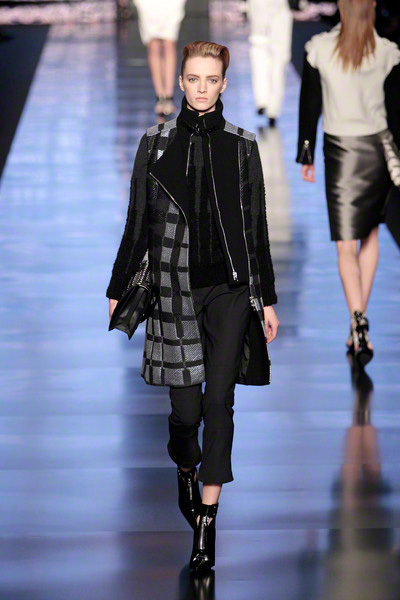 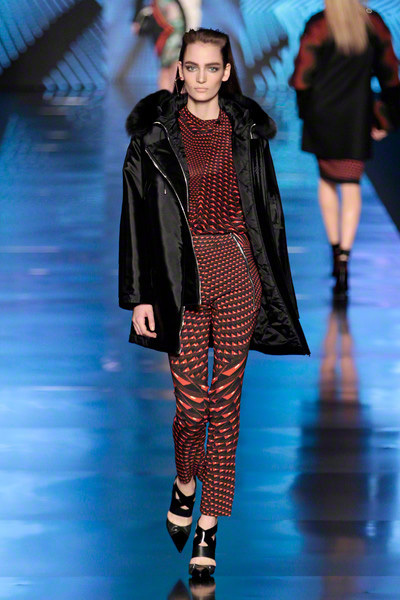 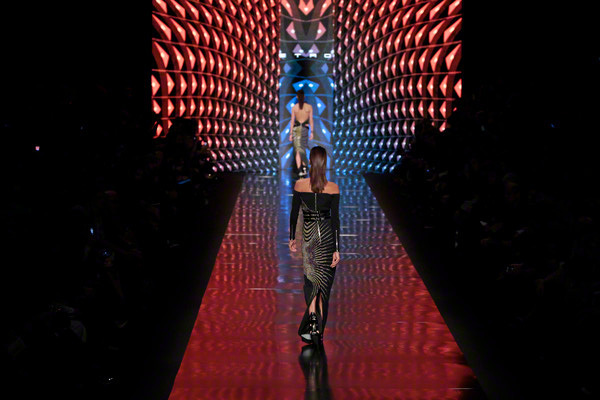 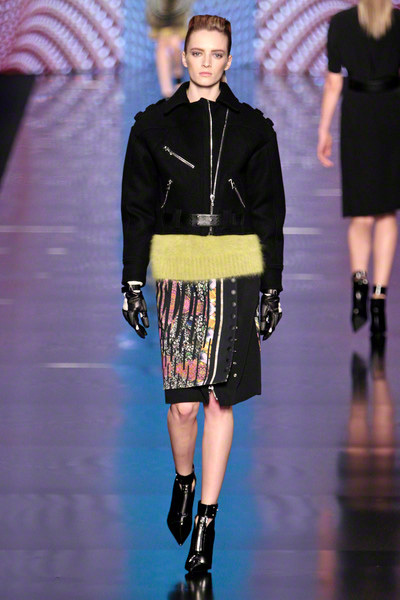 The shapes were simple, but the effect was oppositie because of the jacquards, leather, techno-prints, studs and sparkles. 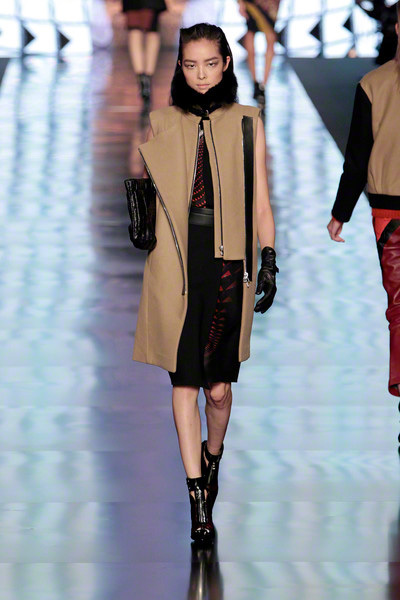 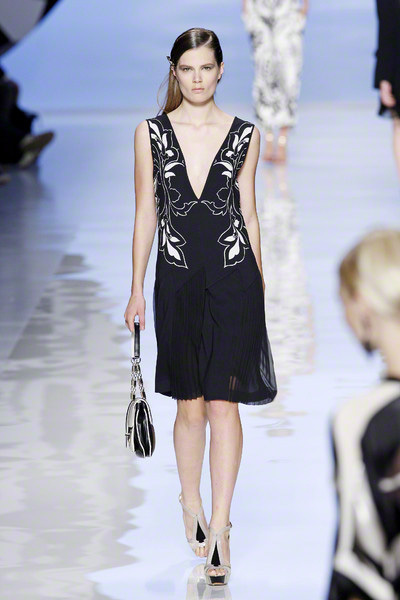 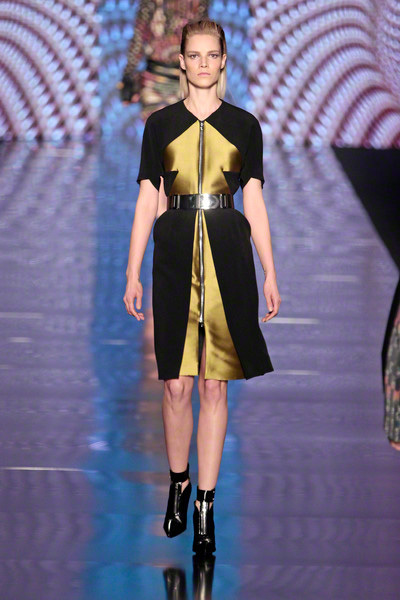 Dresses came both loose and waisted, some turned racy via demonstrative sleeve zippers. 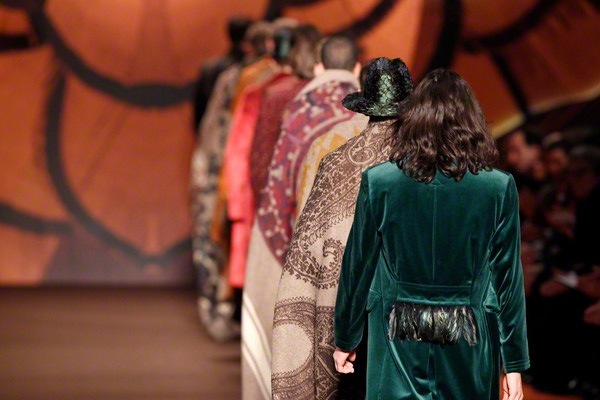 At Etro it felt as if we were watching a parade of old wealthy kings with a very particular taste of style. 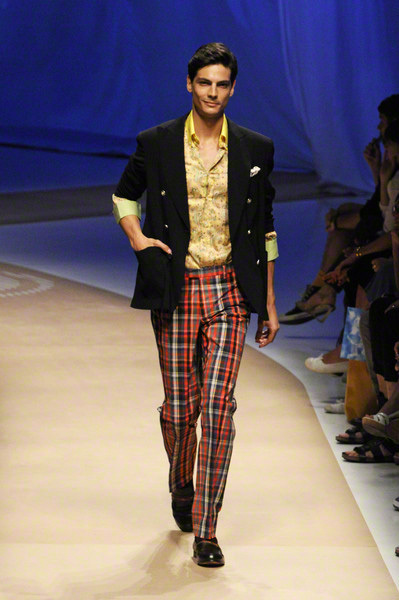 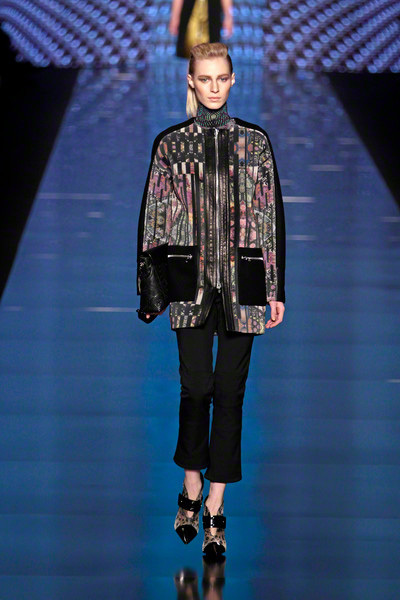 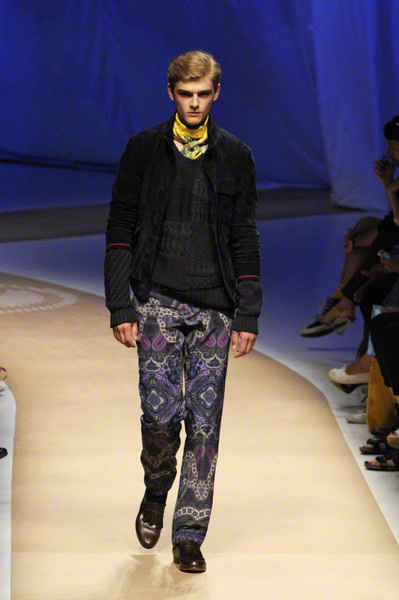 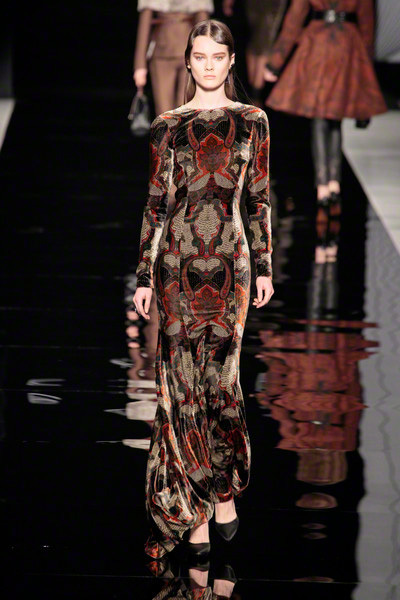 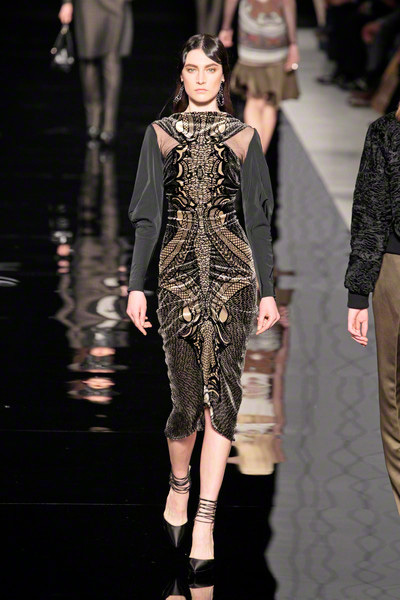 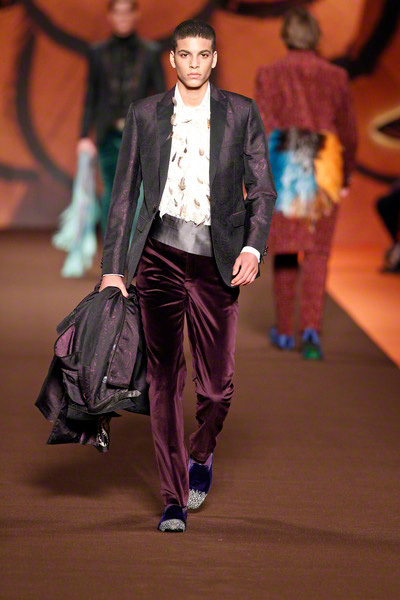 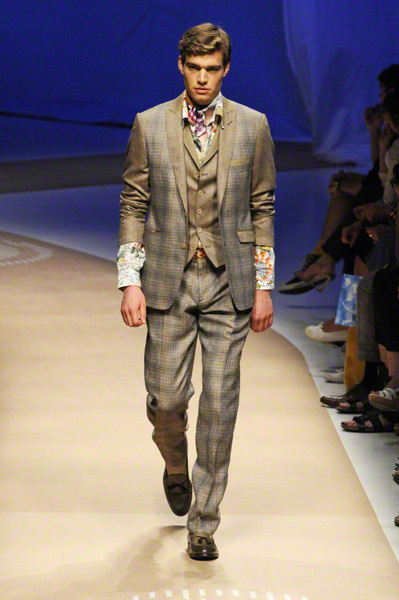 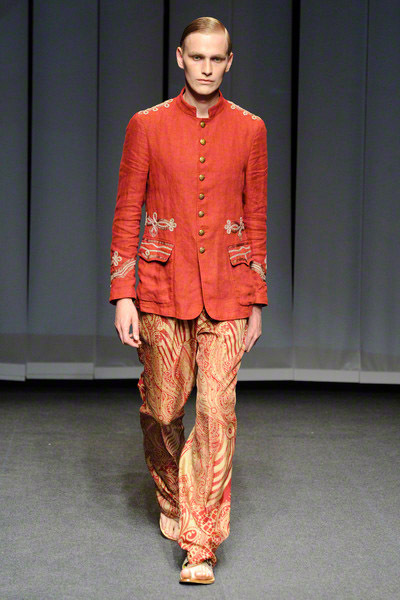 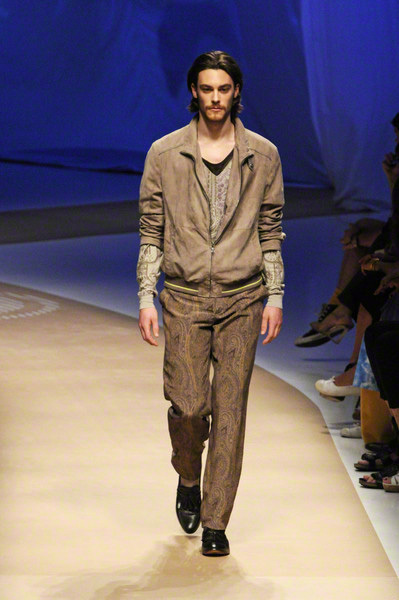 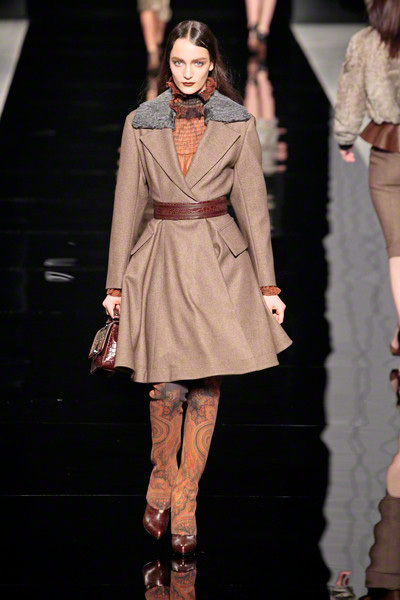 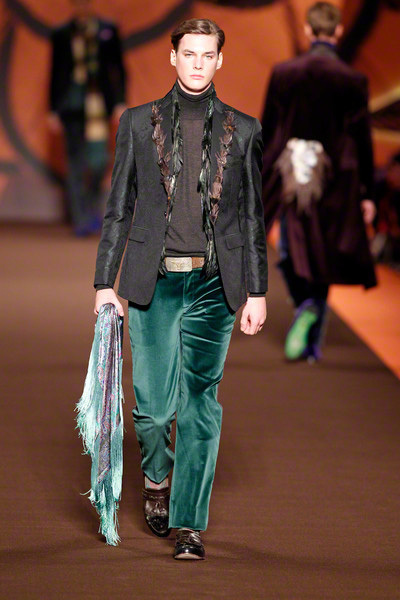 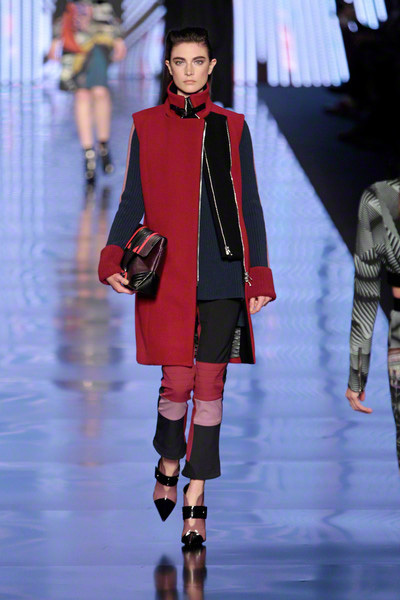 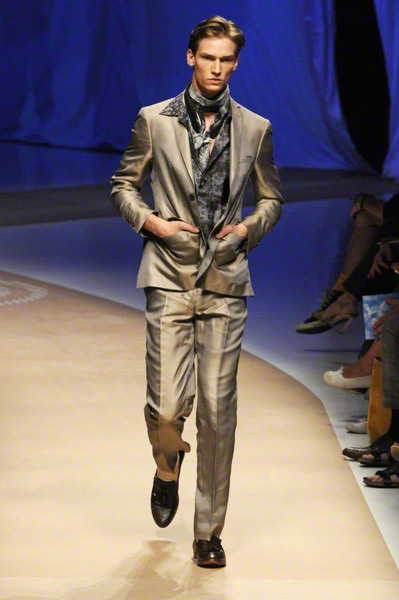 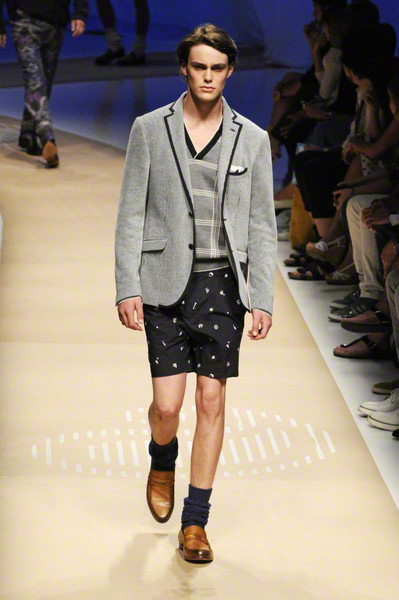 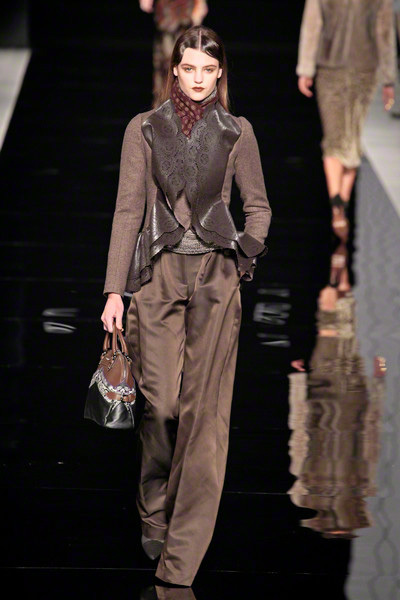 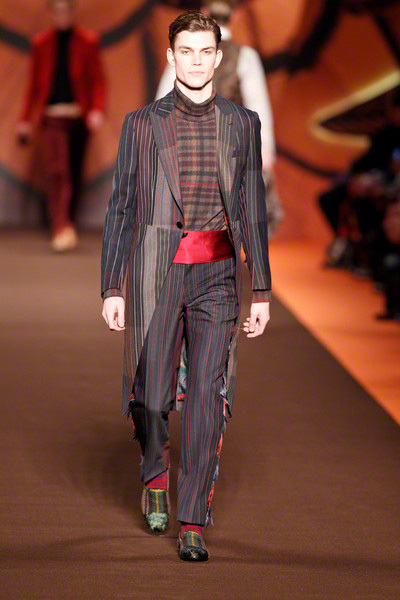 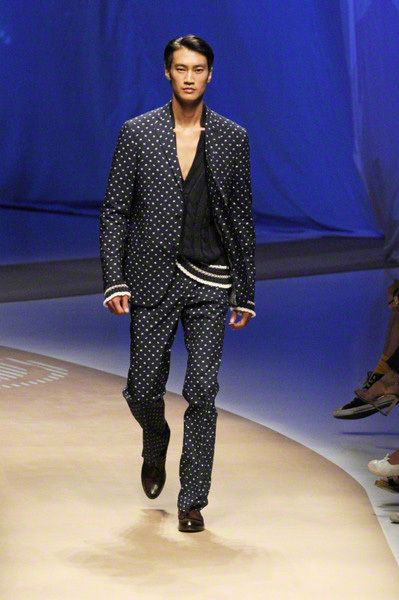 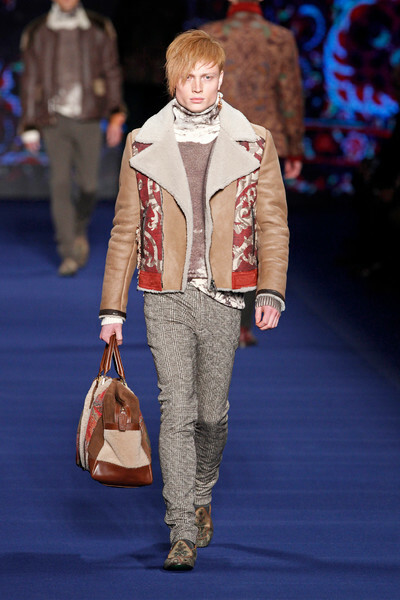 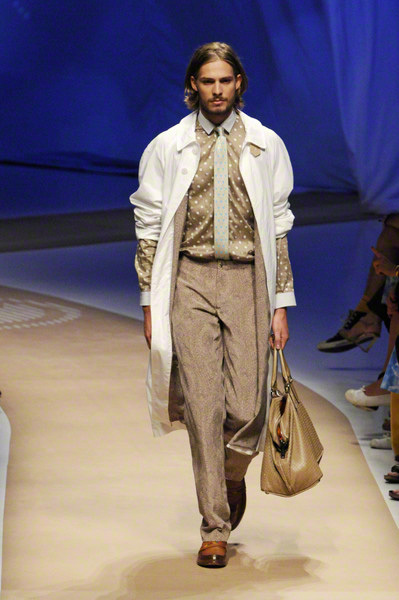 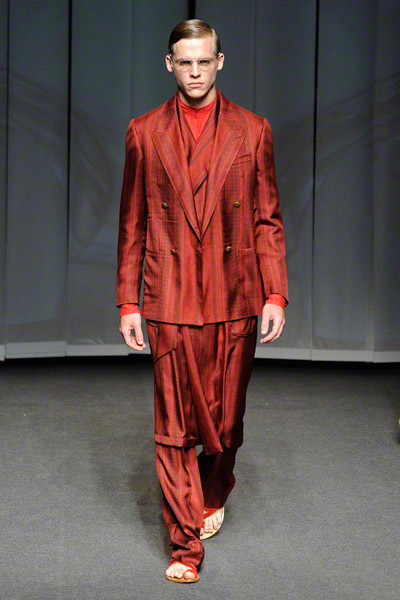 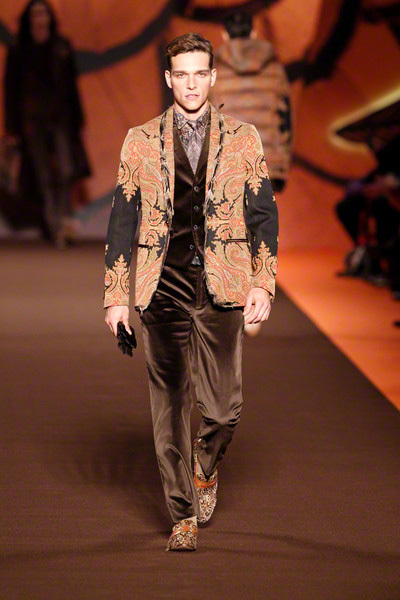 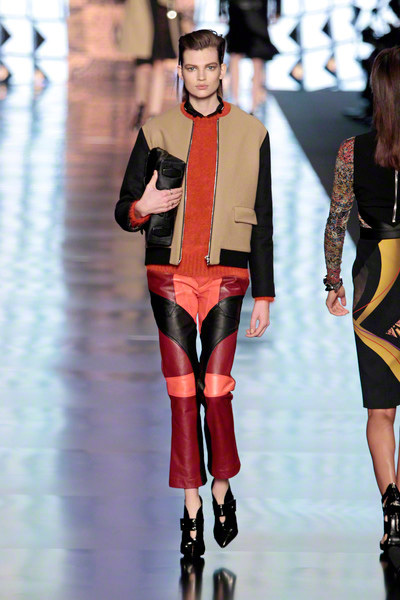 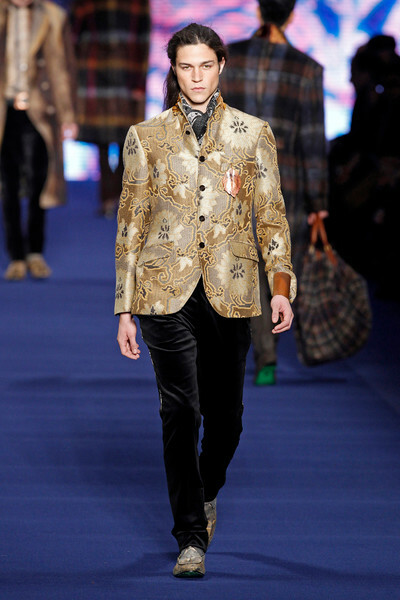 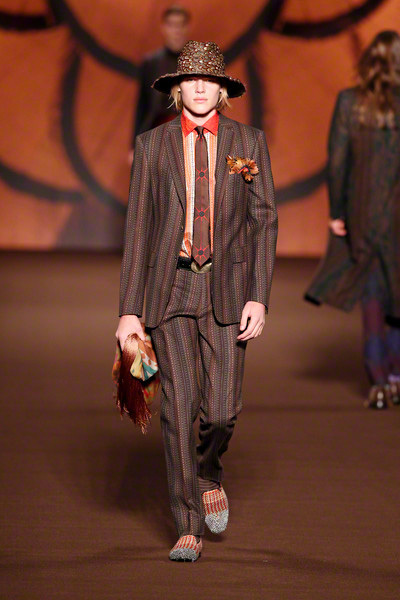 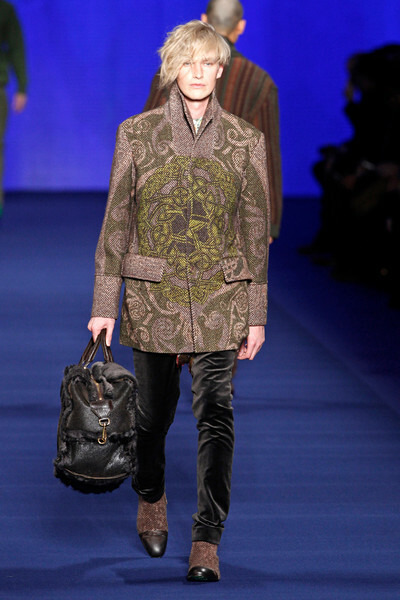 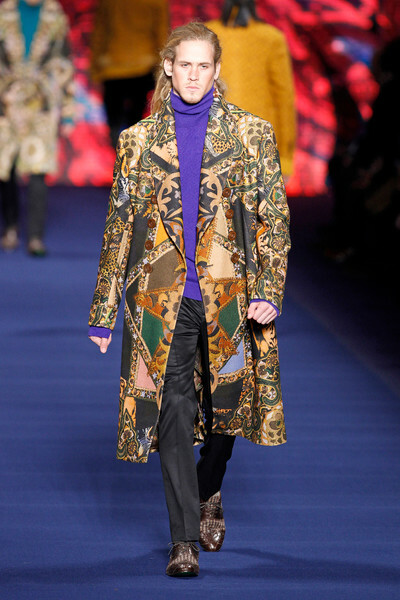 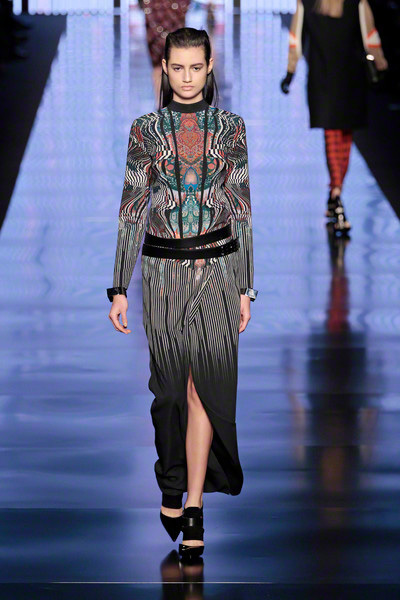 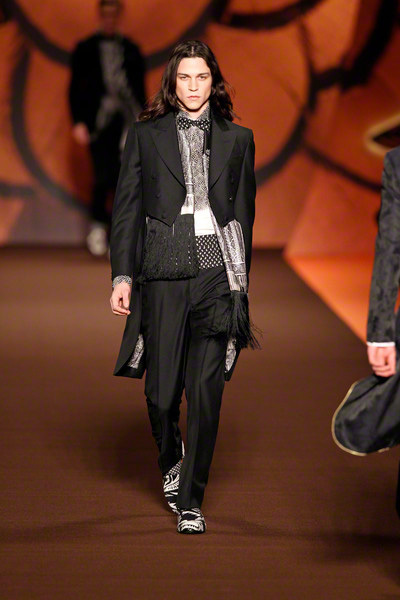 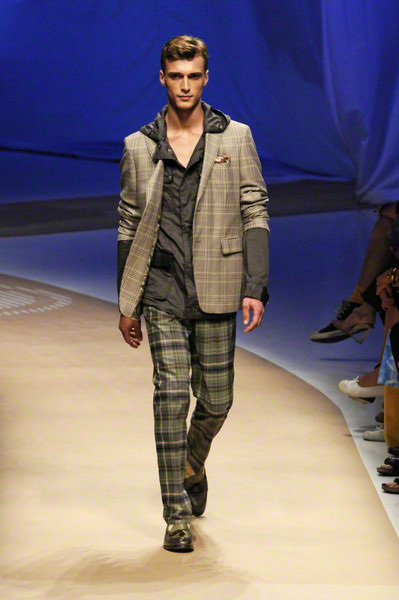 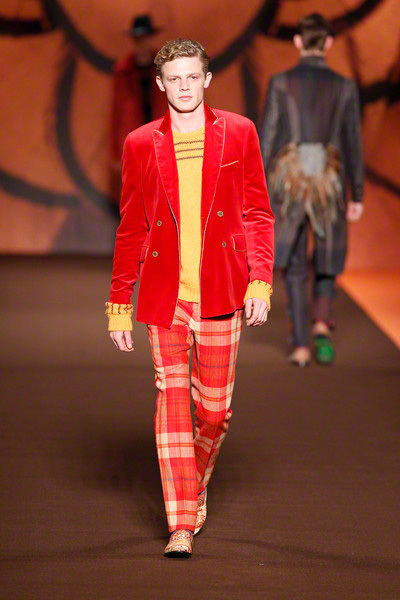 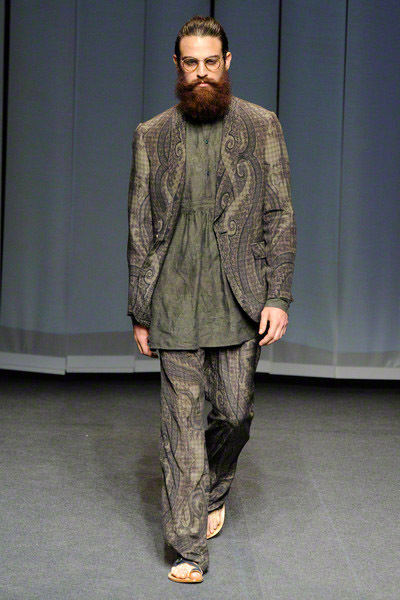 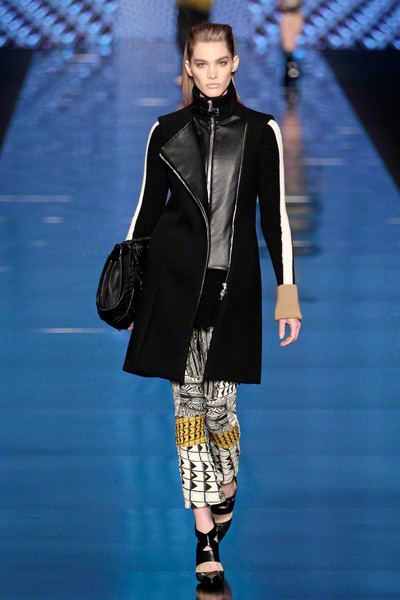 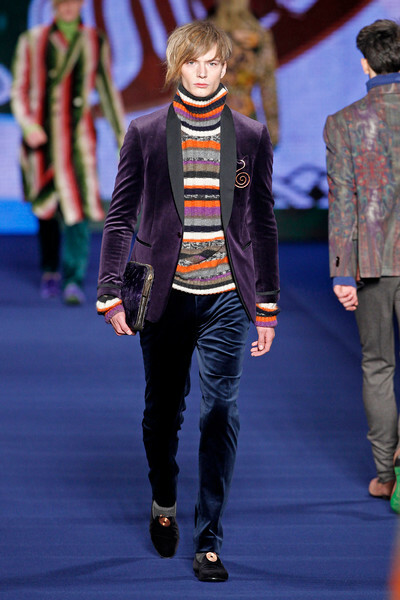 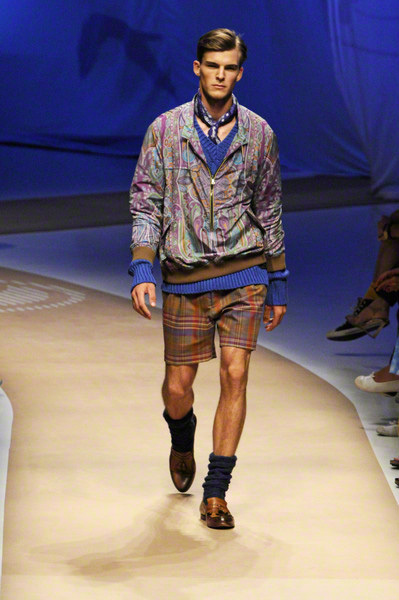 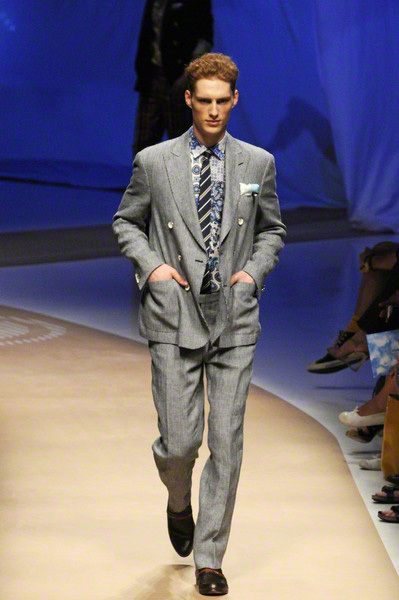 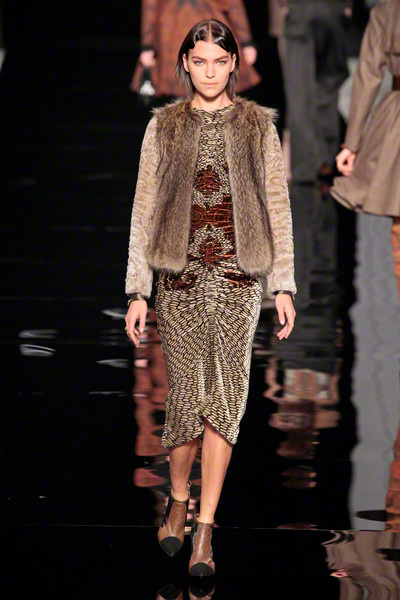 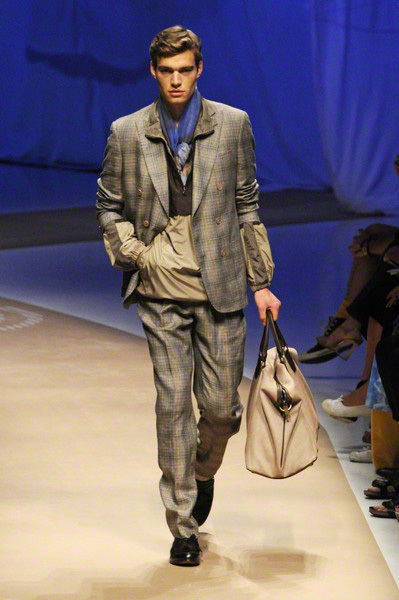 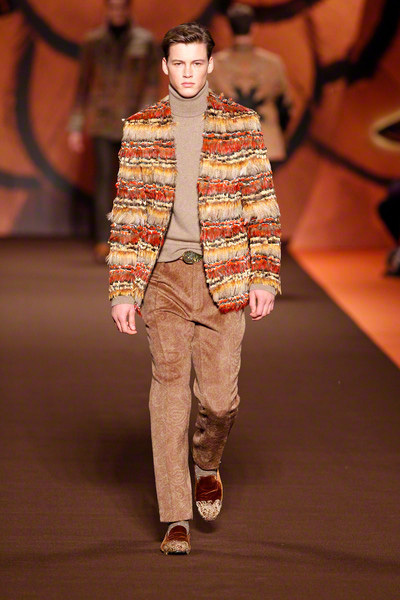 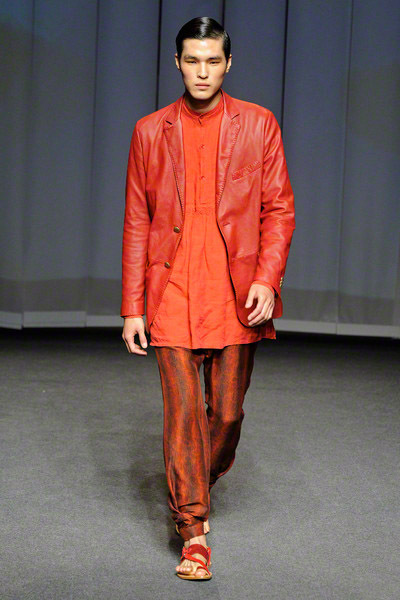 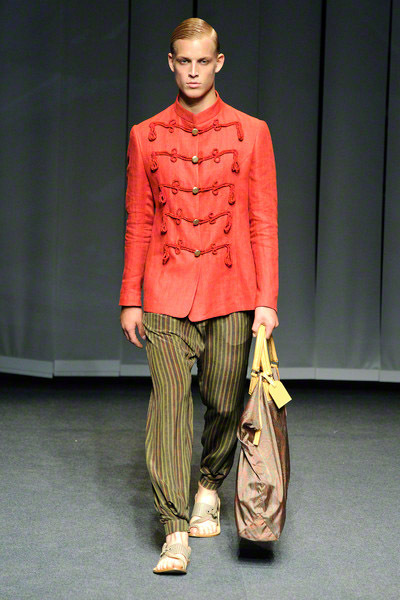 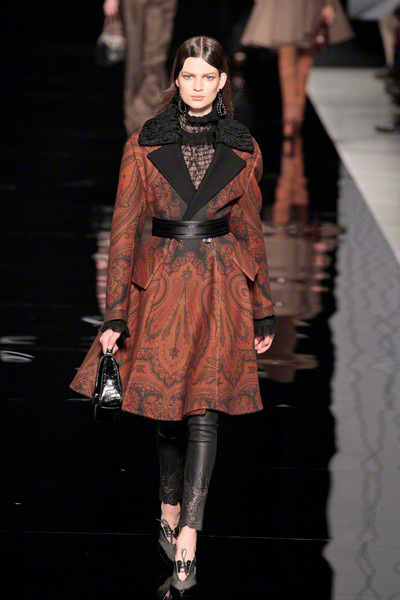 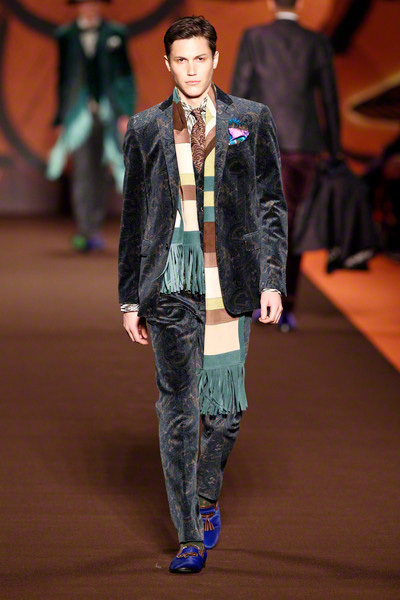 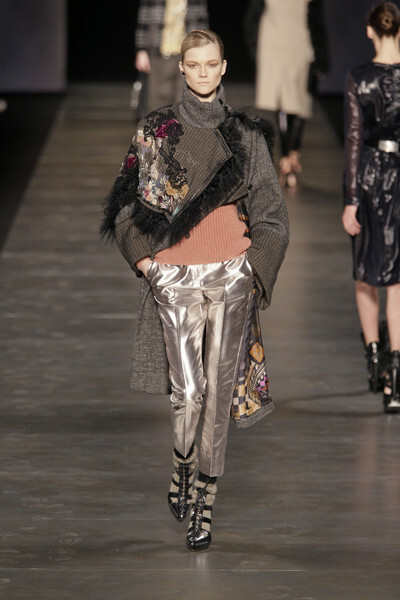 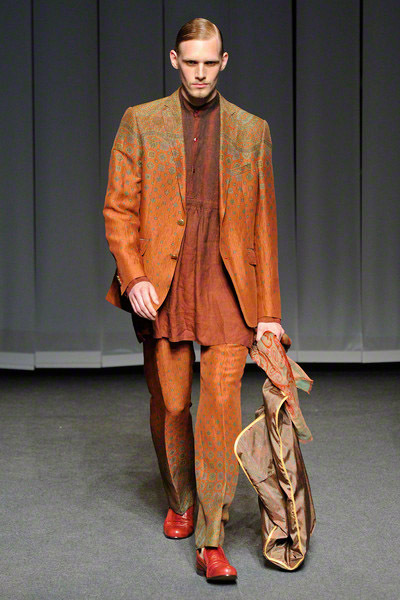 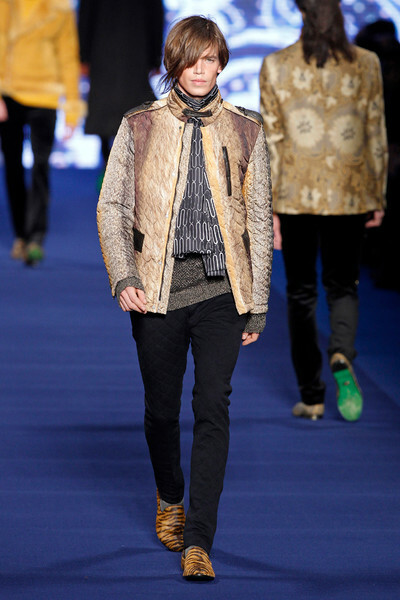 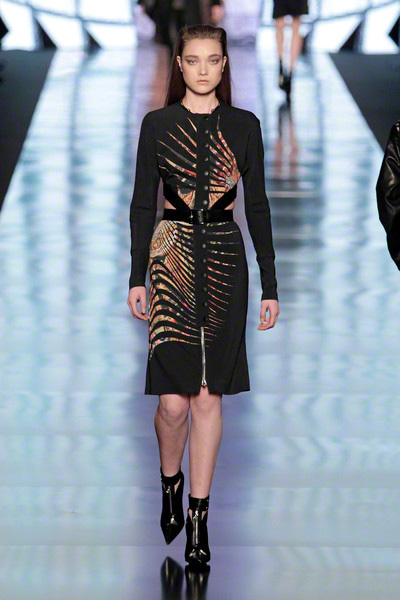 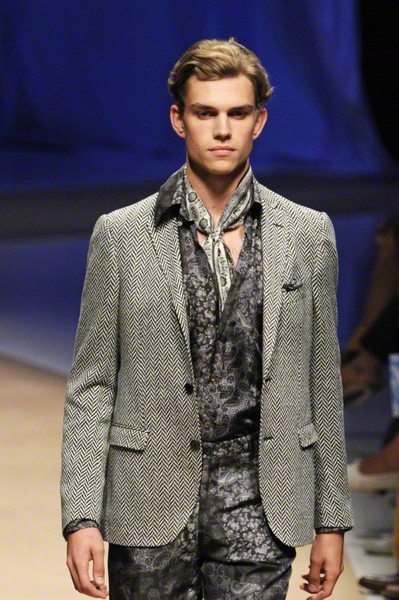 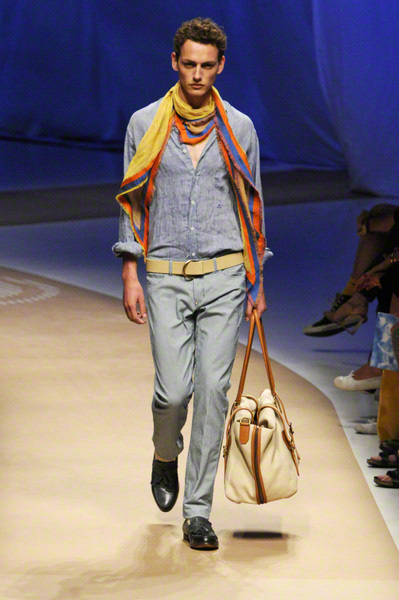 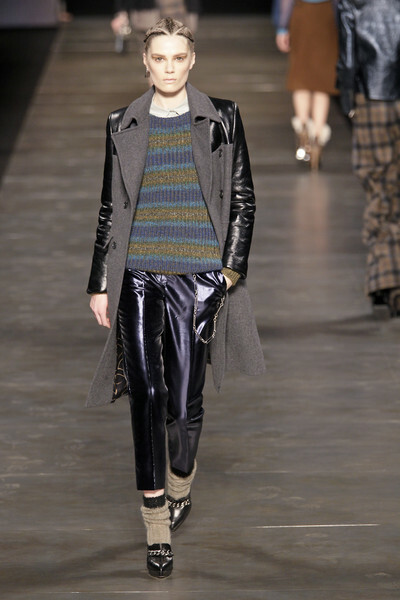 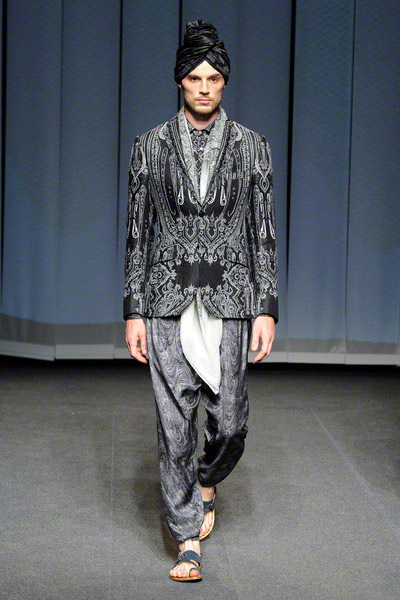 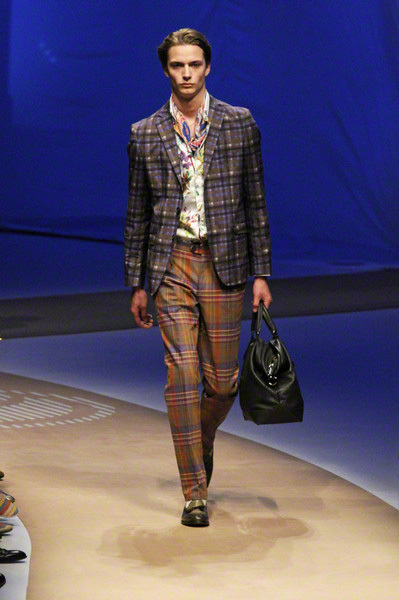 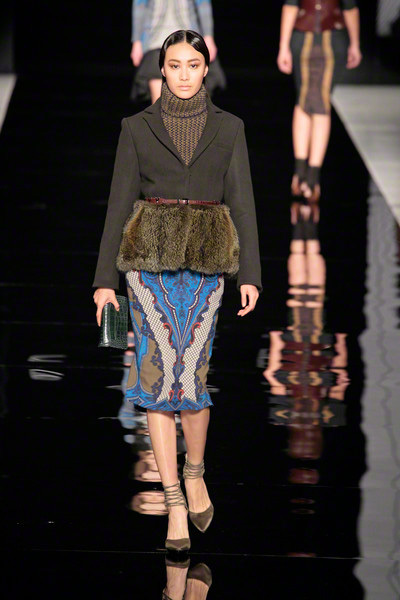 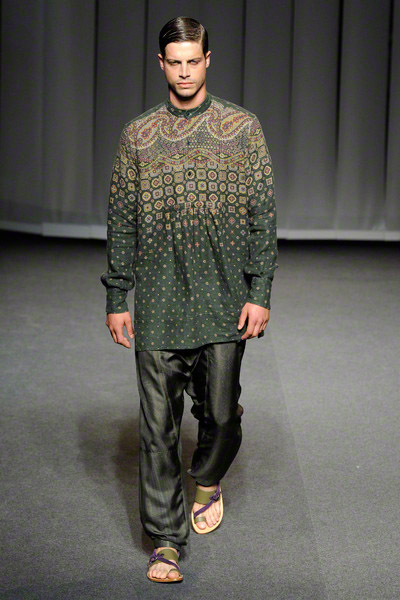 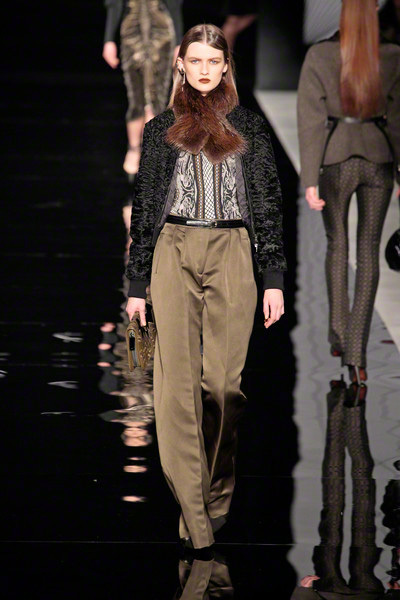 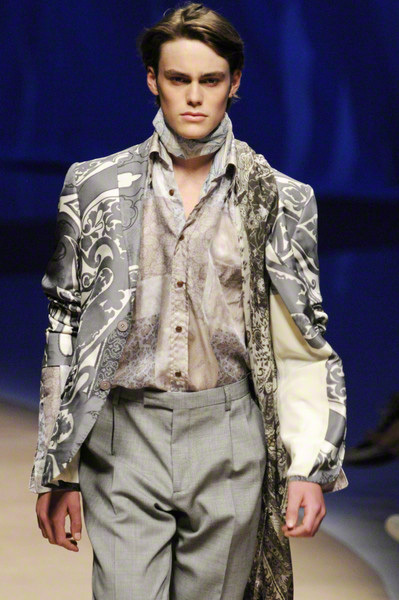 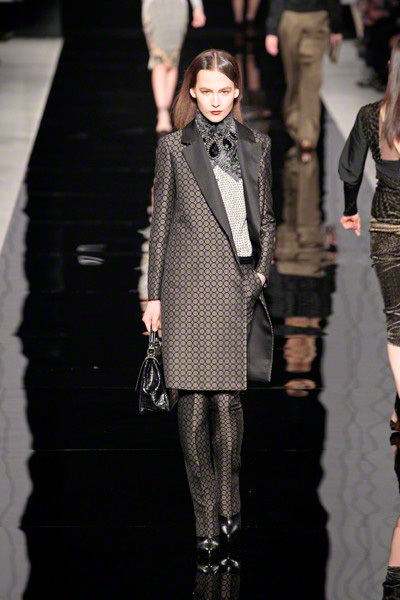 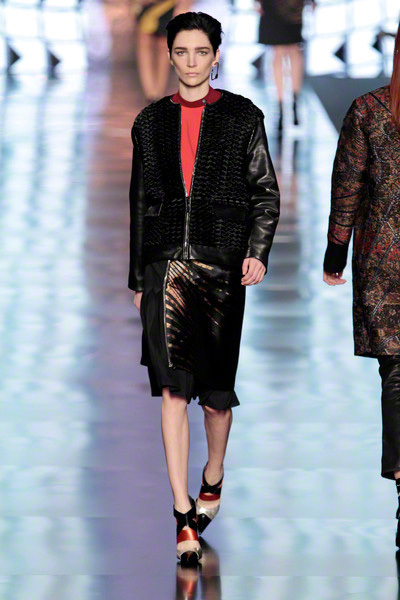 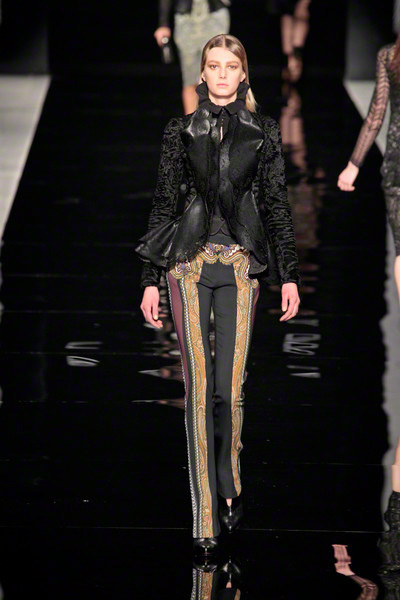 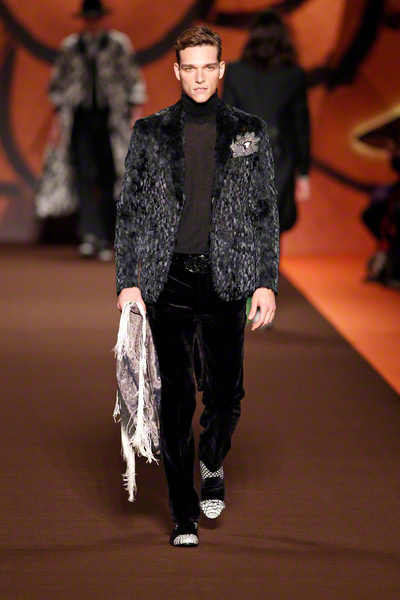 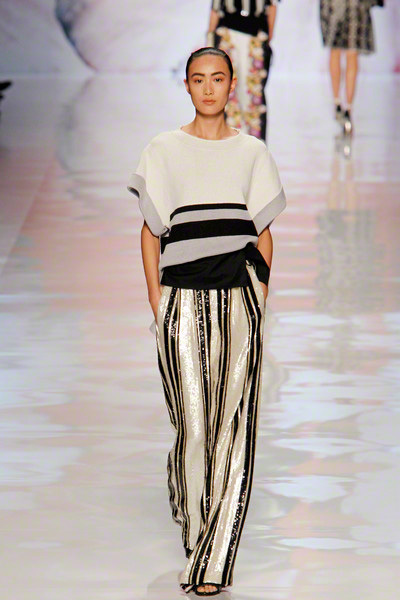 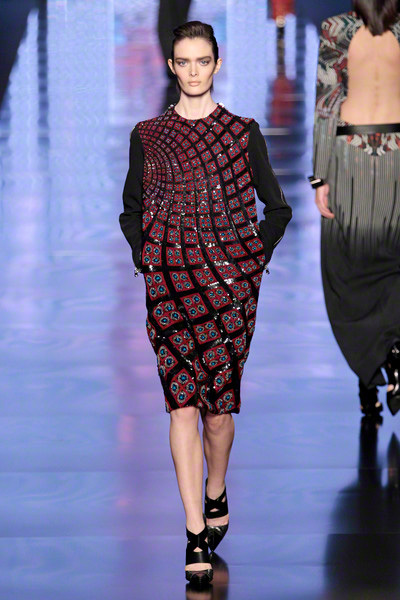 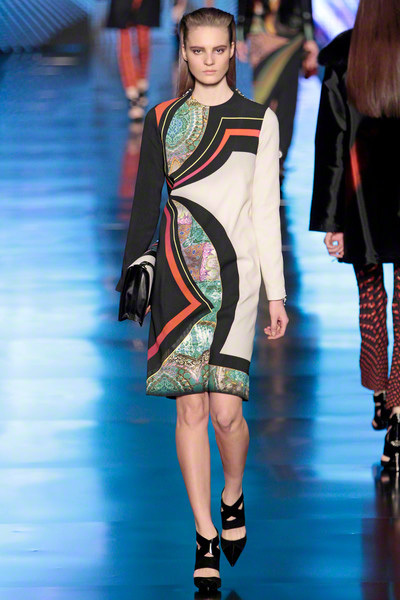 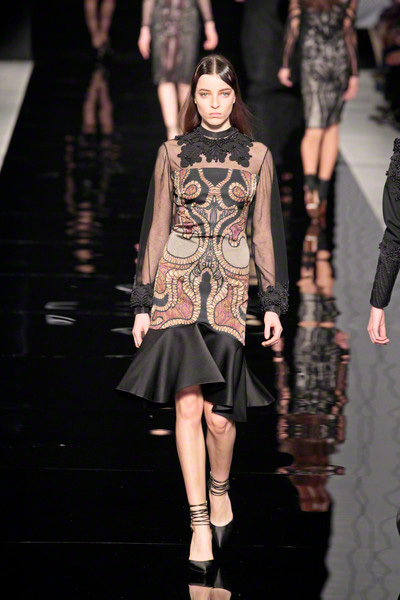 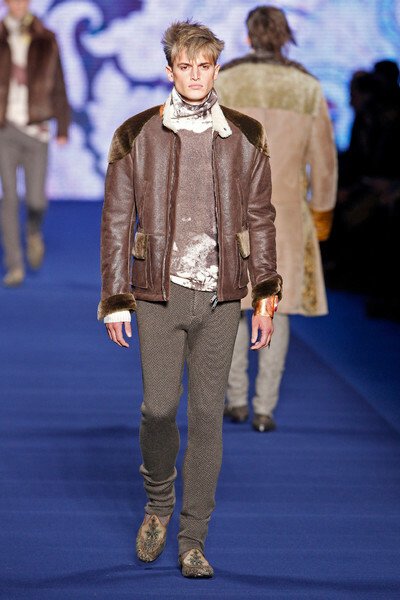 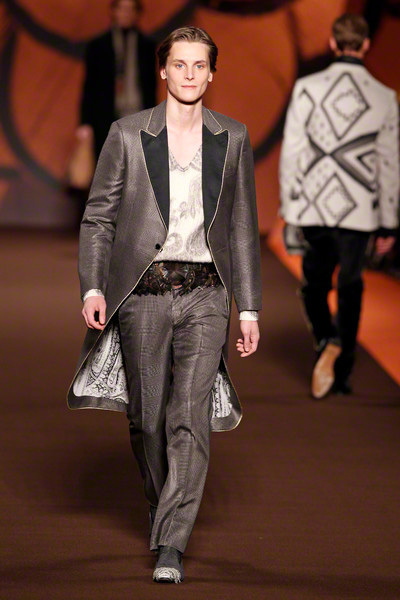 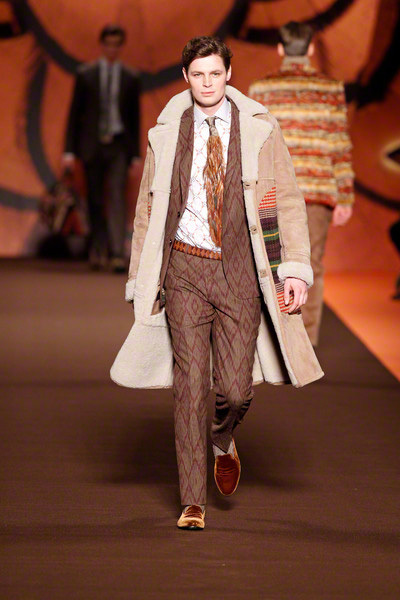 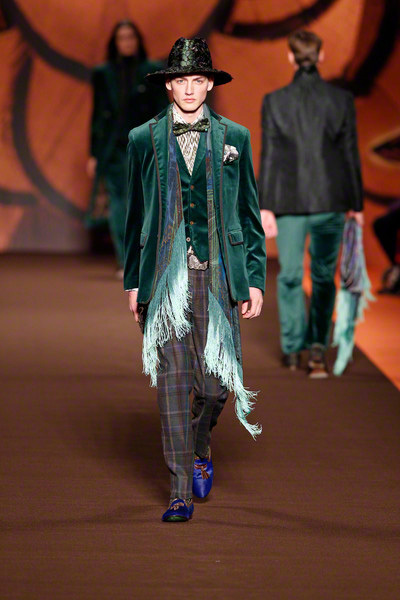 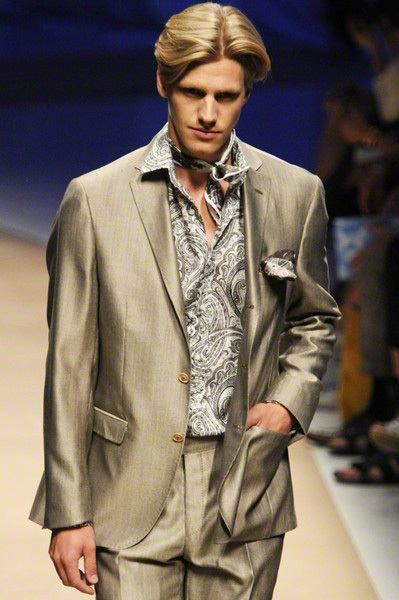 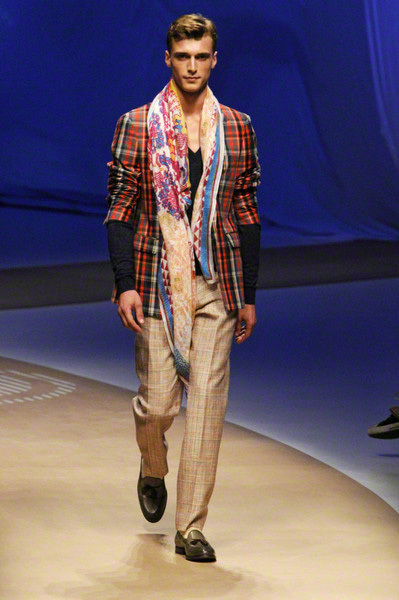 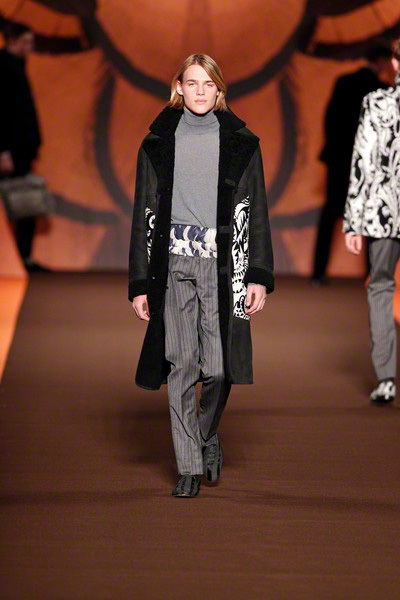 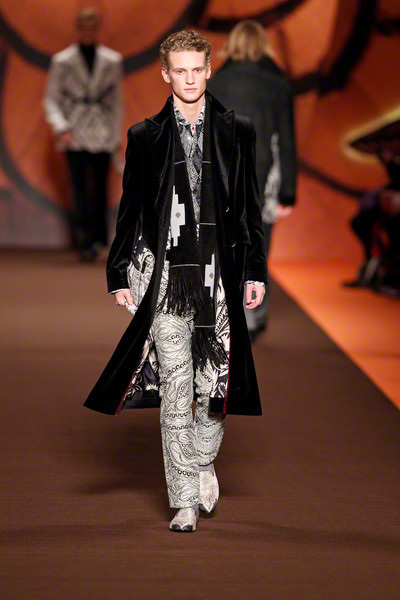 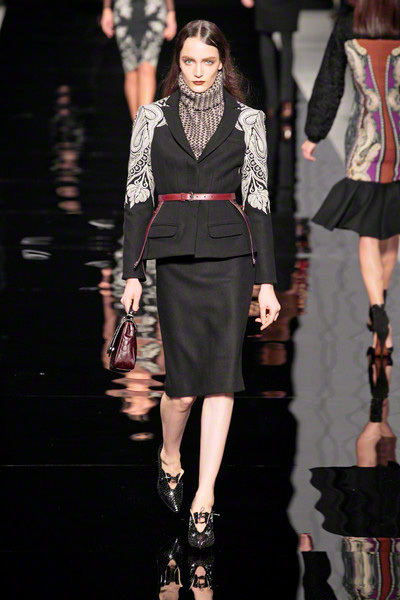 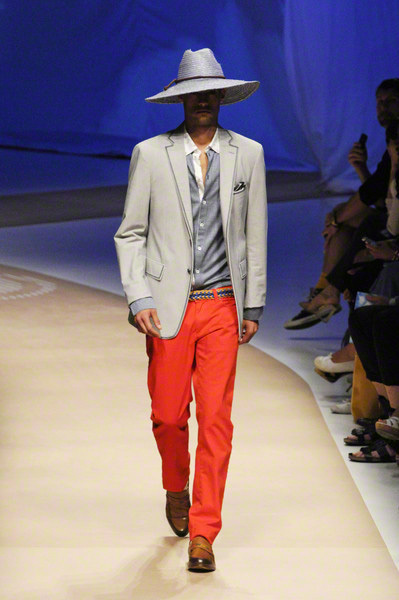 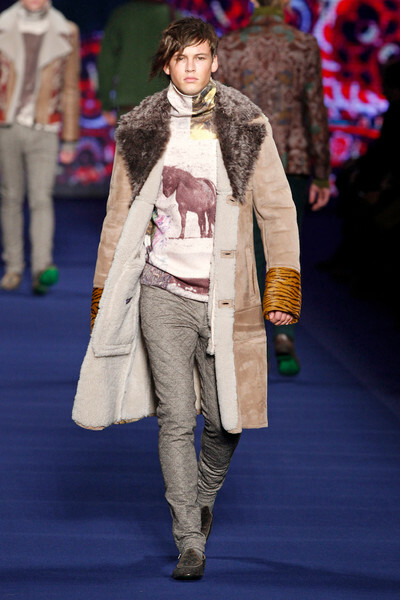 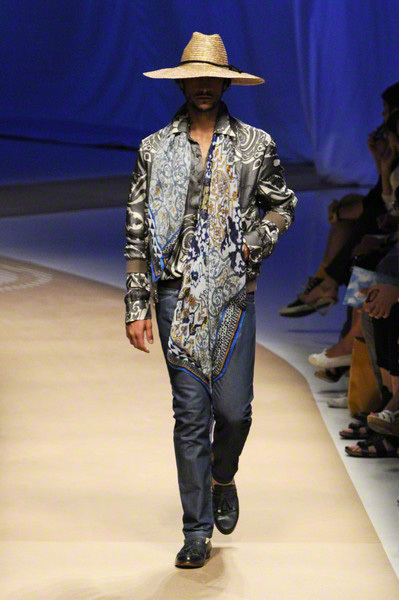 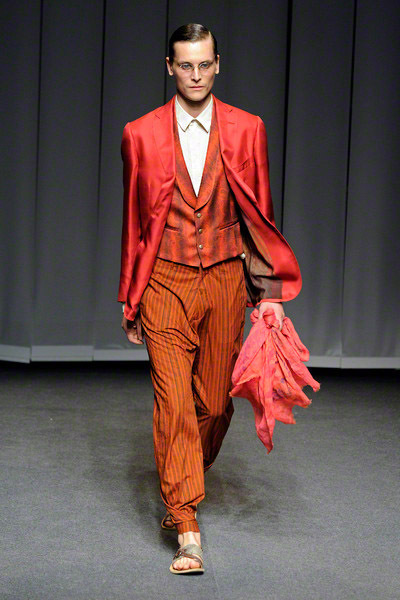 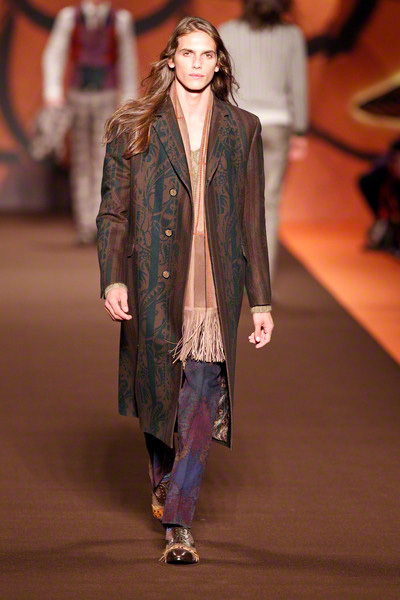 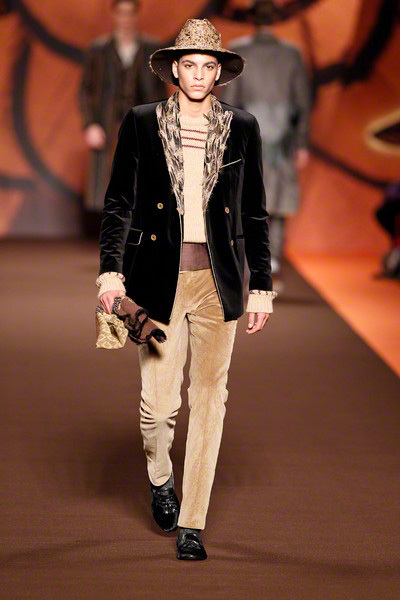 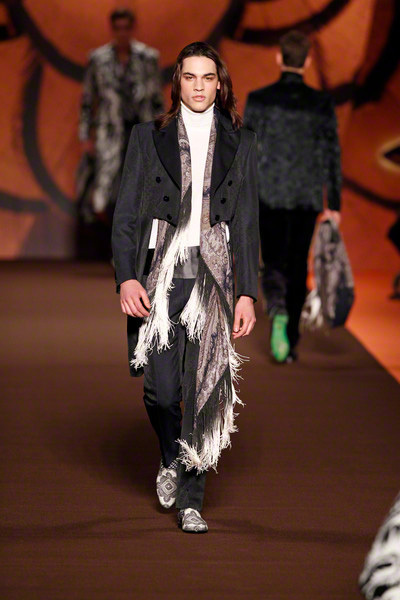 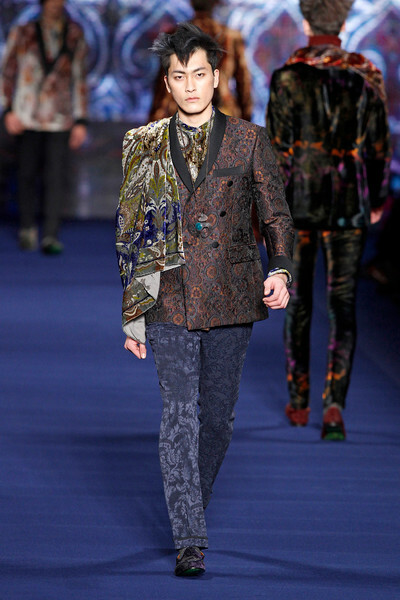 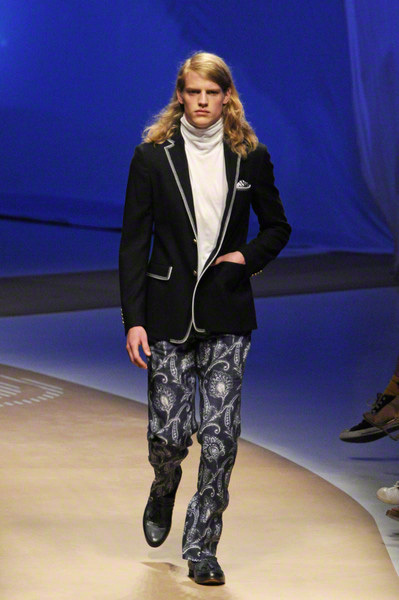 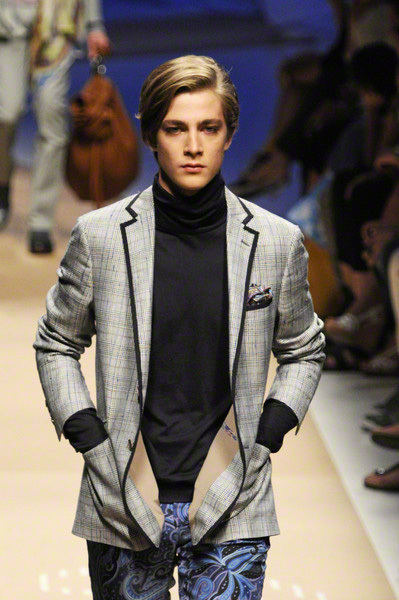 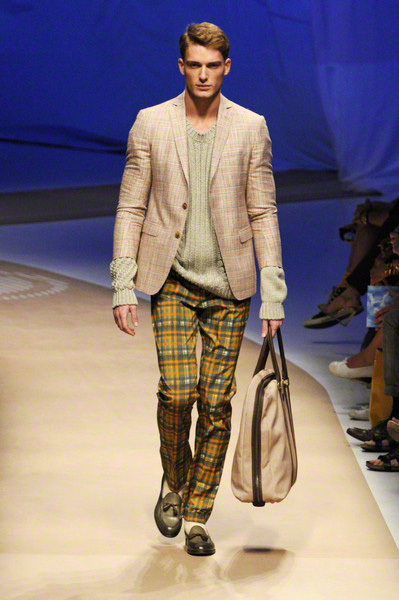 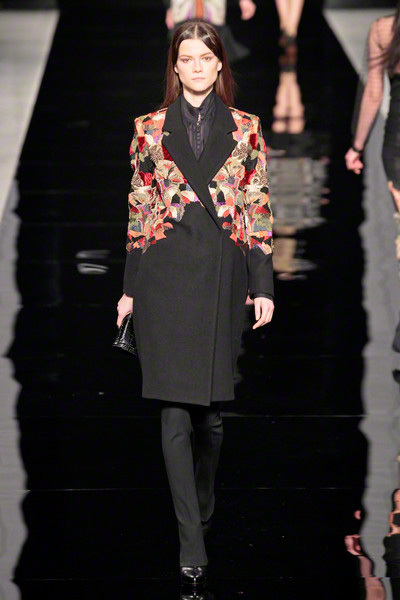 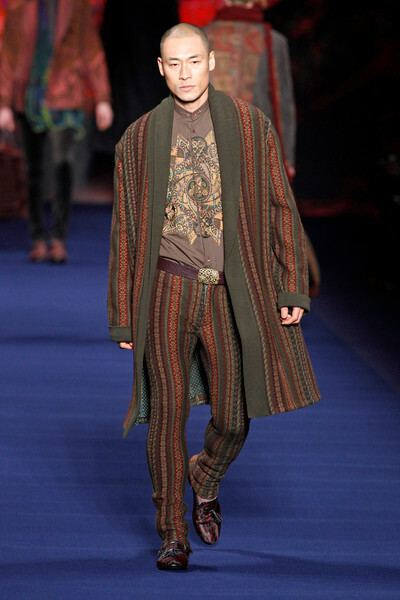 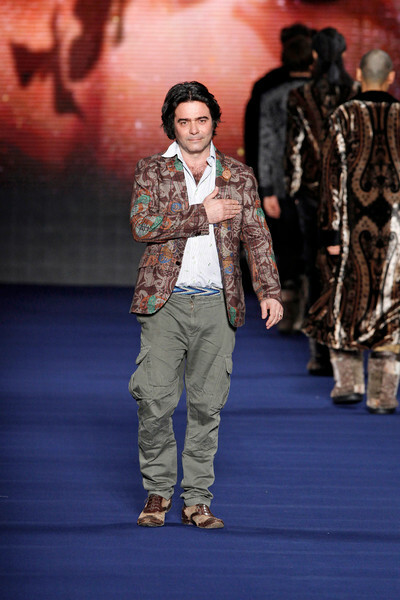 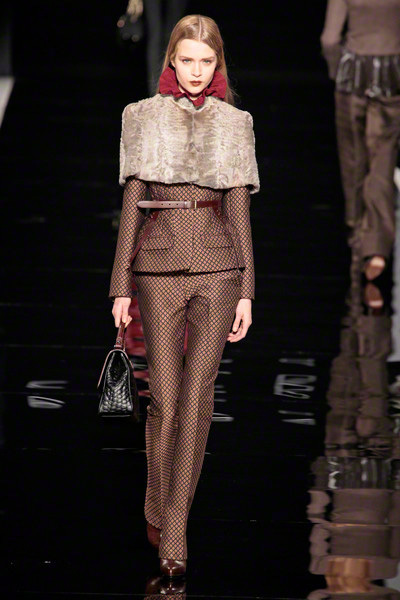 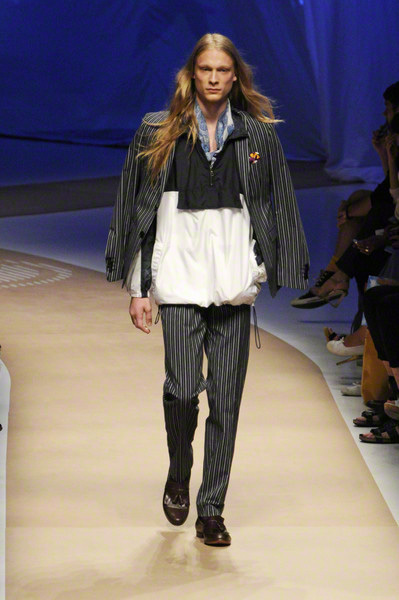 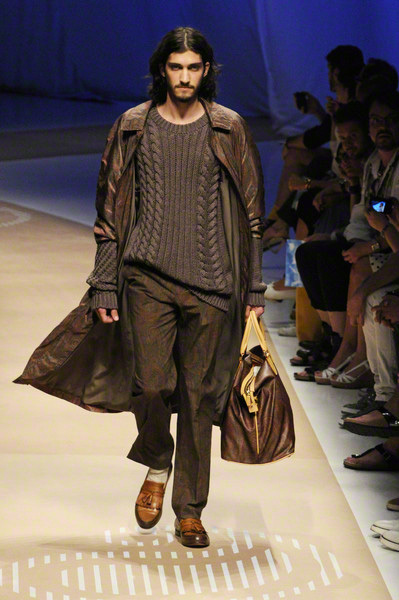 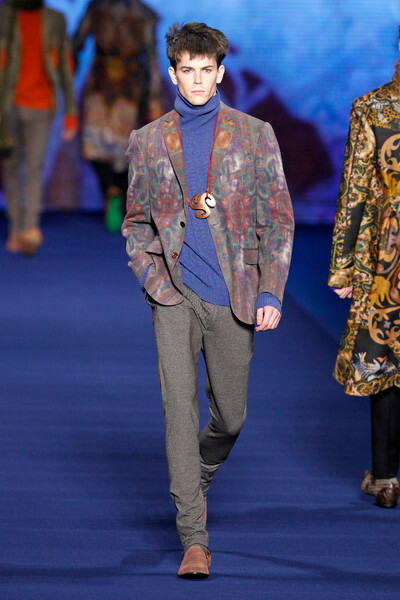 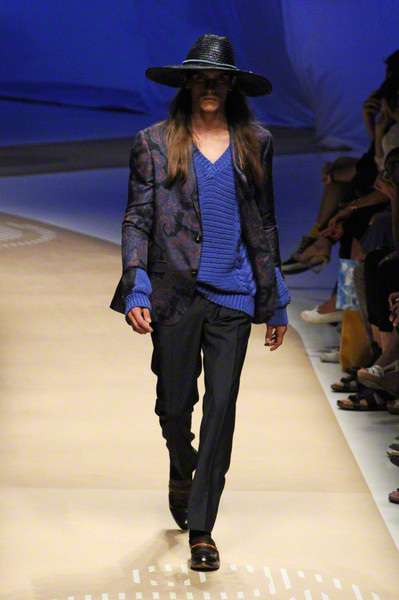 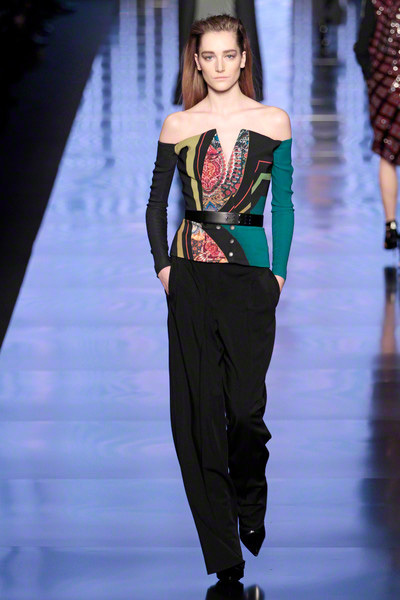 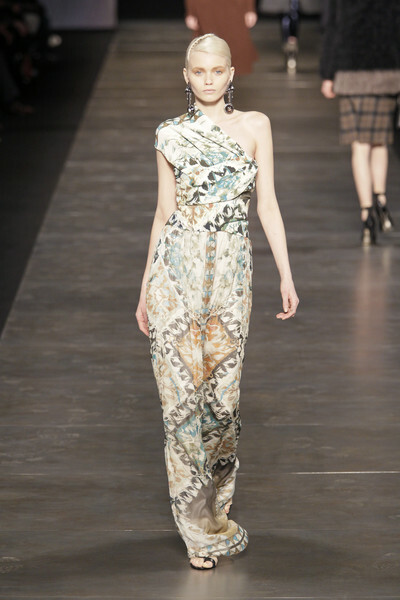 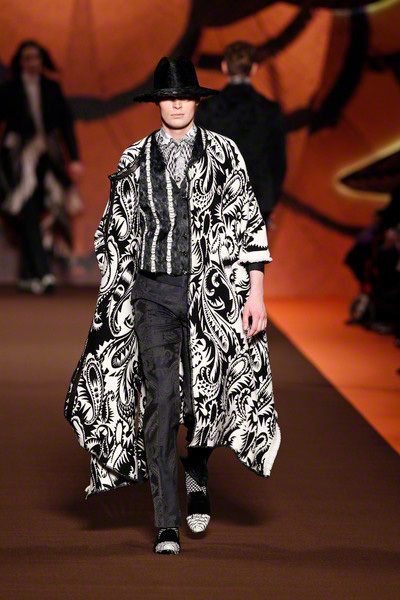 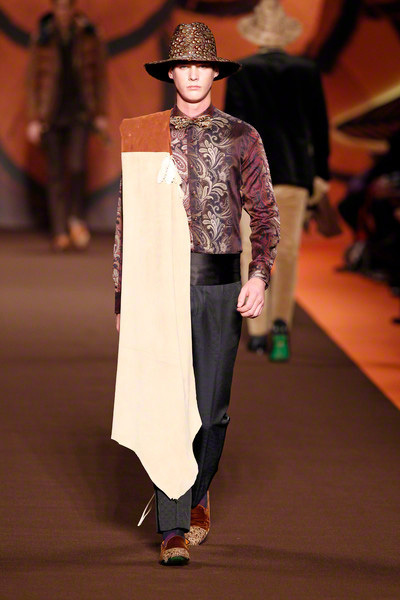 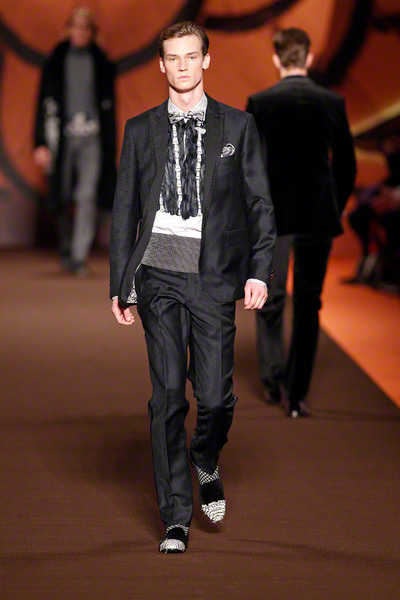 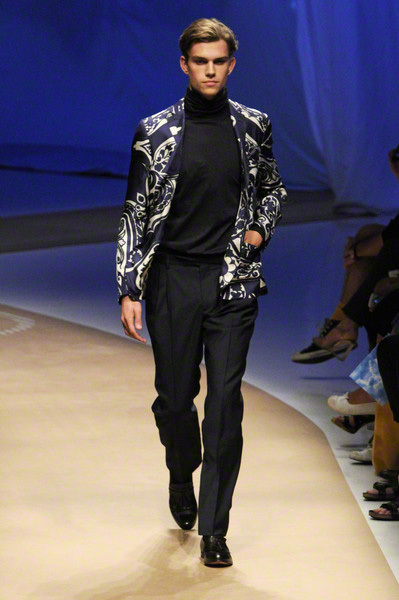 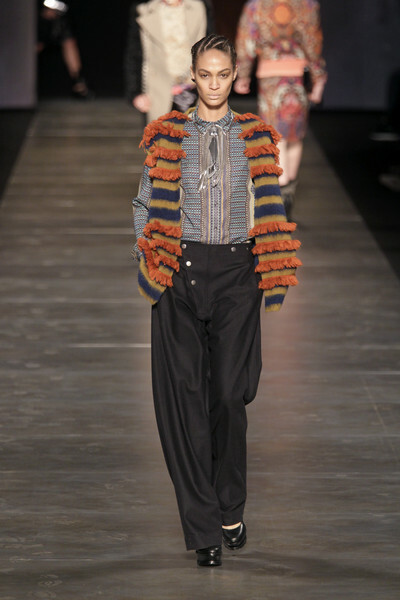 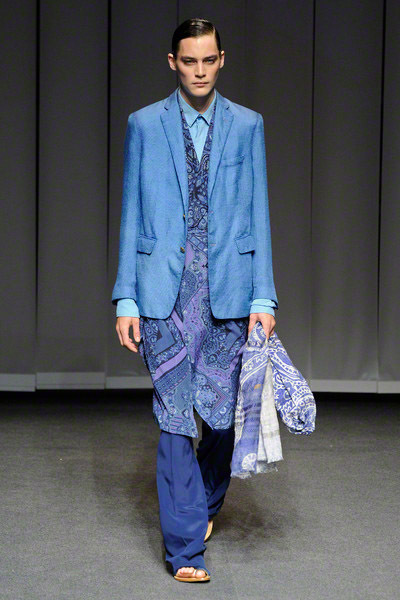 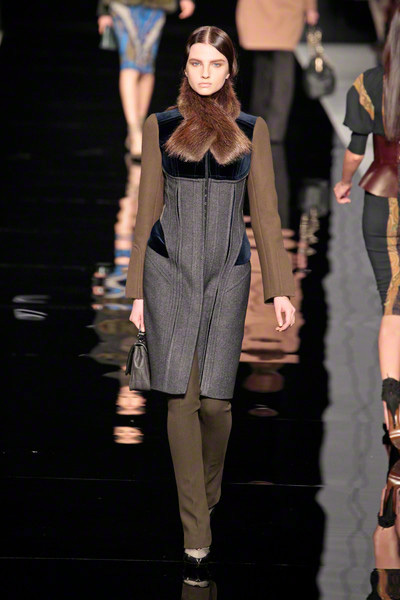 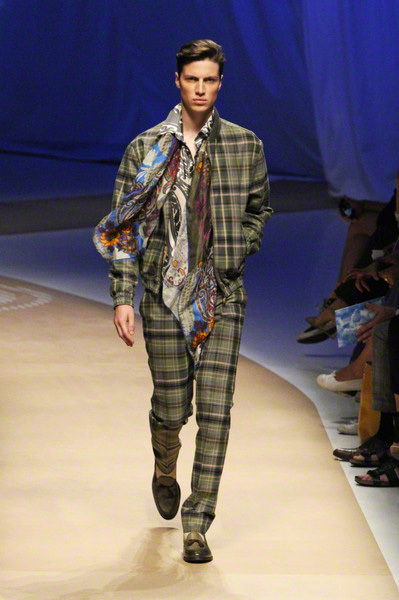 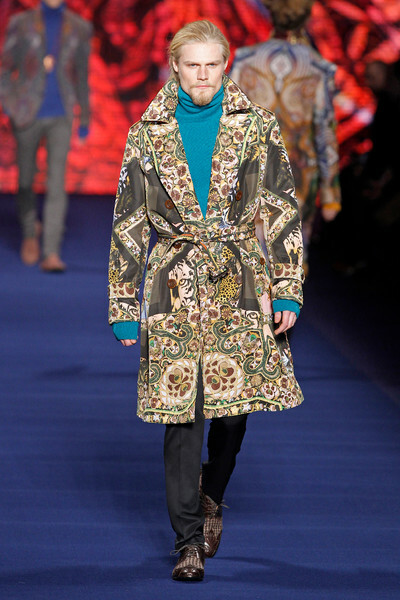 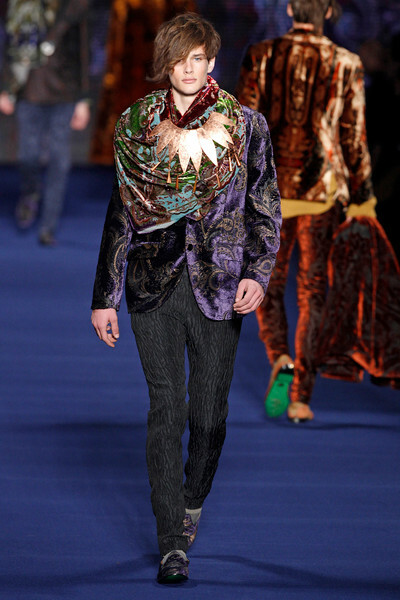 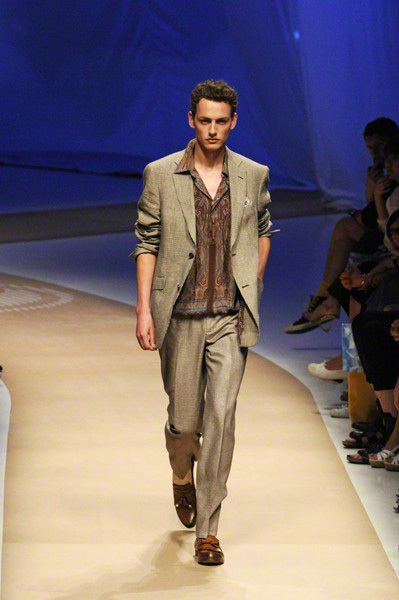 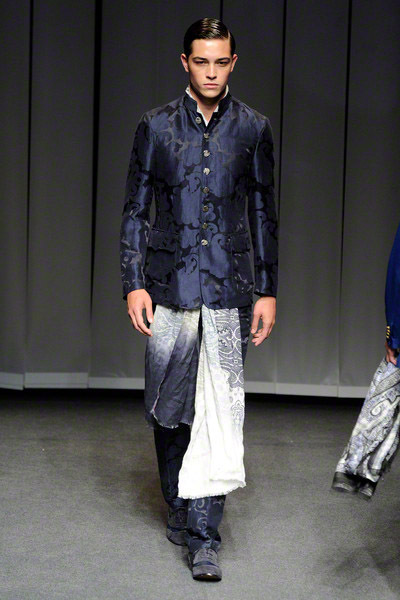 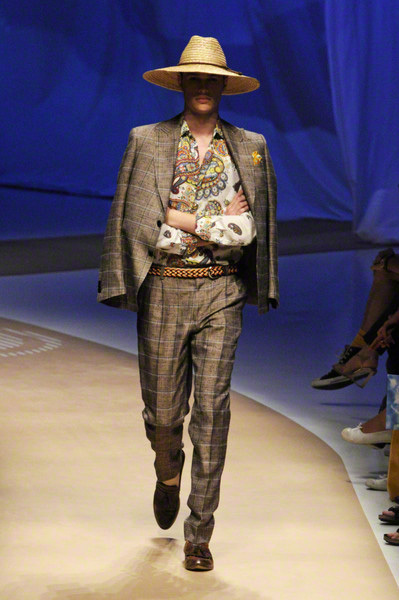 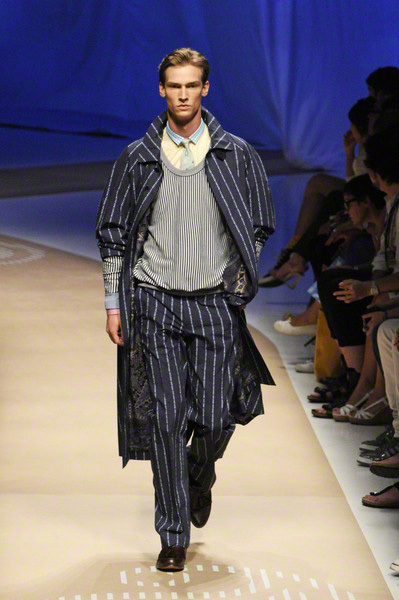 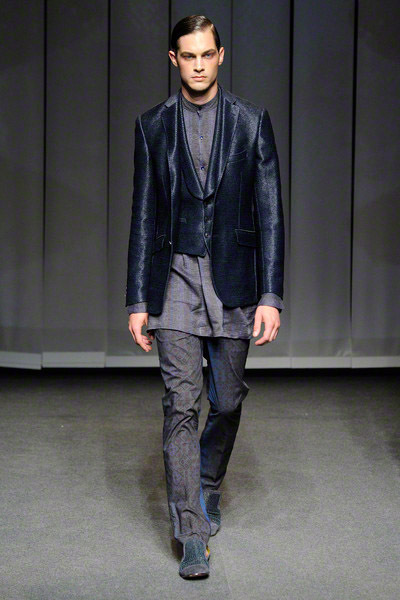 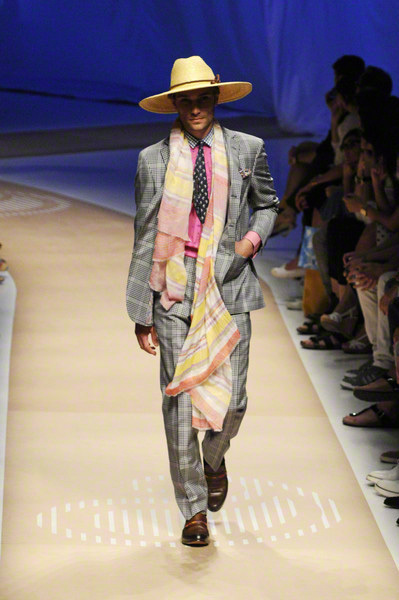 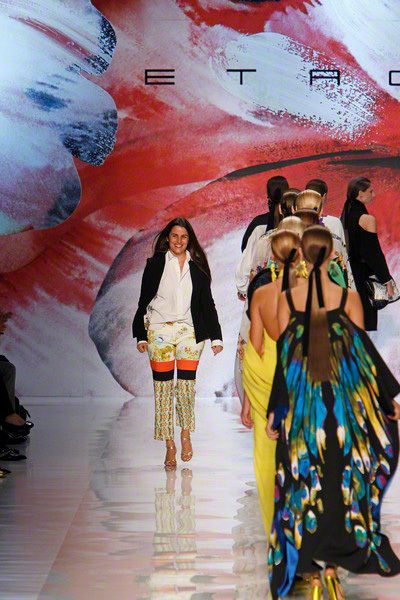 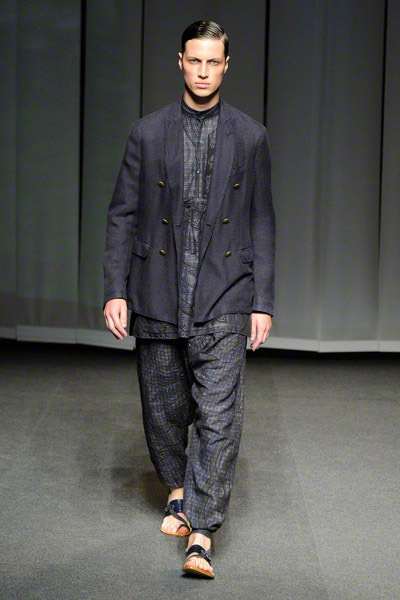 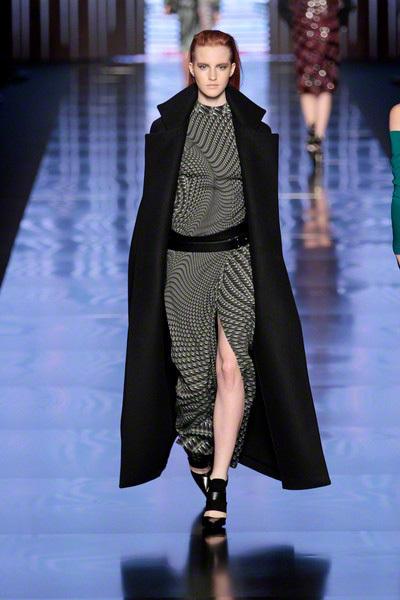 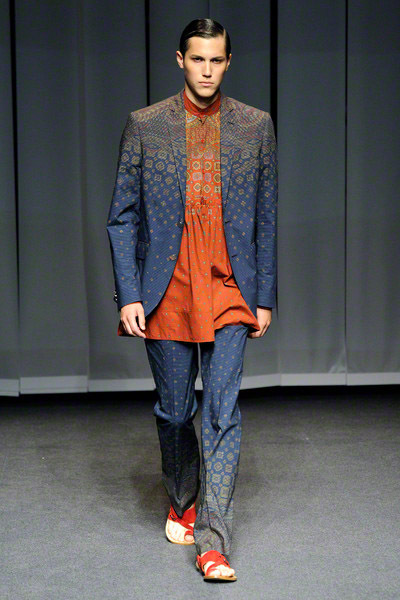 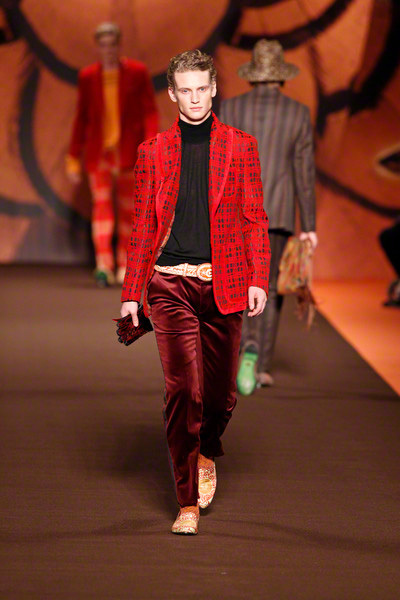 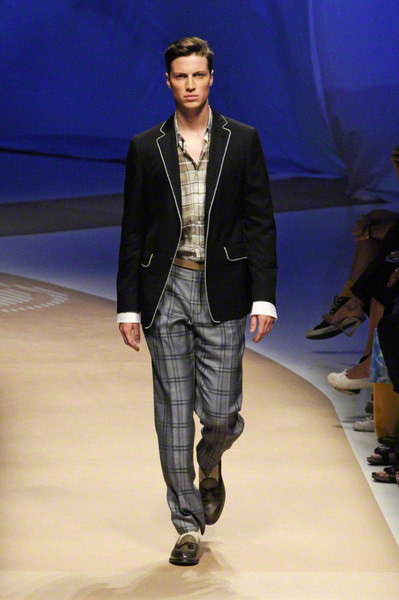 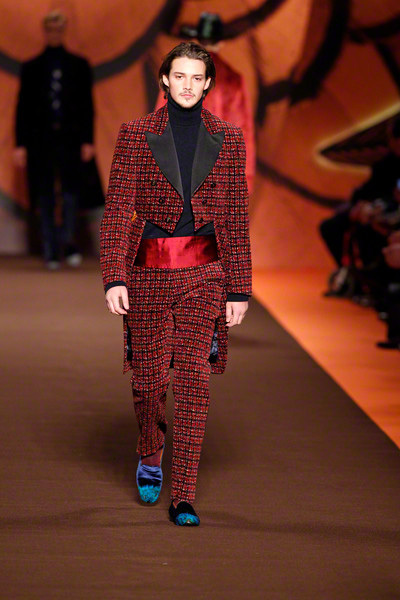 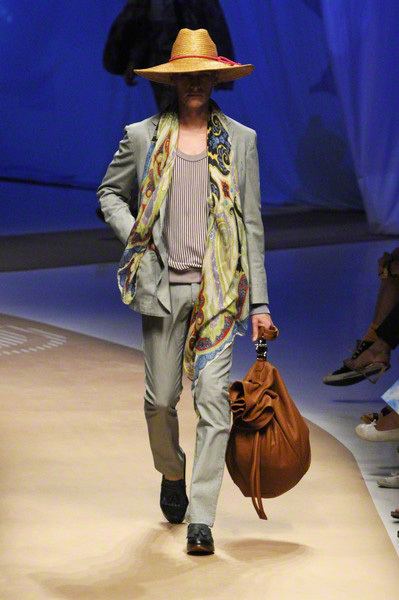 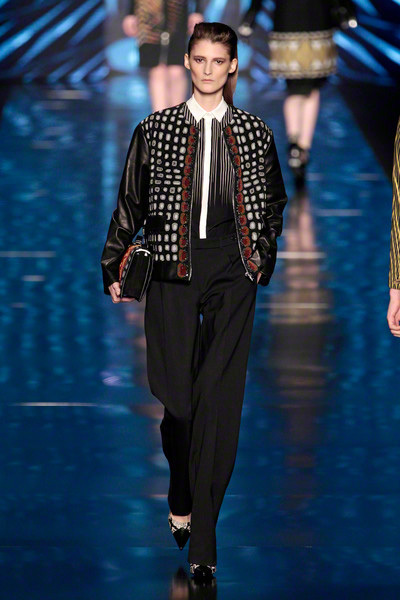 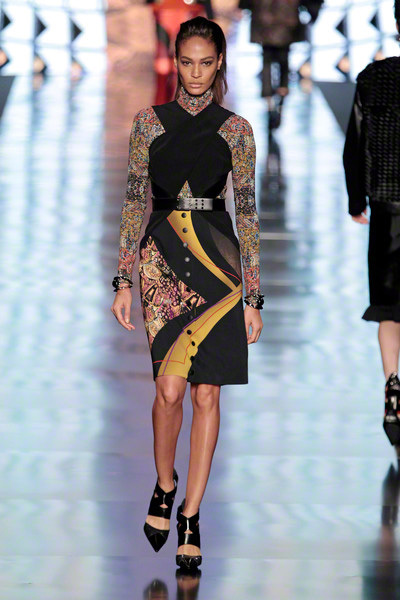 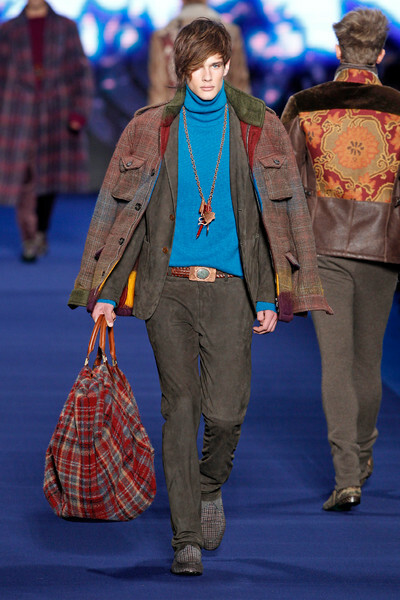 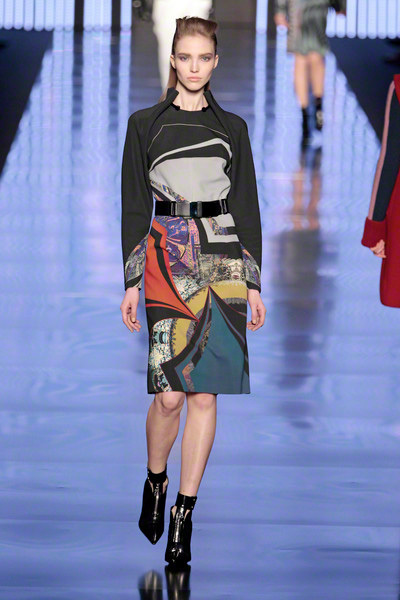 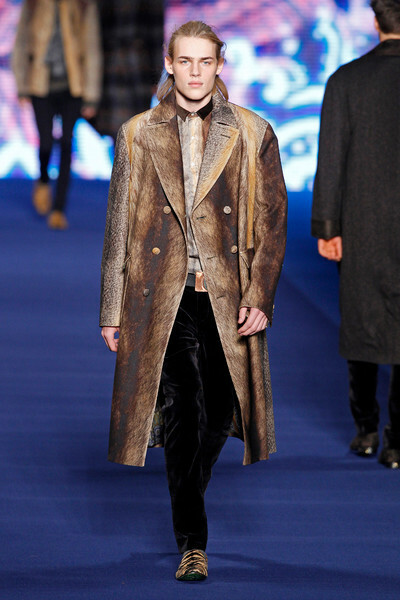 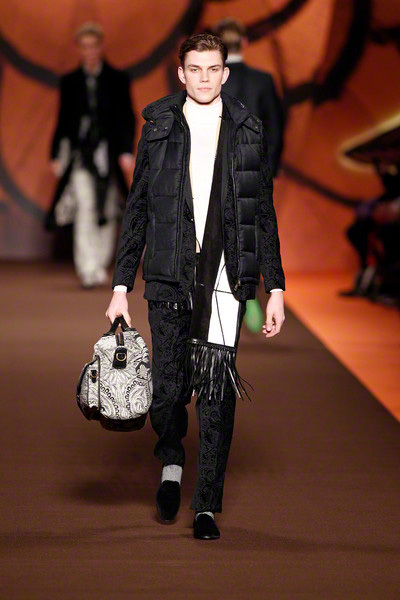 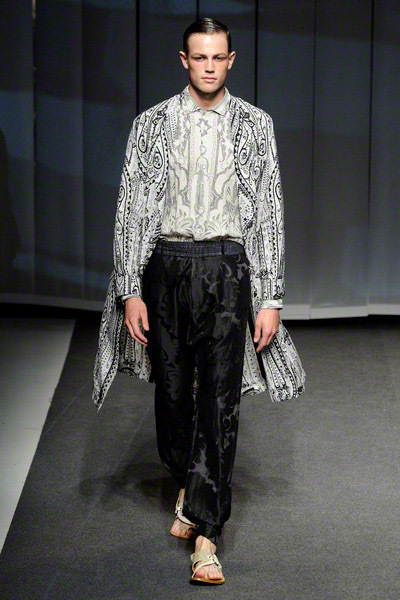 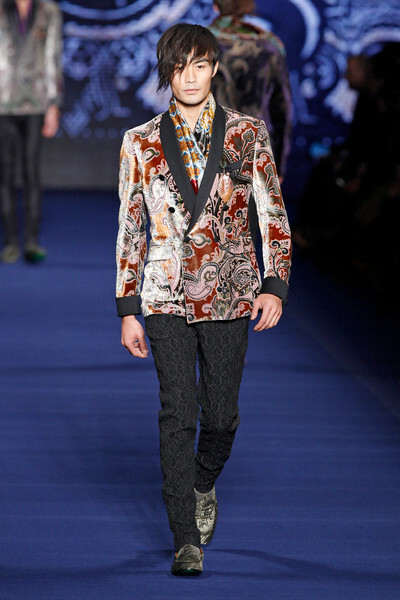 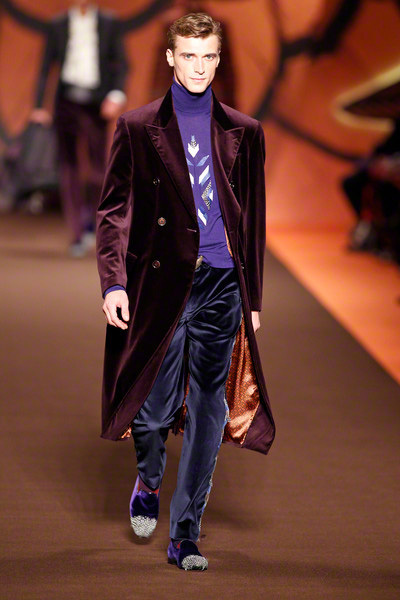 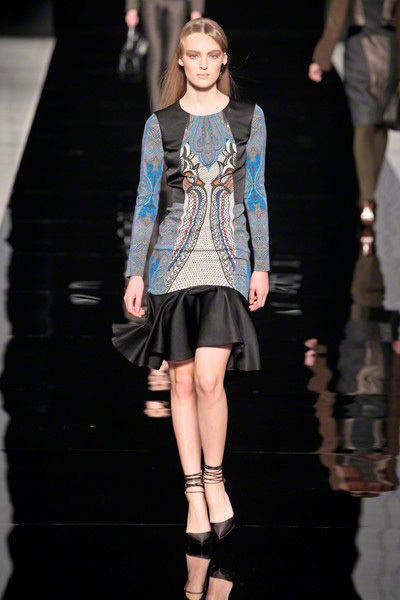 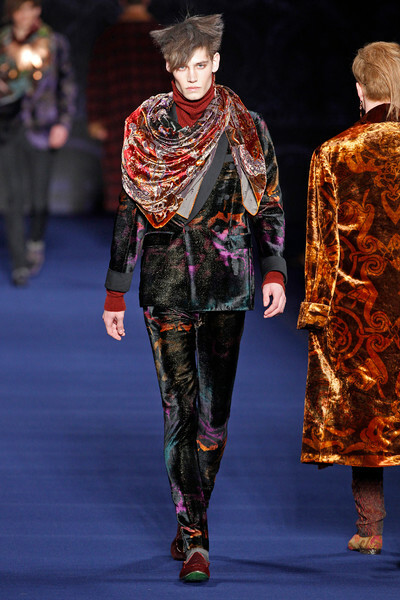 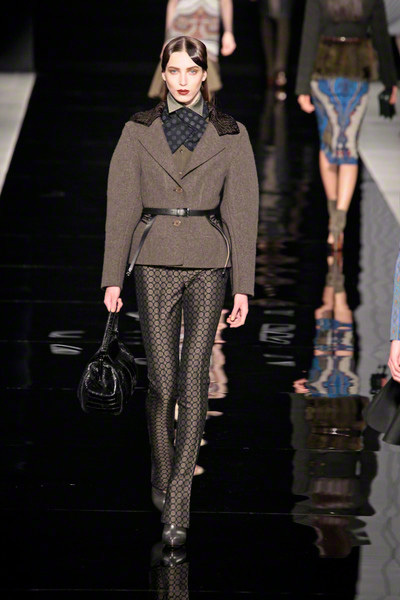 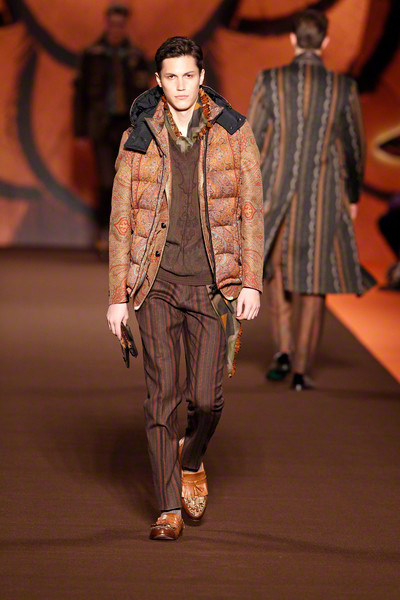 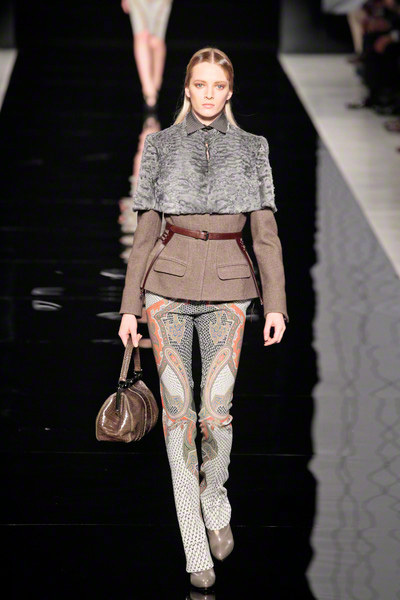 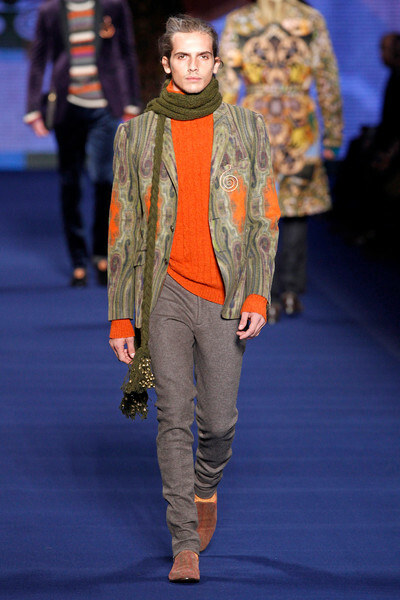 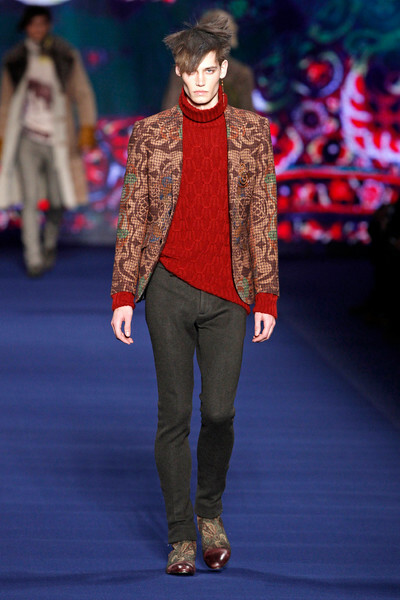 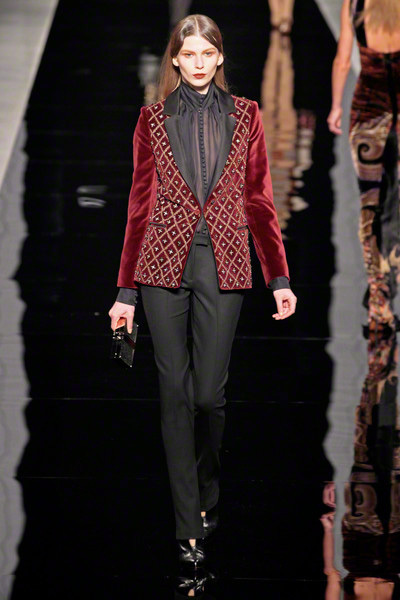 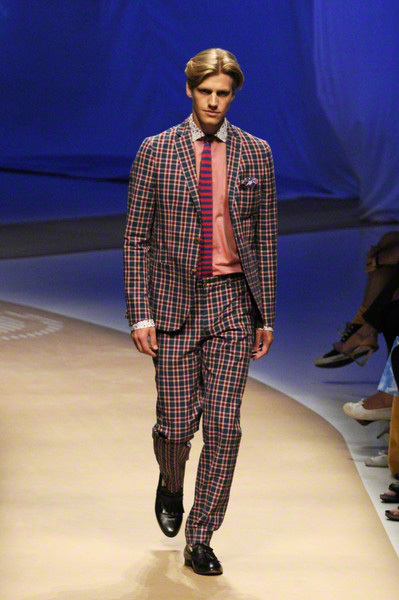 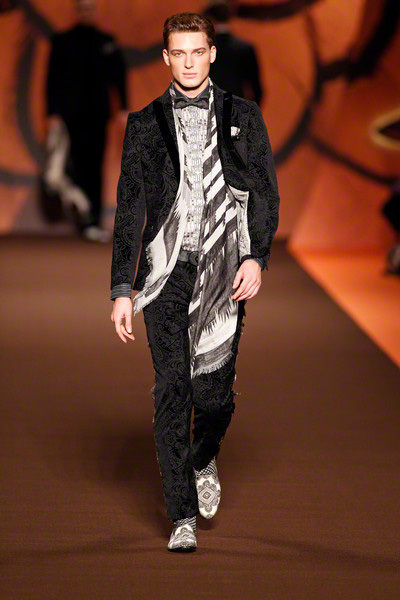 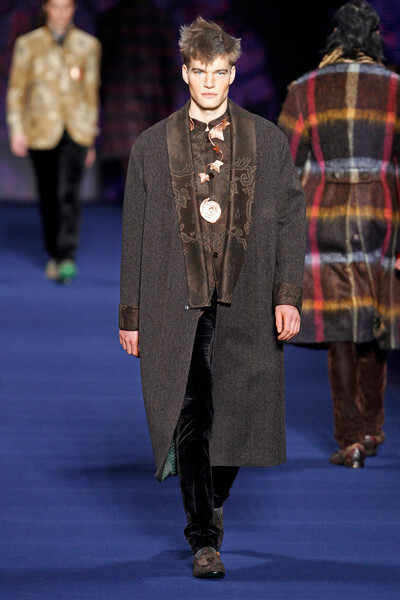 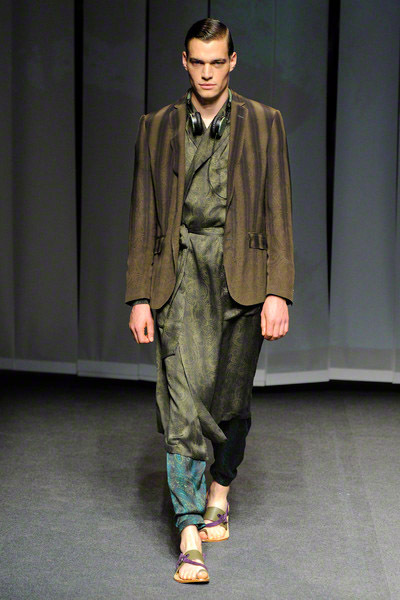 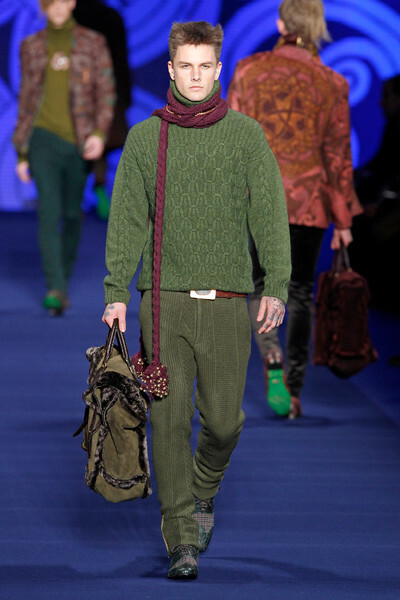 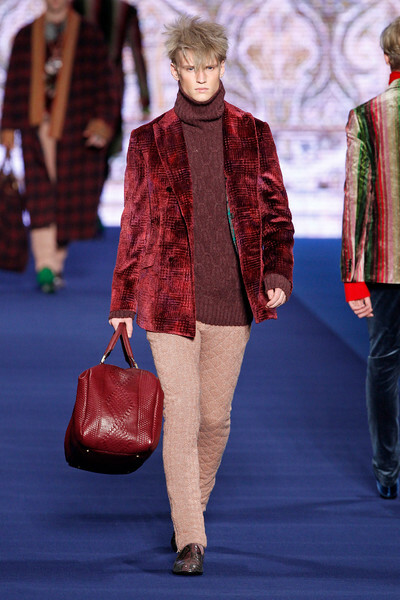 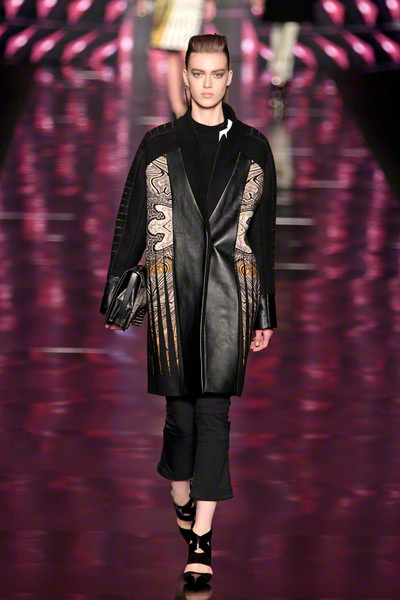 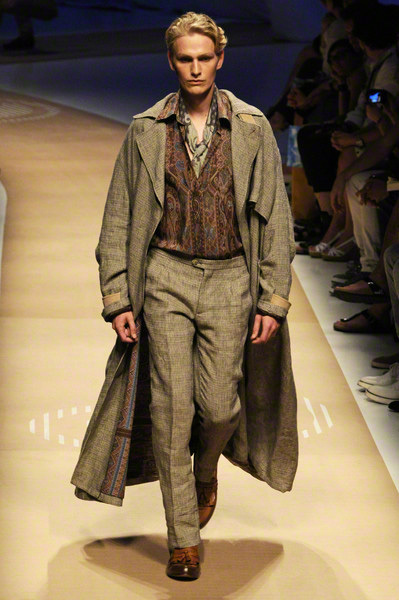 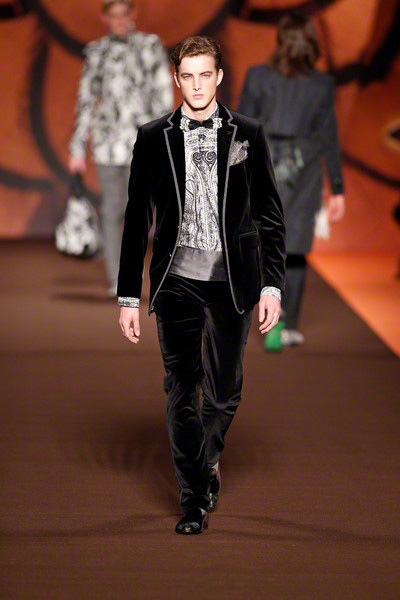 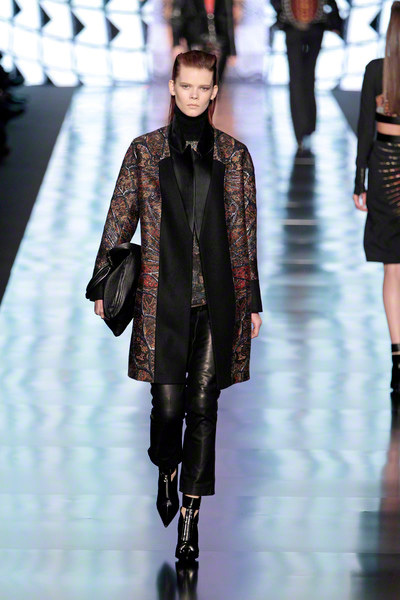 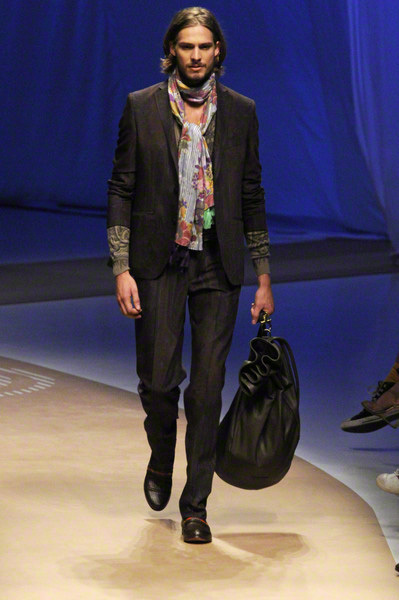 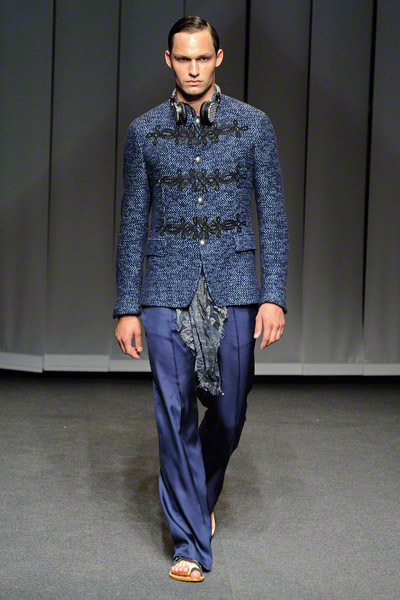 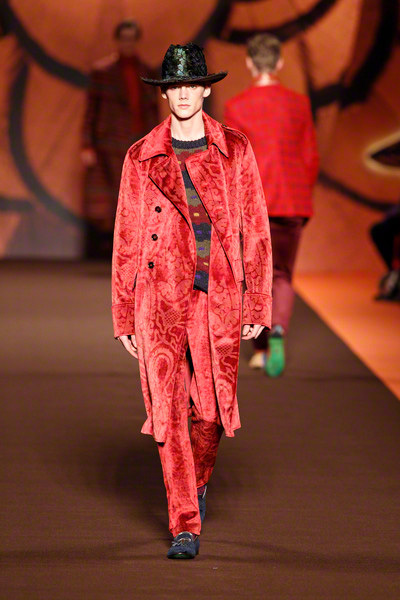 Kean Etro brought together rich colors, heavy fabrics, ethnic prints and an out of the box way of styling. 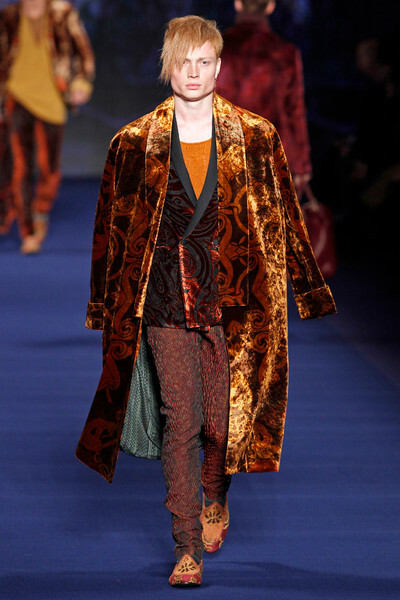 His long haired men were filling the room with good vibrations inspired by ‘the Hindu and Buddhist faiths, the never-ending circle of life and Celtic symbols.’ XXL bathrobe-like coats with checks and stripes might be very unwearable in real life, they proved Kean dares to step away from the regular paisley printed designs and try something new. 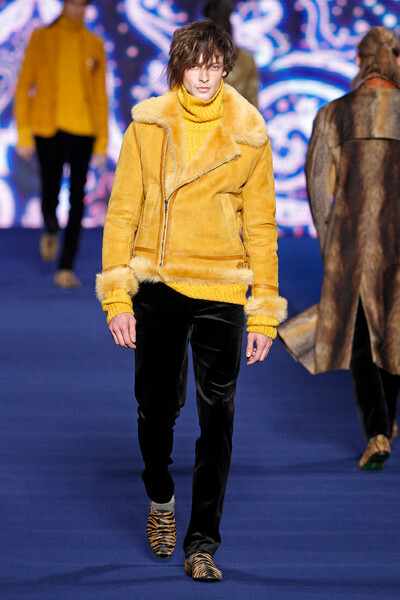 We’re curious to see where (and if) the velvet suits and fur boots will pop up. 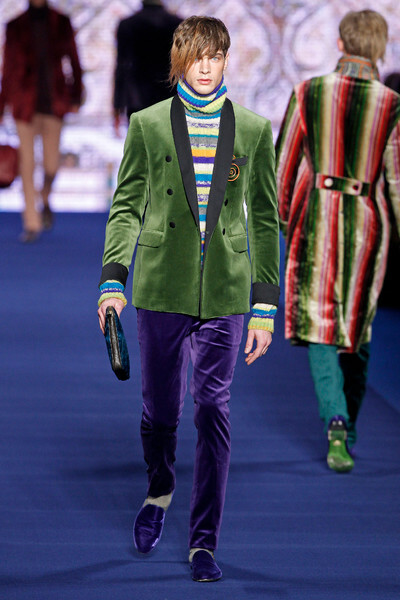 At least the collection’s vibrant color pallet will look good on anybody. 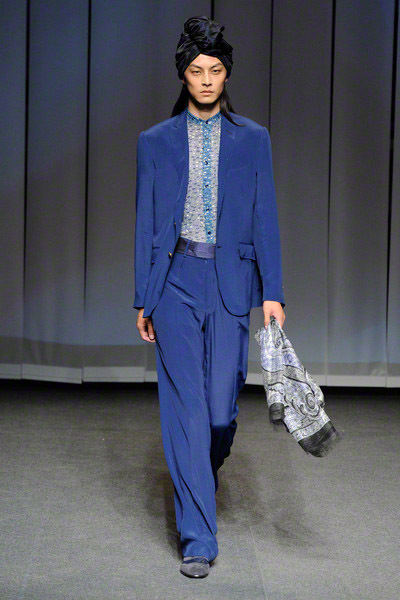 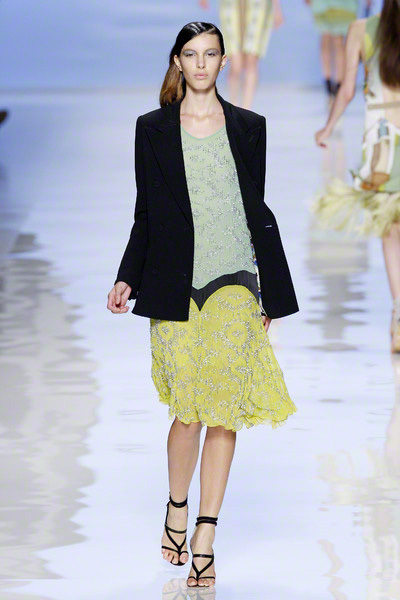 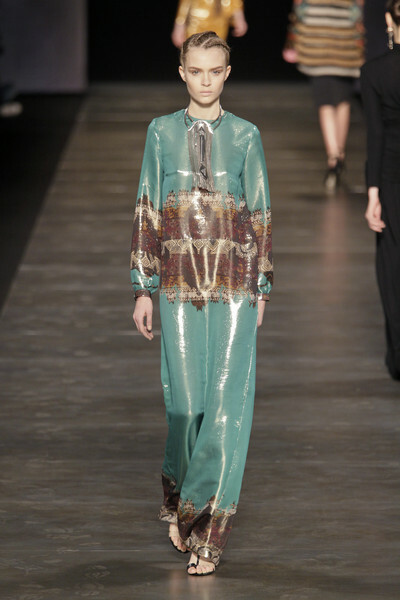 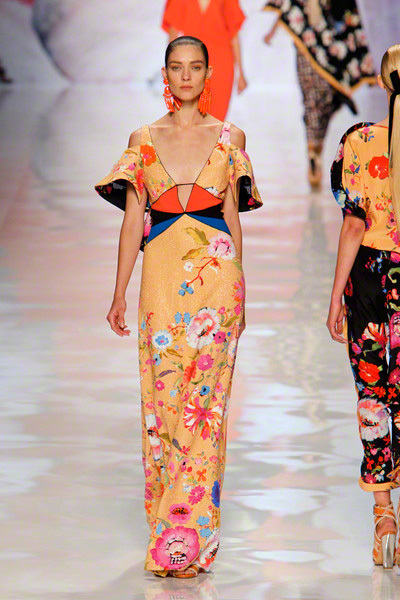 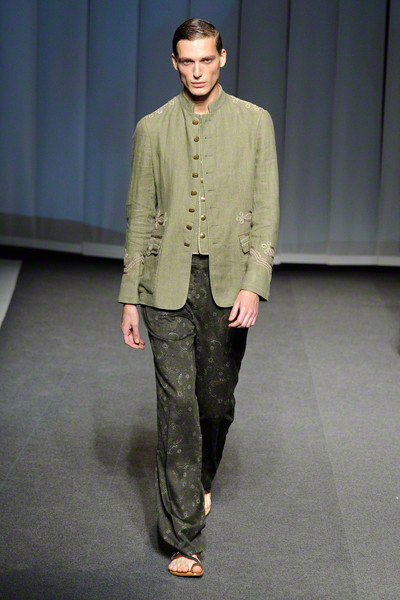 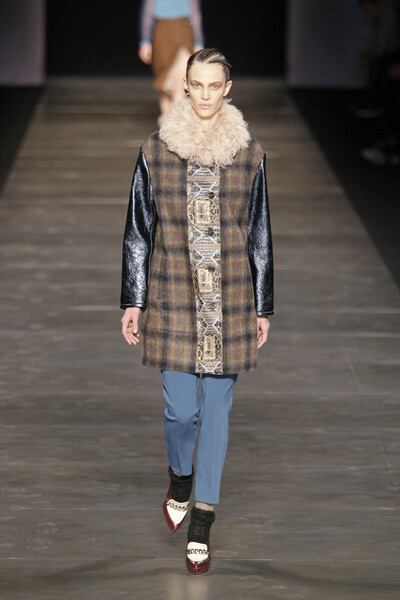 Today Etro started with a same Eastern inspired vibe Miuccia Prada had ended her show with yesterday. 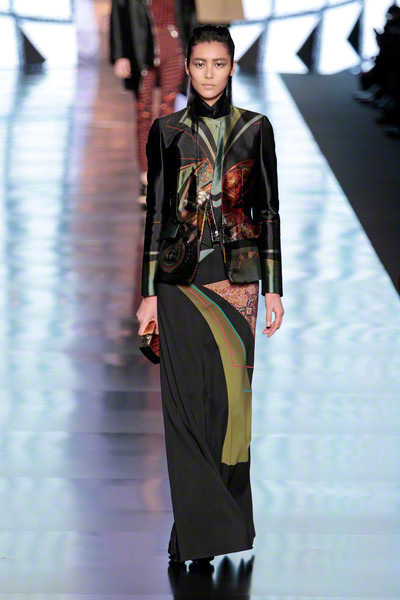 At Etro too we spotted kimono like designs, antisymmetric dresses, wide sleeves, attention grabbing belts and Japanese floral prints. 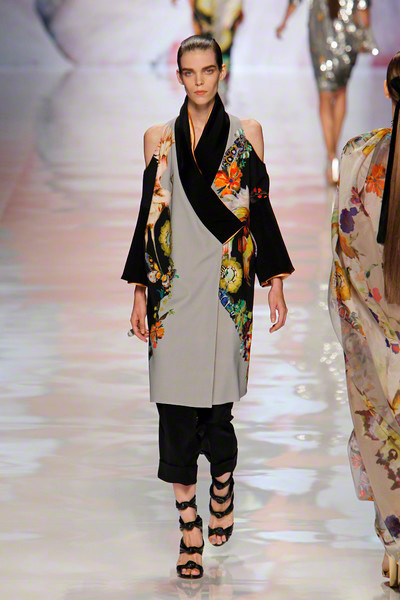 No Geisha shoes (and socks!) 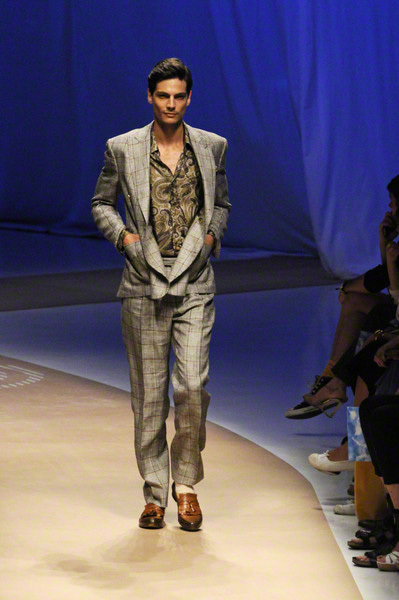 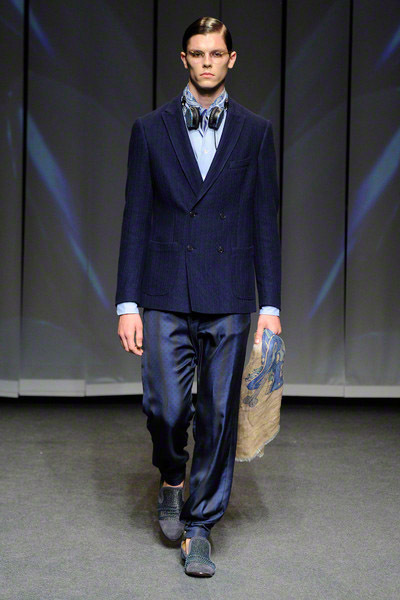 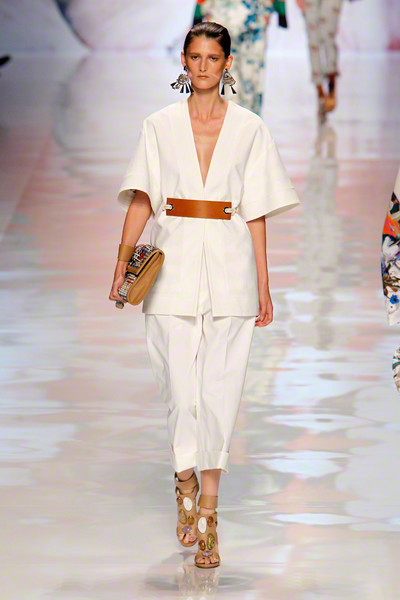 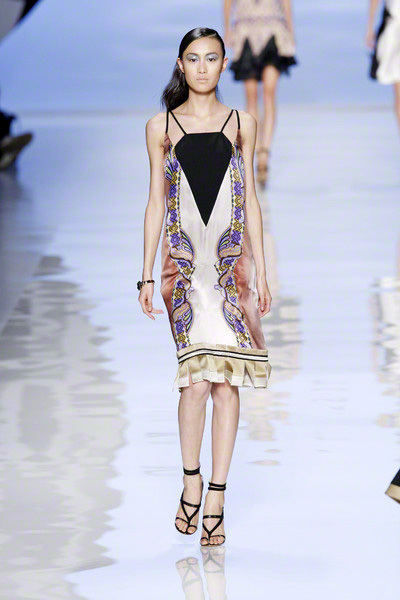 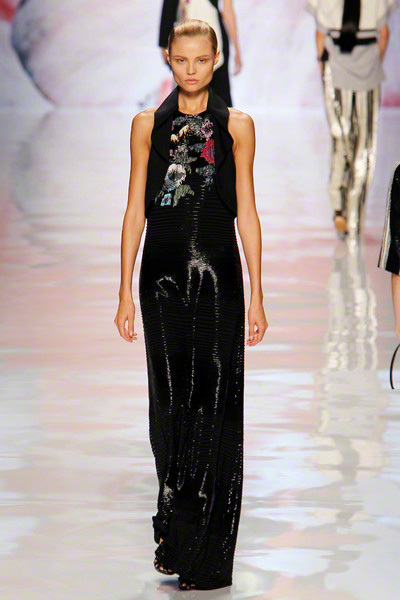 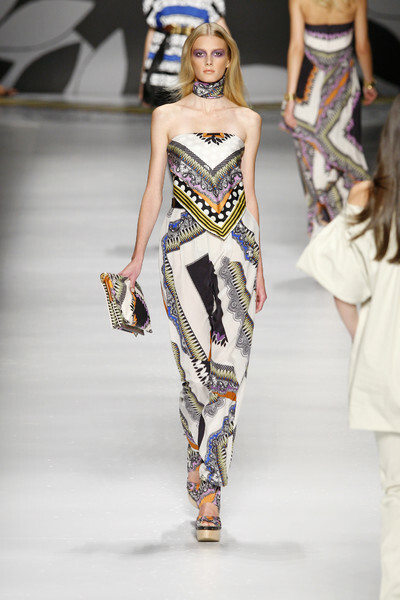 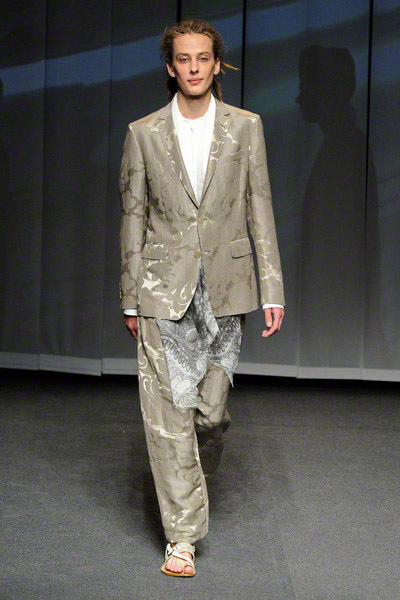 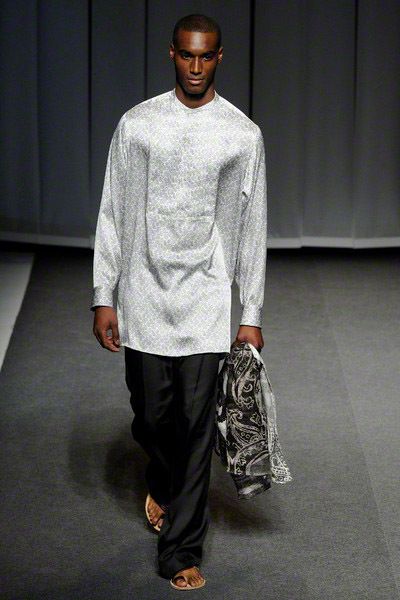 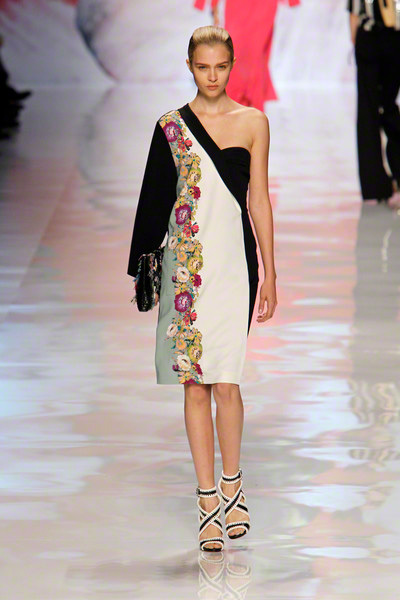 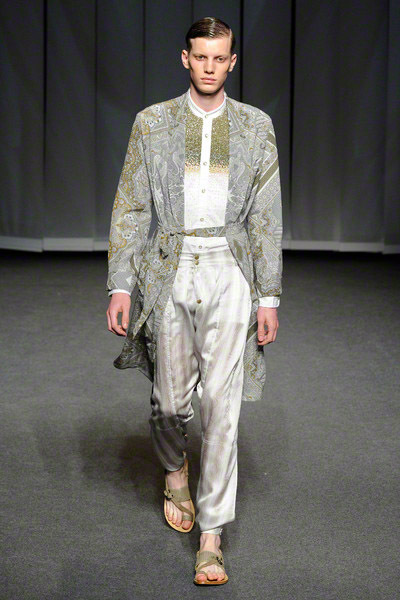 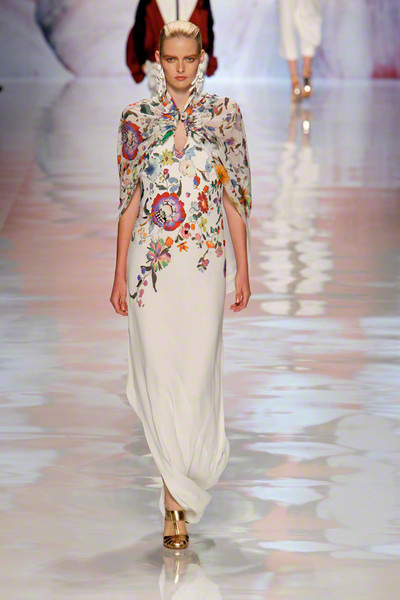 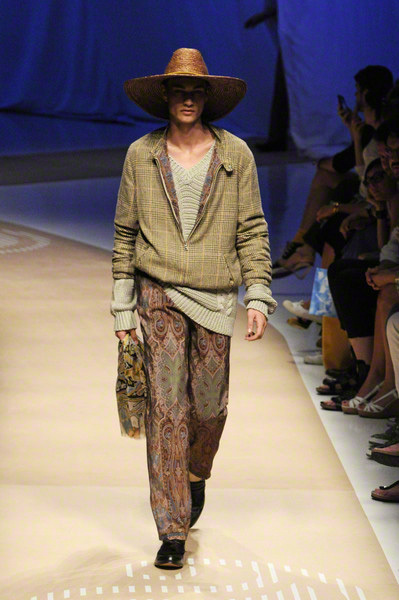 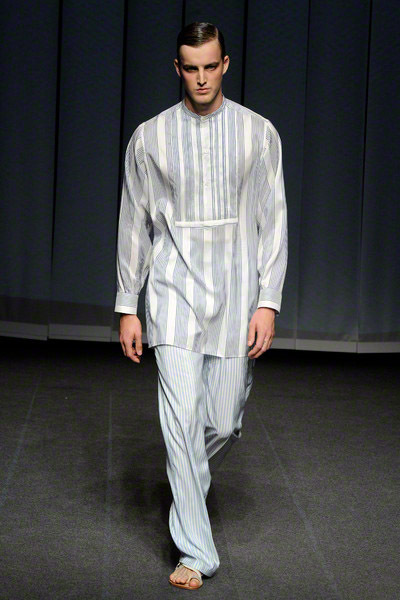 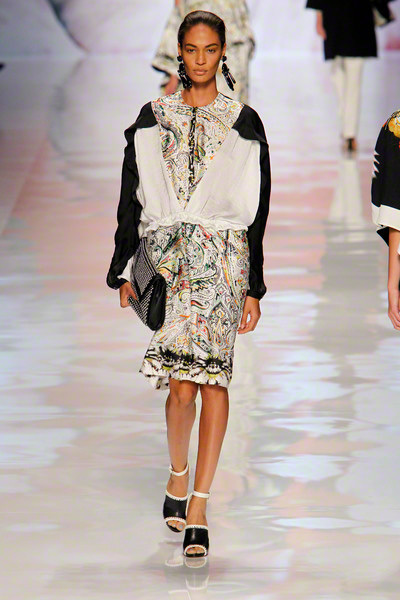 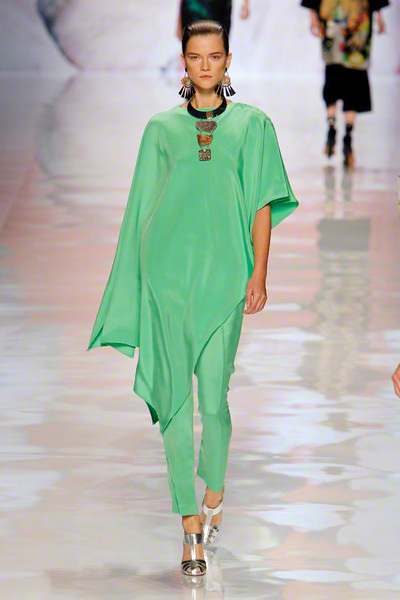 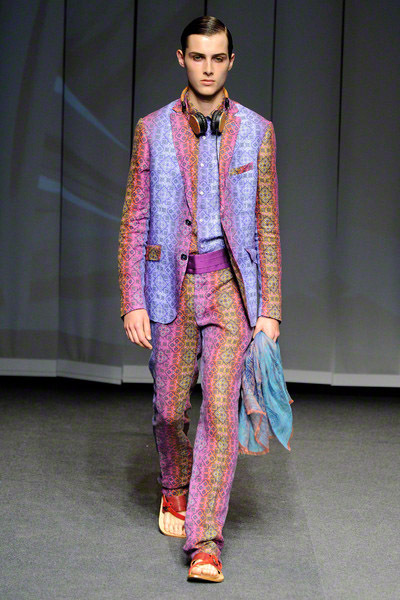 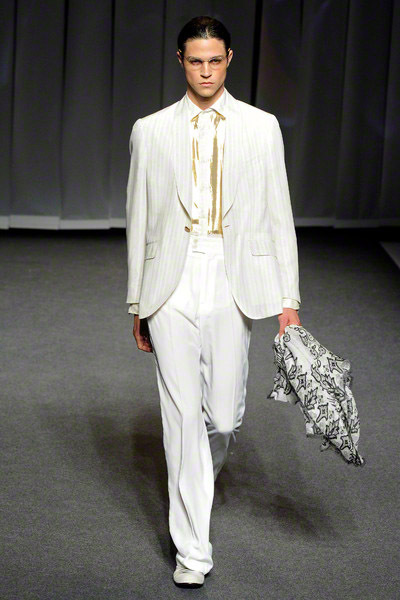 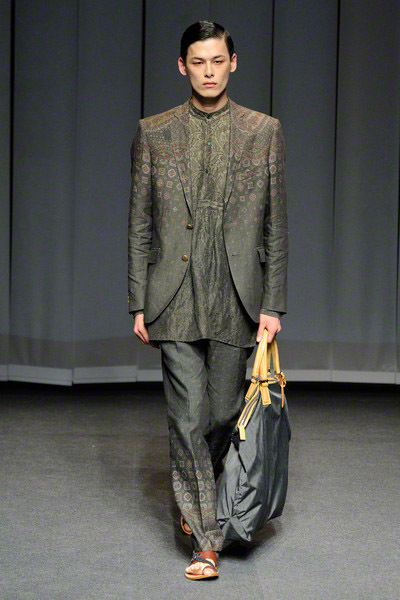 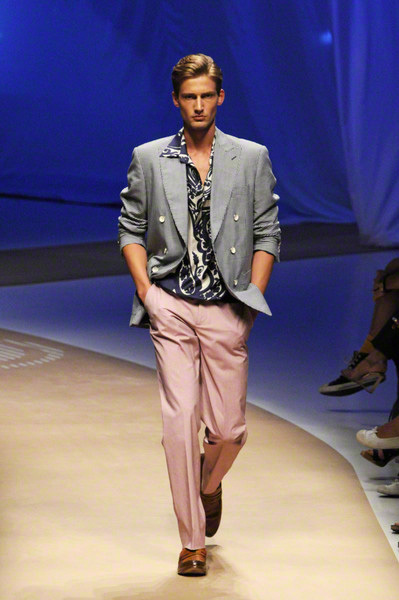 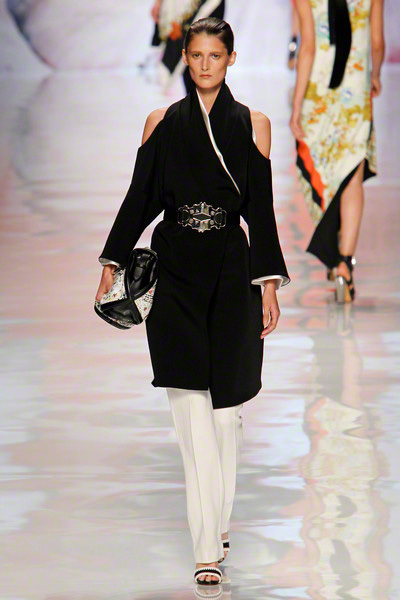 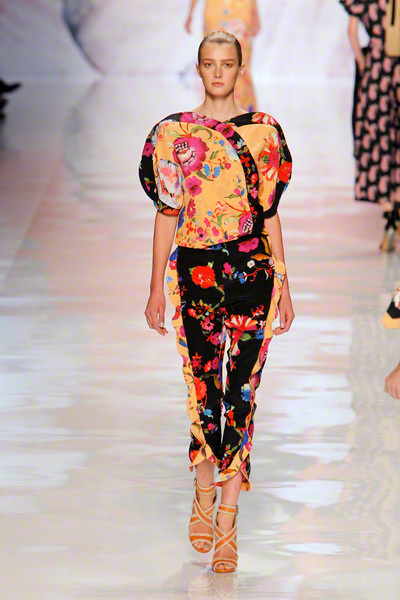 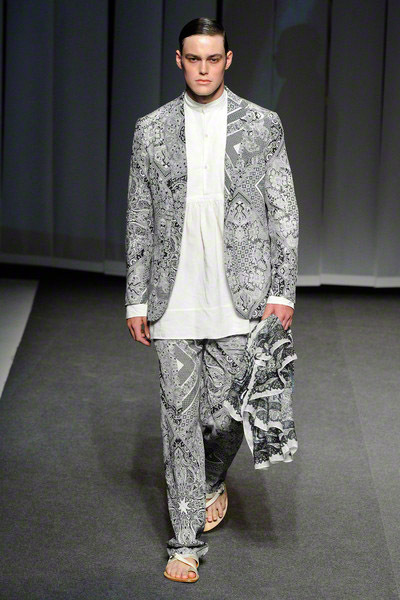 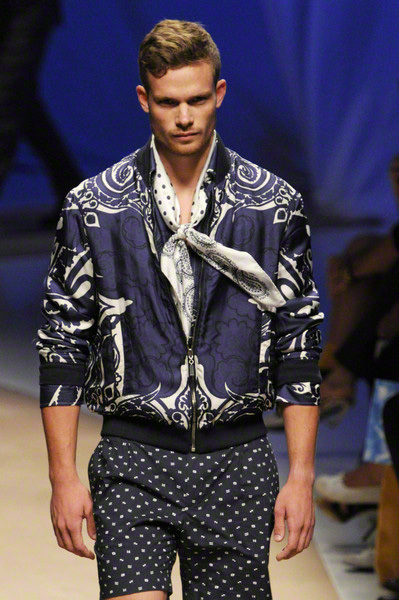 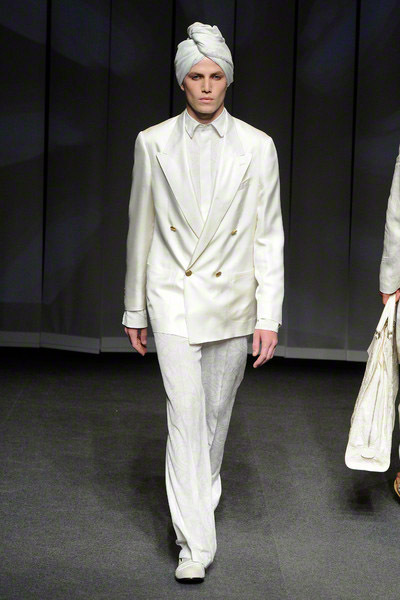 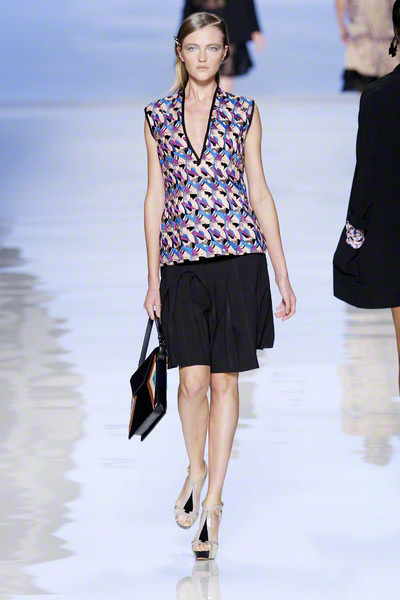 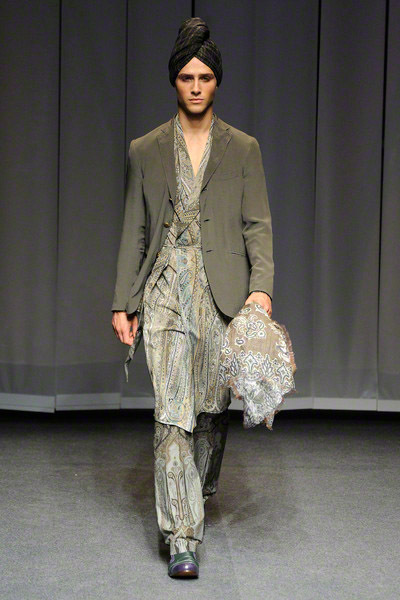 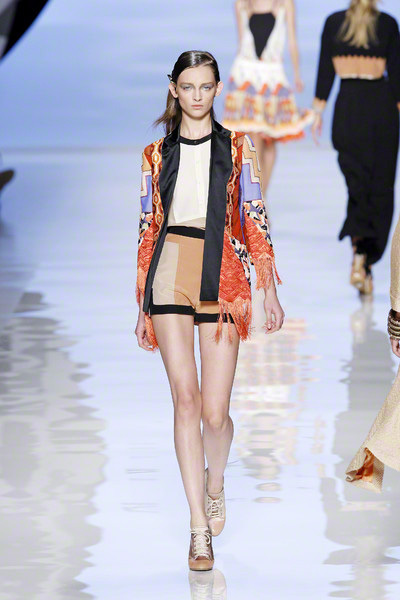 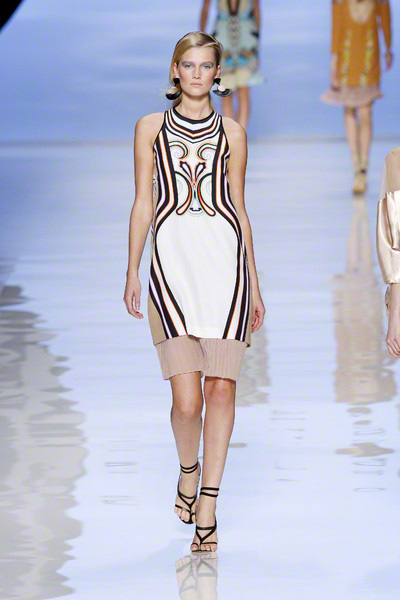 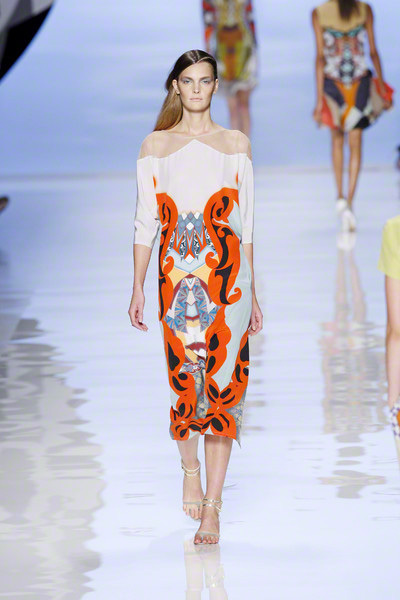 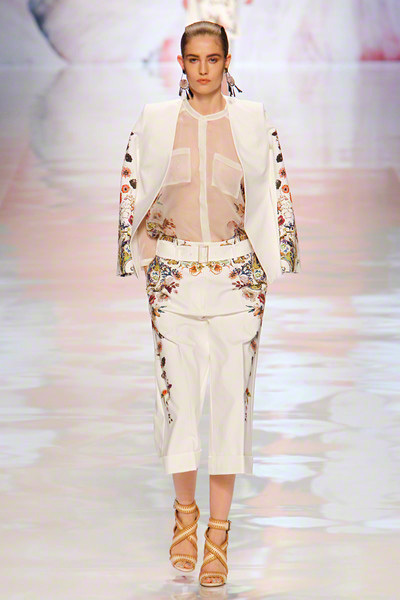 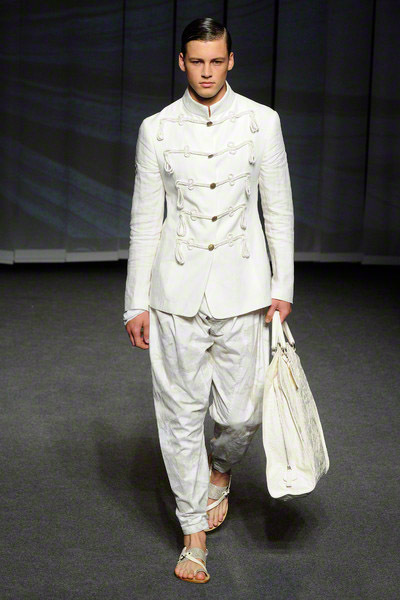 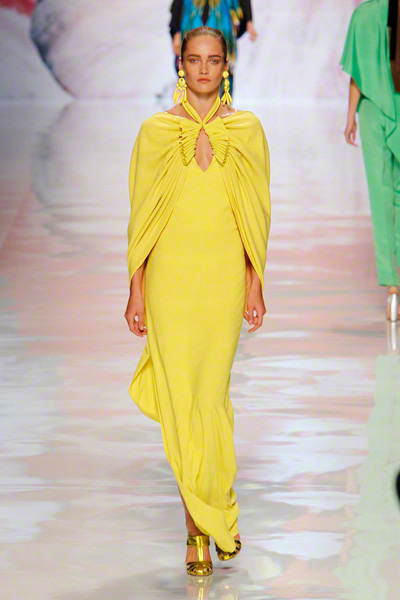 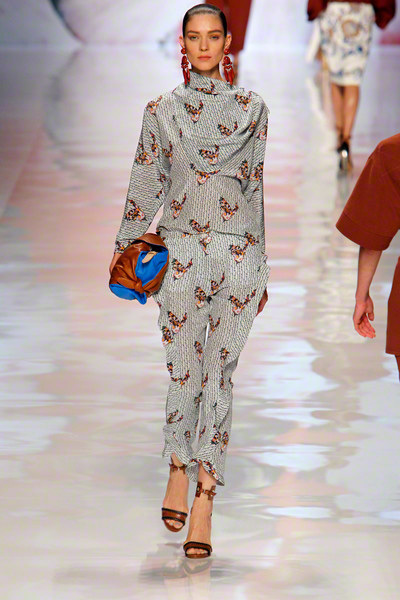 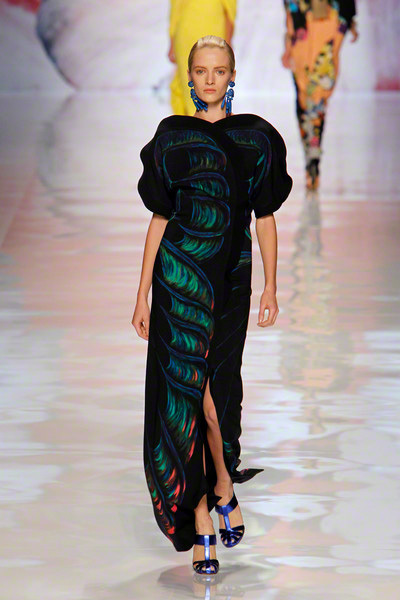 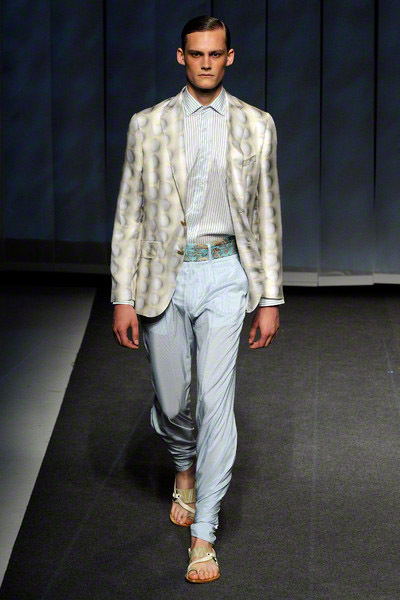 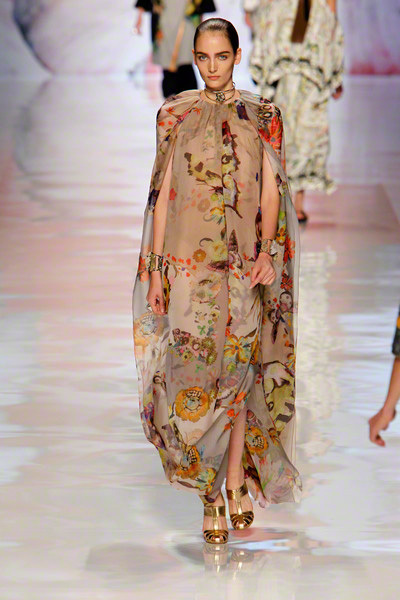 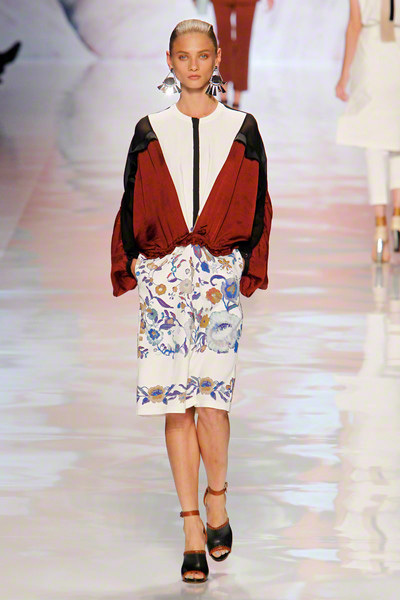 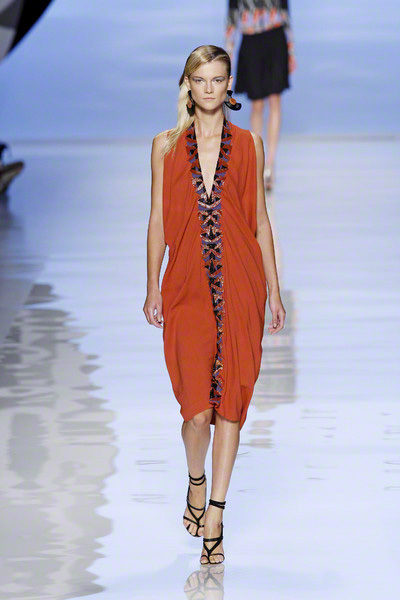 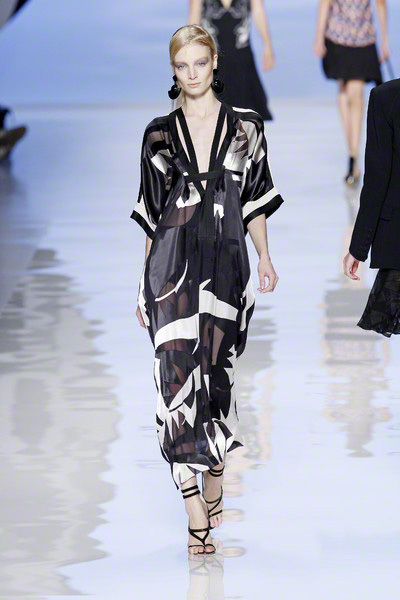 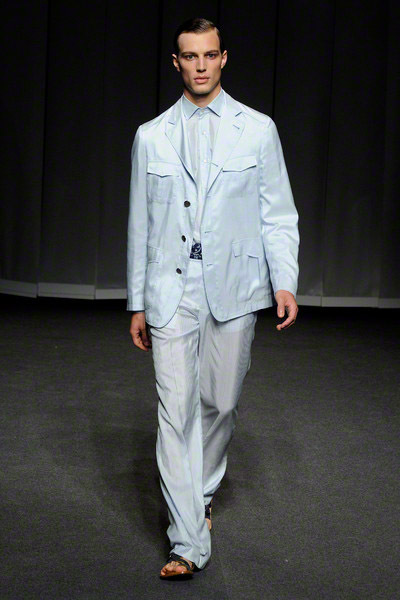 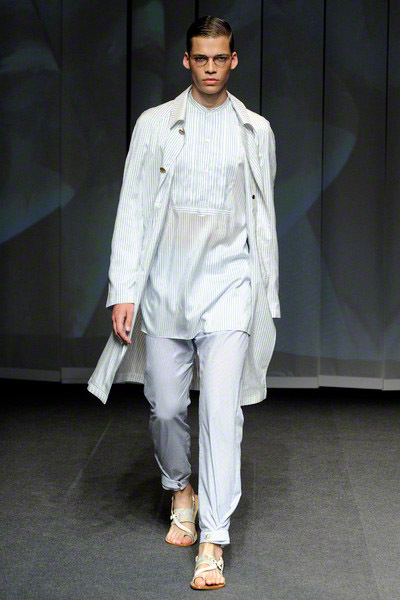 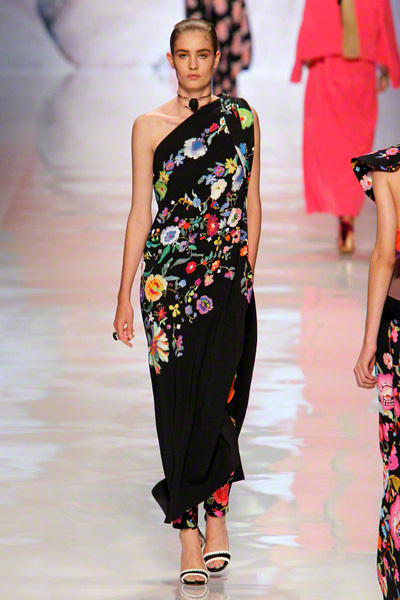 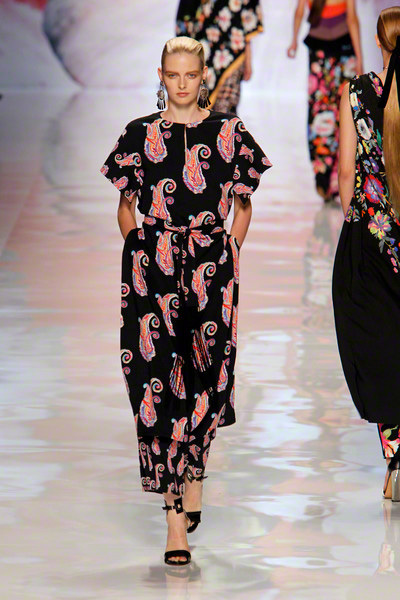 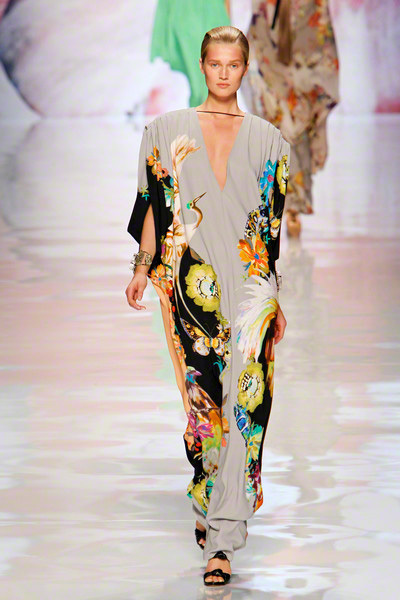 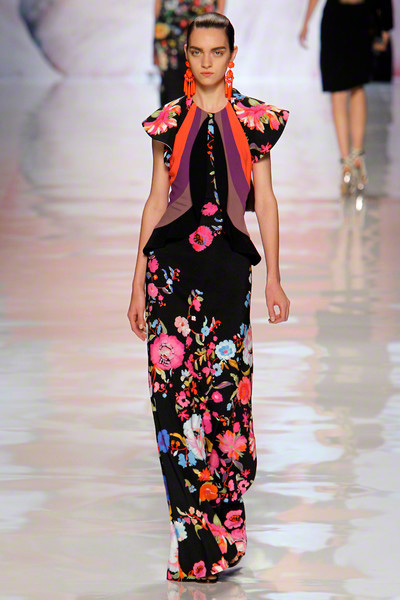 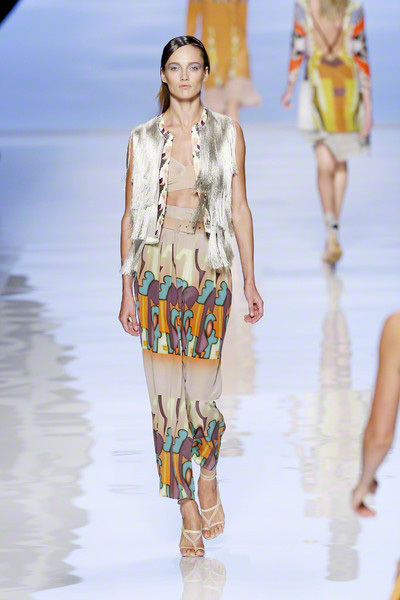 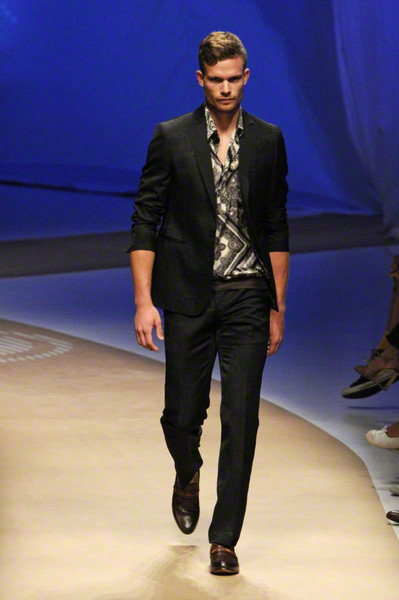 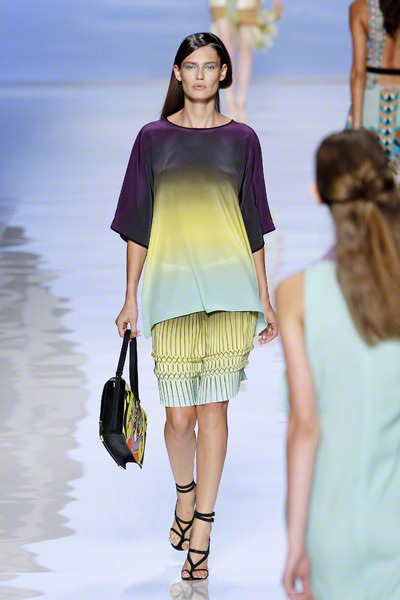 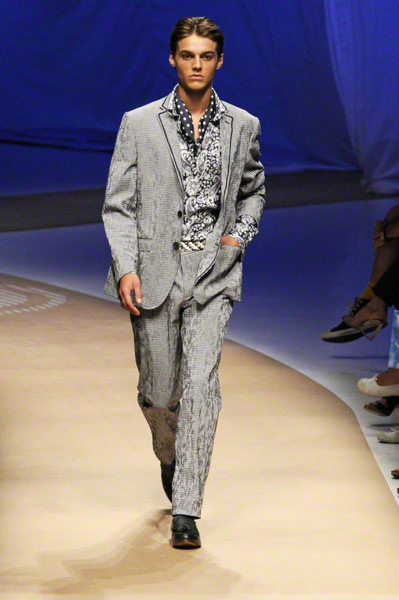 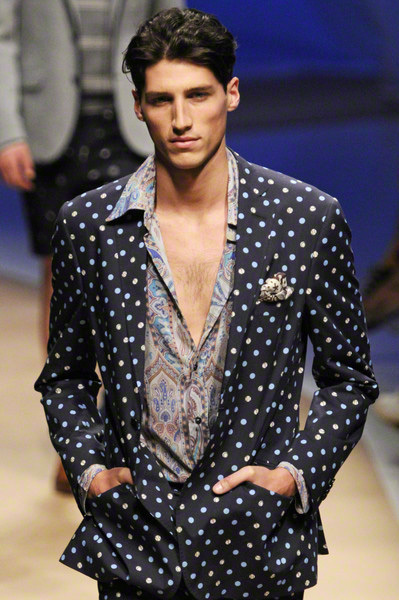 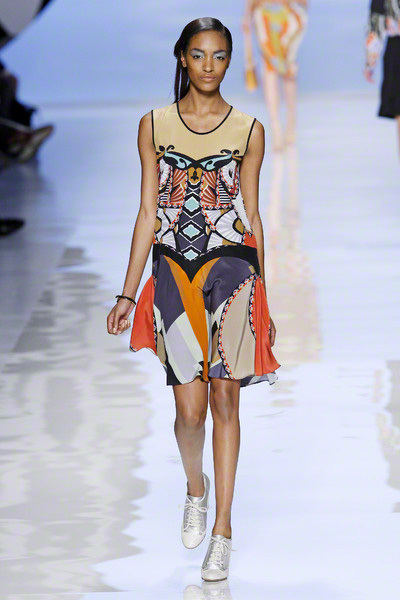 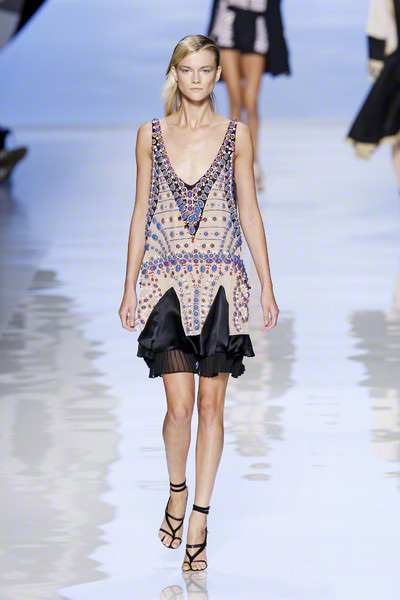 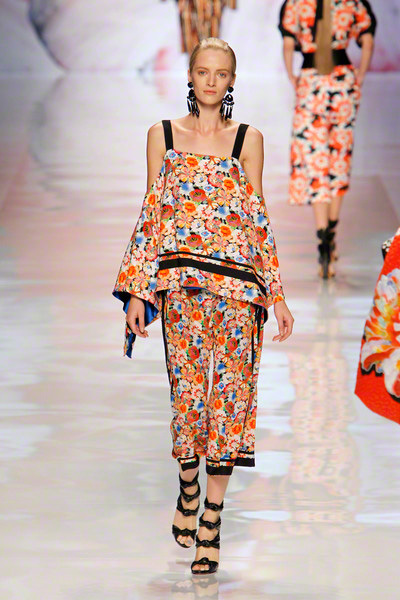 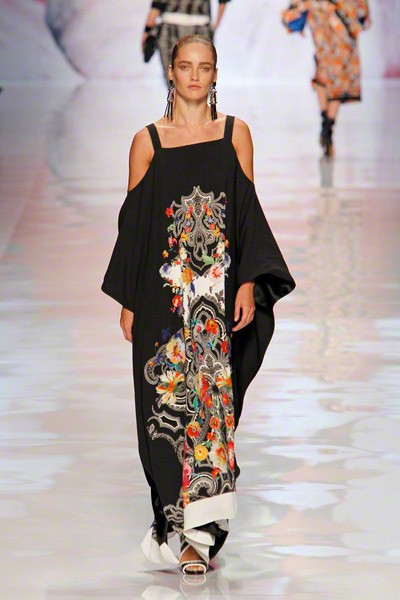 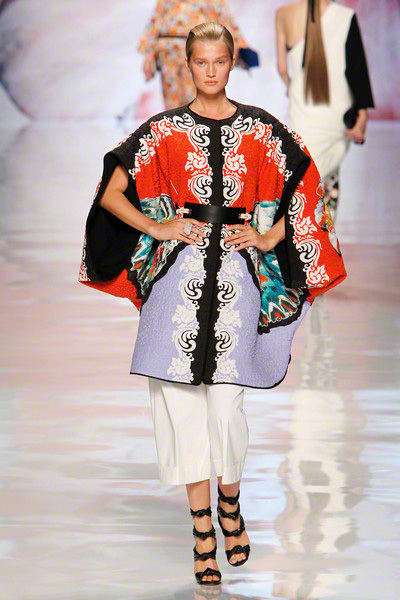 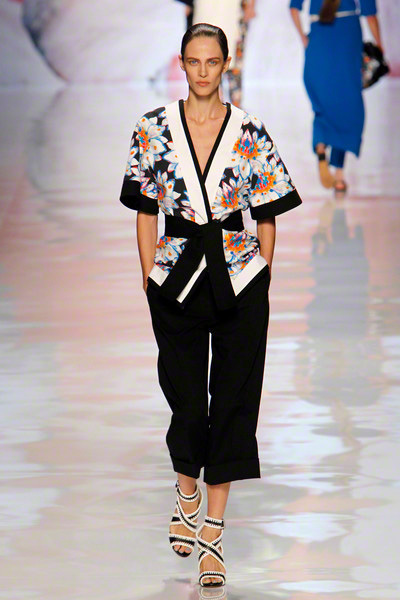 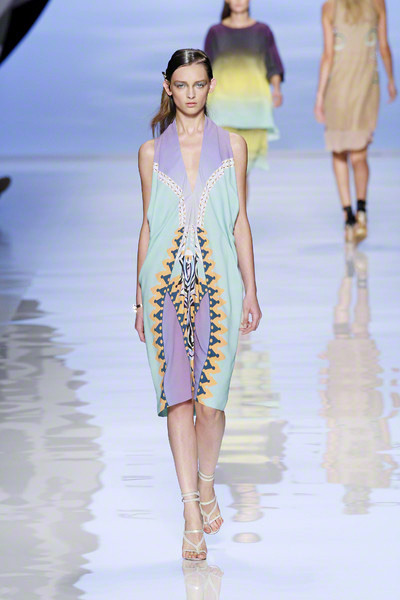 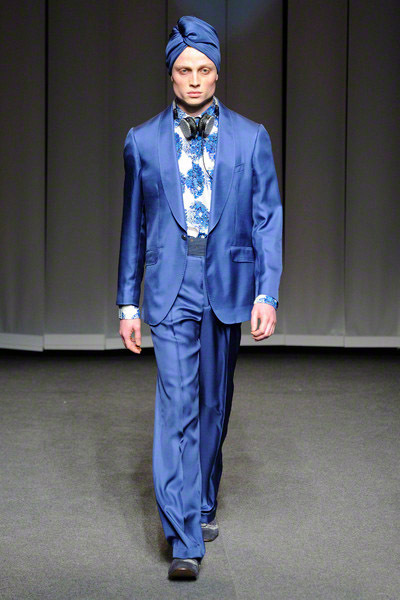 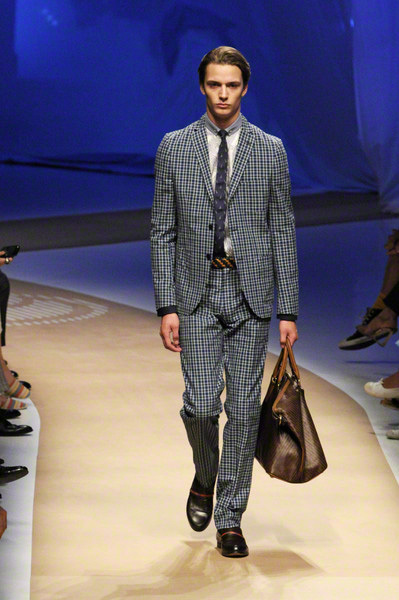 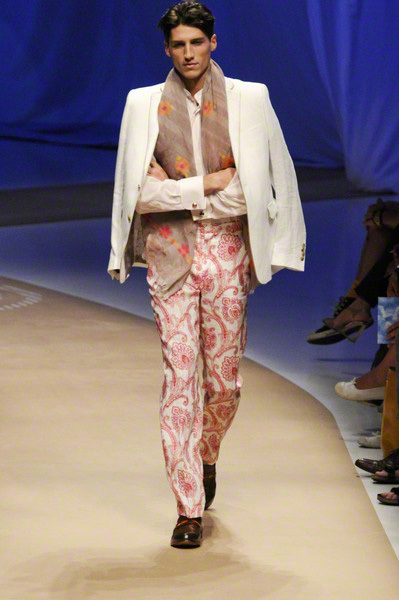 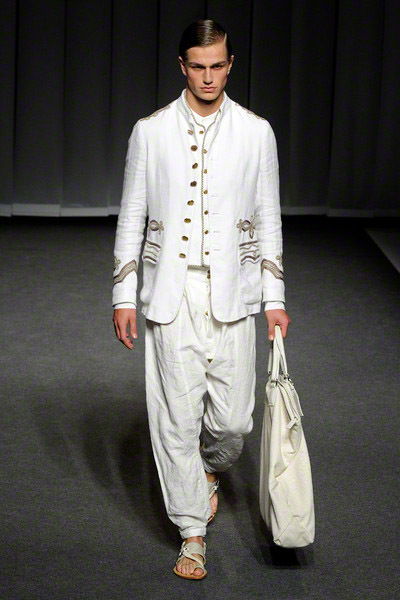 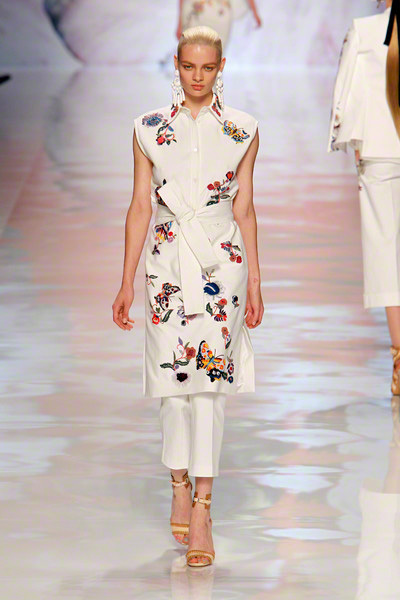 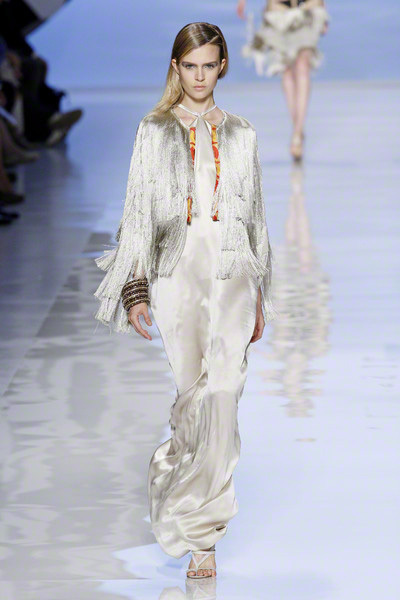 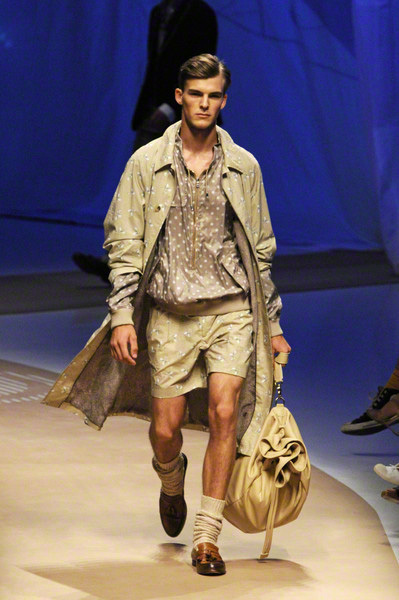 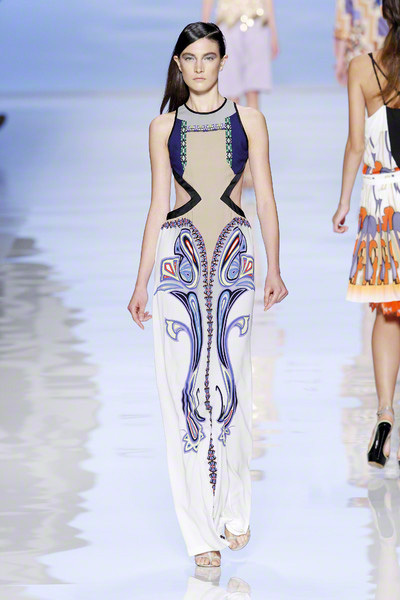 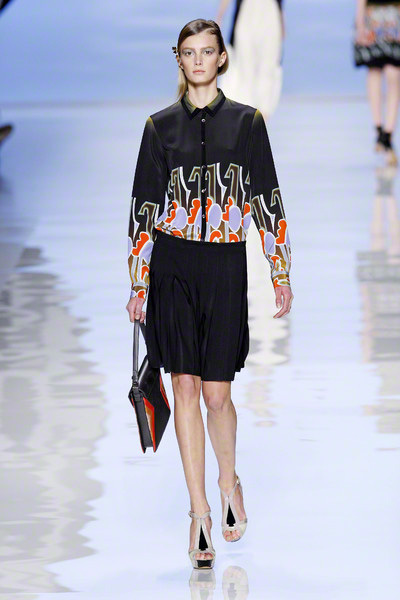 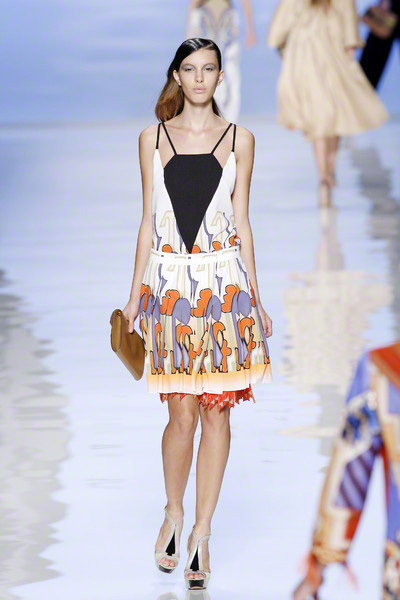 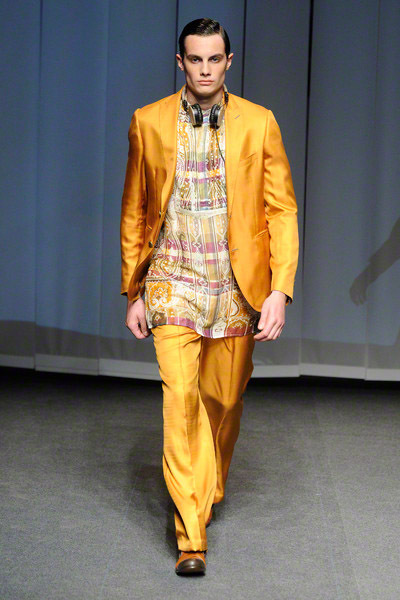 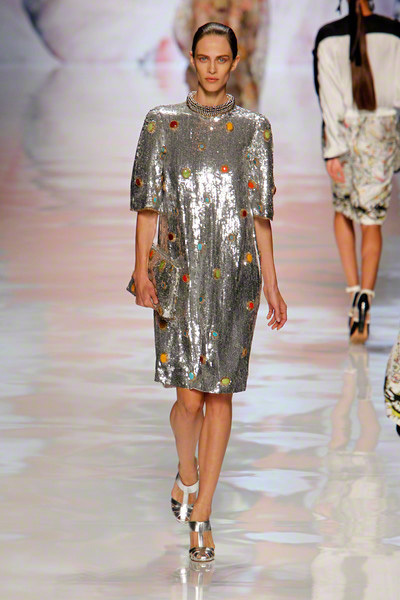 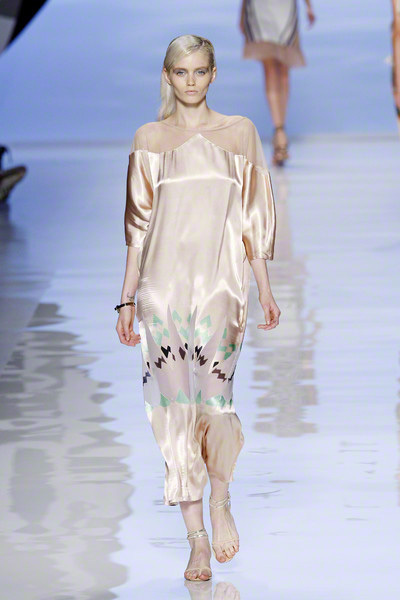 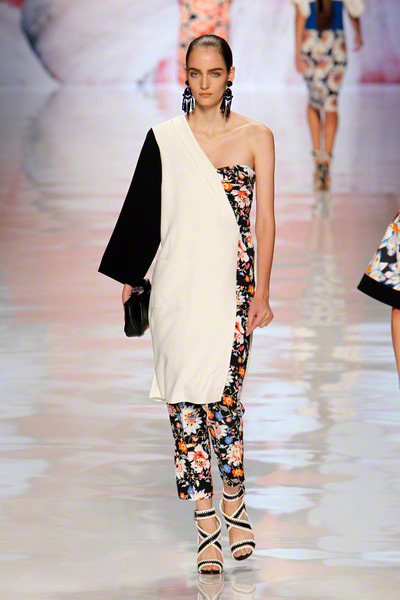 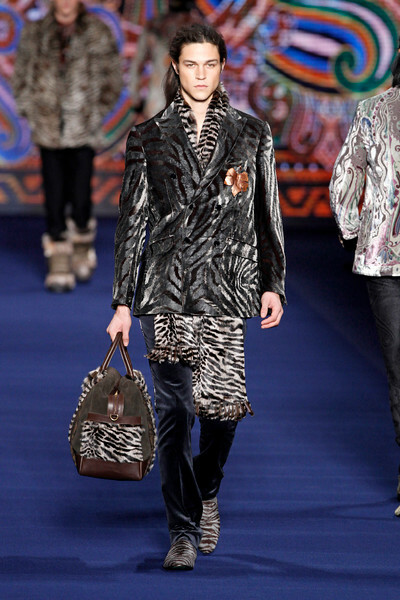 here, but everything else with a Eastern feeling was part of the Etro spring/summer 2013 story. 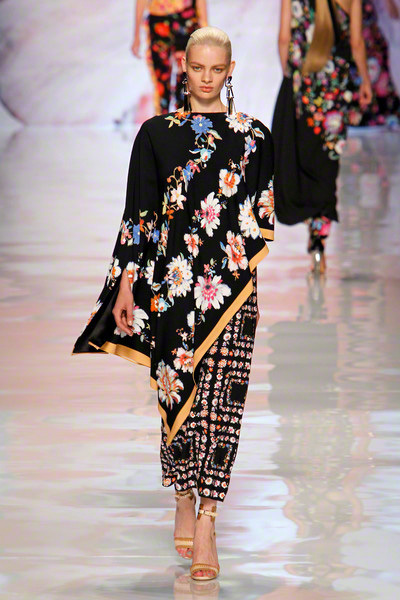 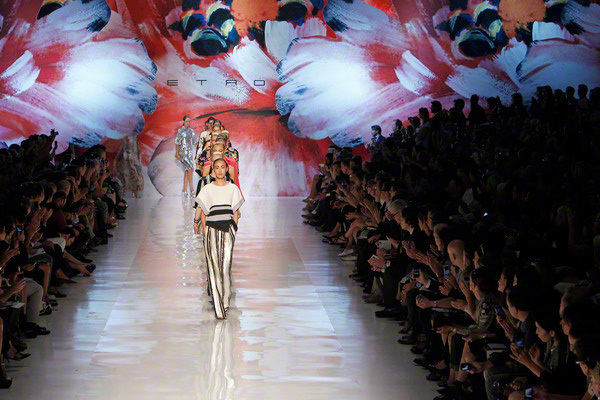 The show maybe started off light; pretty soon designs turned colorful and exotic covered in cheerful Eastern flowers. 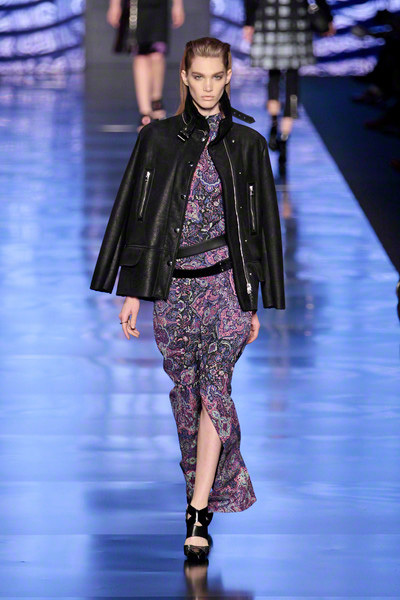 And Etro’s signature paisley print maybe disappeared a bit to the background, we were presented with these gorgeous floral prints in return. 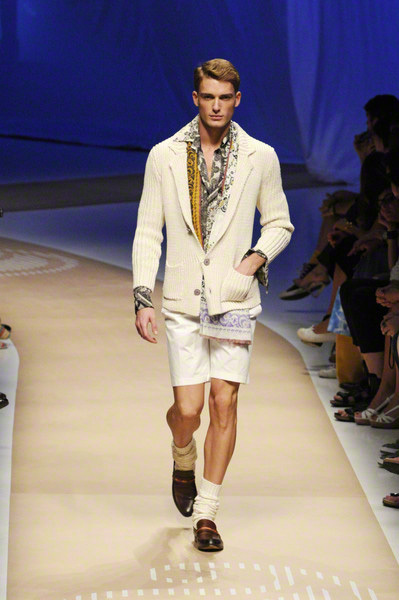 There were not so many every day wear looks and it might take a while before we hit the office judoka style. 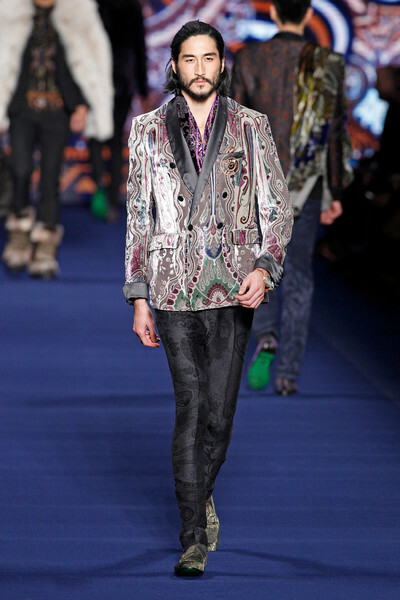 Yet every single one of the models at Etro looked glamorous and stunning. 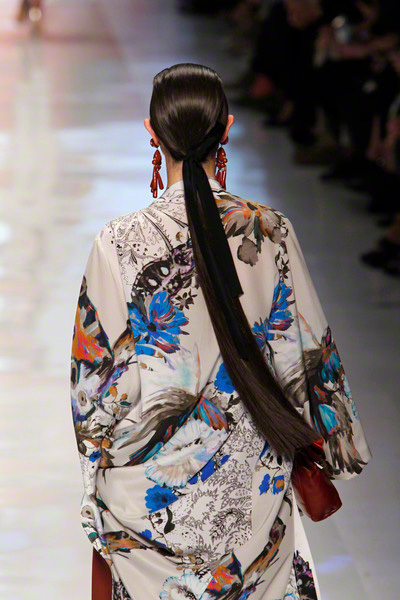 Combined with a slick hairstyle, eye-catching earrings and large clutches the designs made up for some gorgeous geisha’s everyone will want to be in 2013, at least for one night. 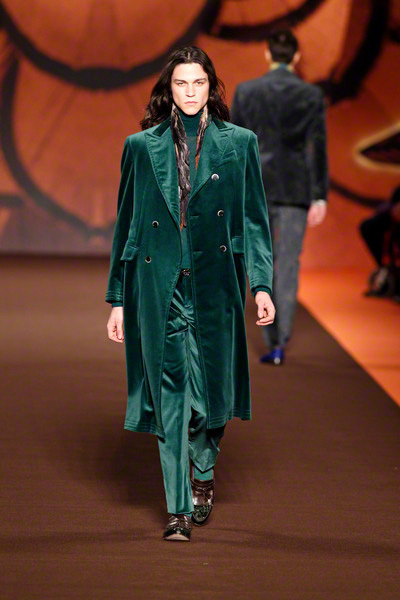 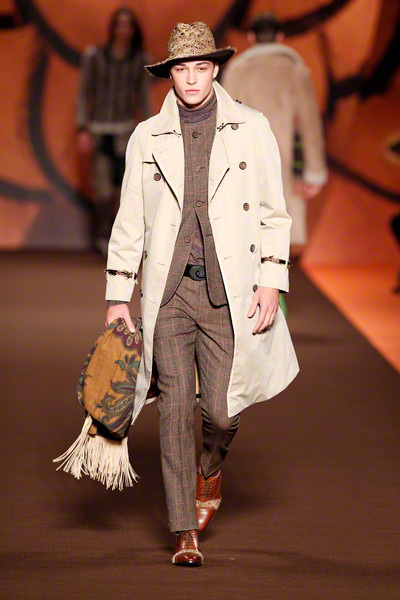 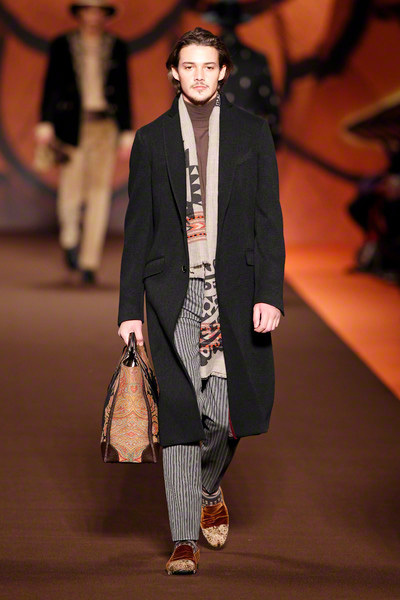 At Etro a traditional autumn palette set the tone of a collection full of outerwear and gentle country-life clothes plus lots of knits. 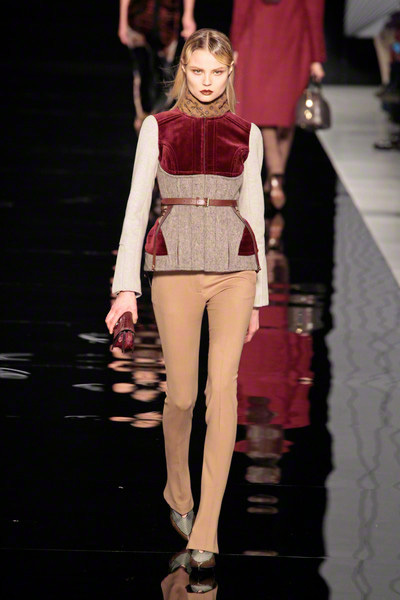 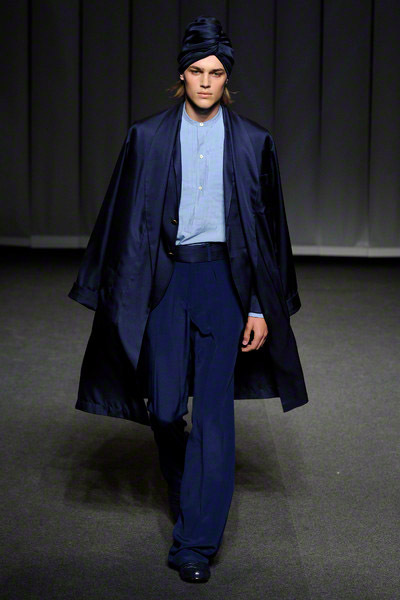 Jackets and coats were belted and sometimes topped with astrakhan capelets. 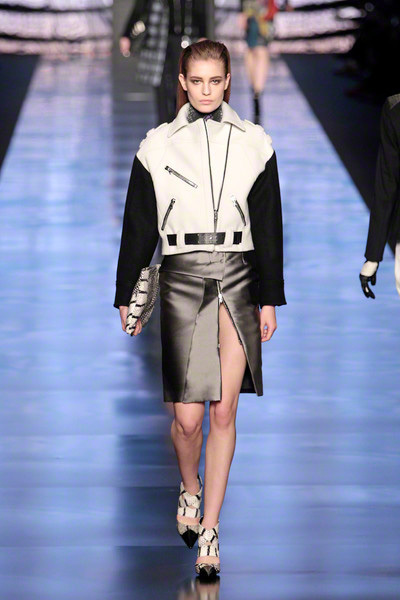 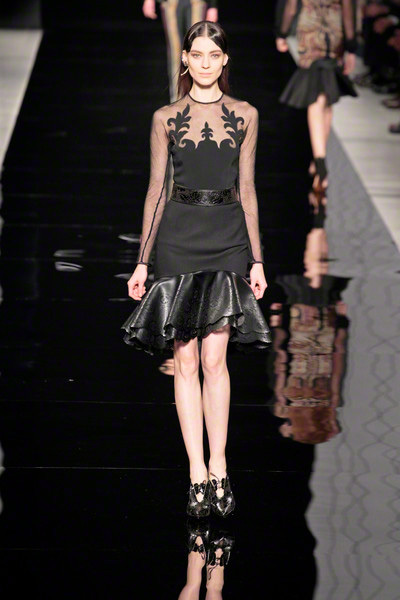 Special details were leather peplum belts, men’s-inspired swaggers, sheer underpinnings and a some body-conscious silhouettes. 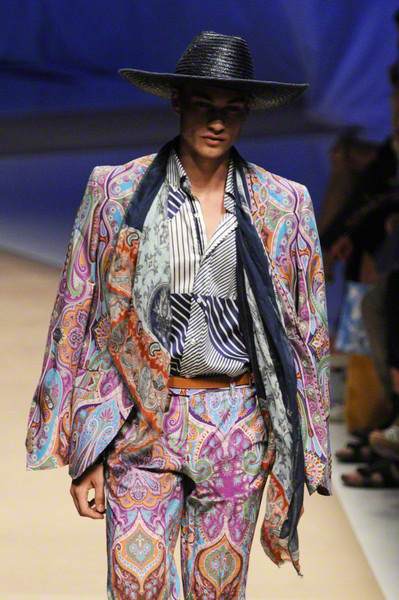 Of course there was the famous paisley-pattern, modern and sometimes exploding. 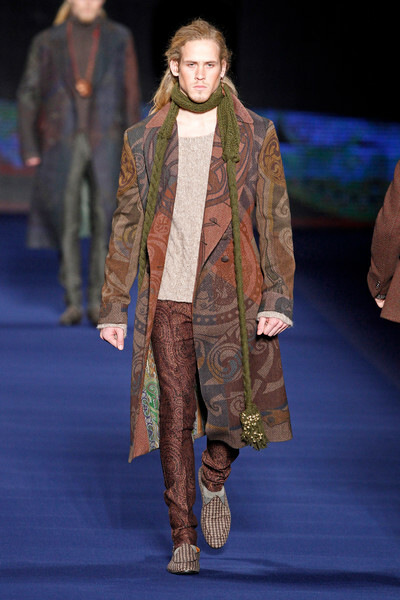 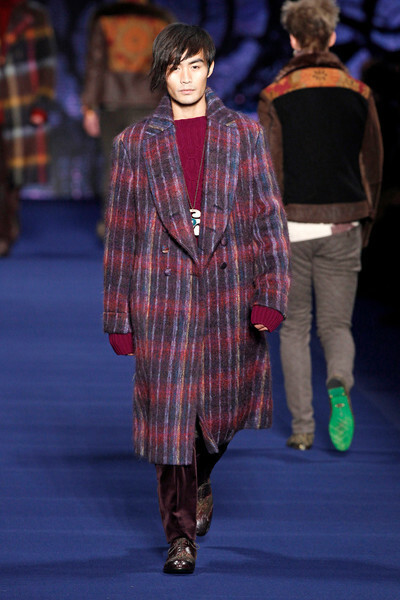 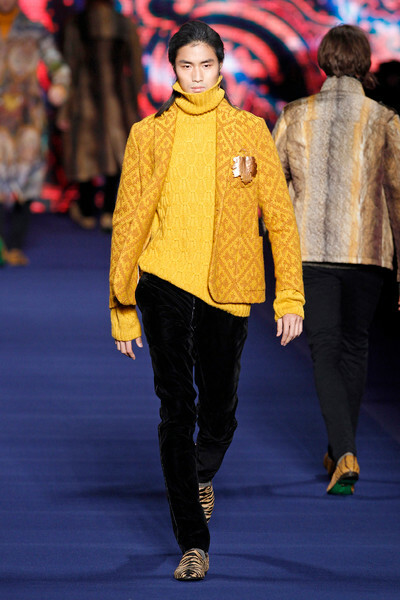 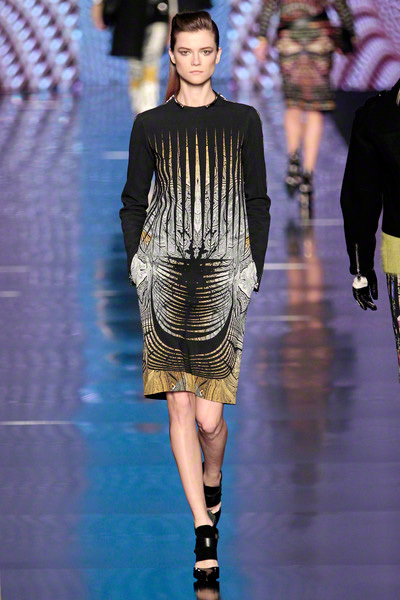 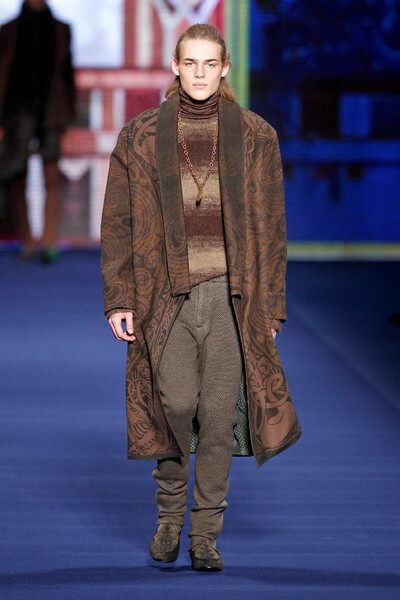 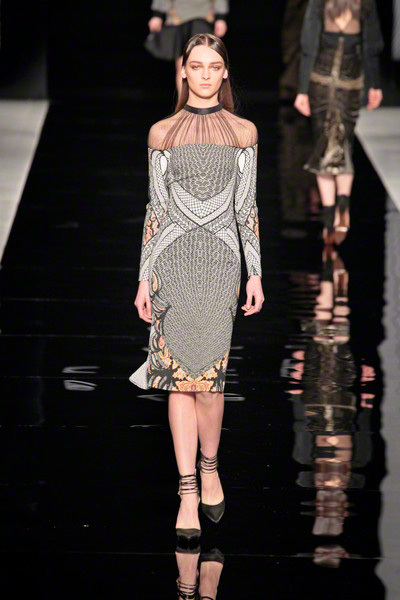 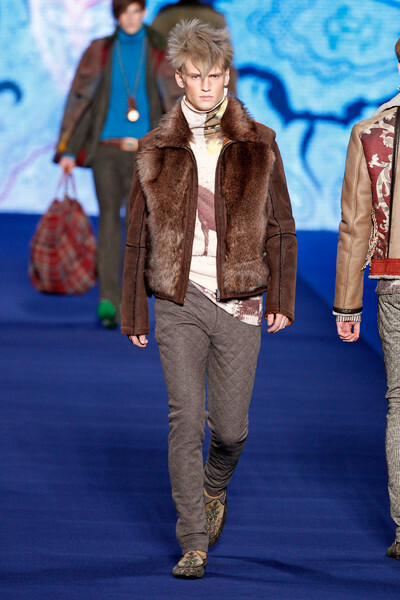 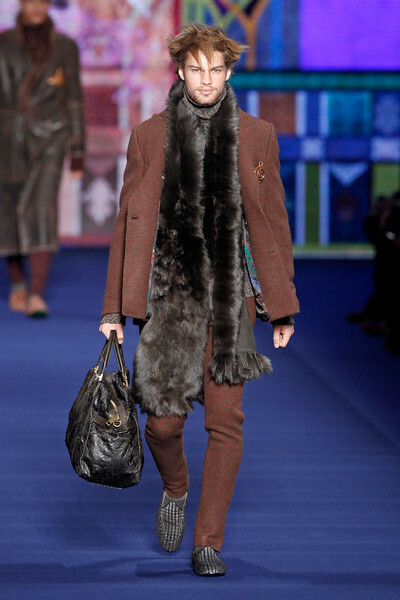 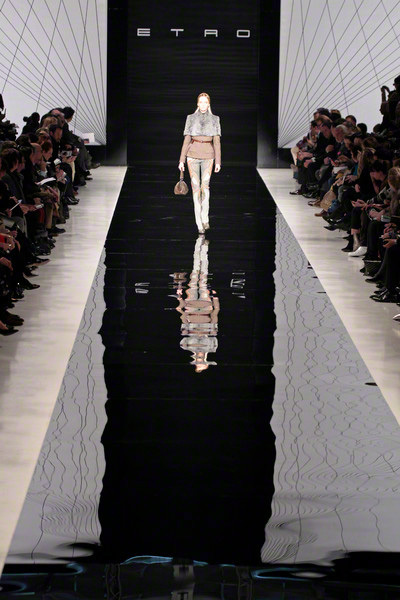 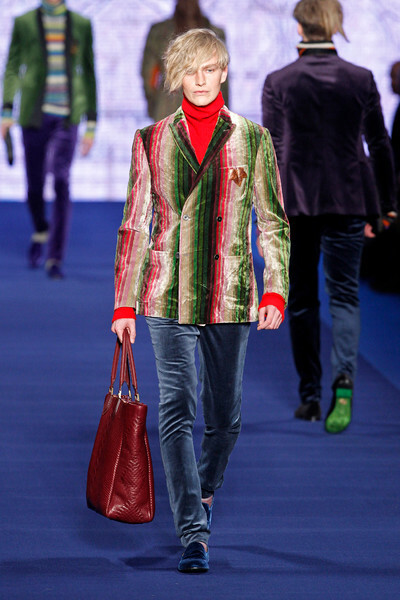 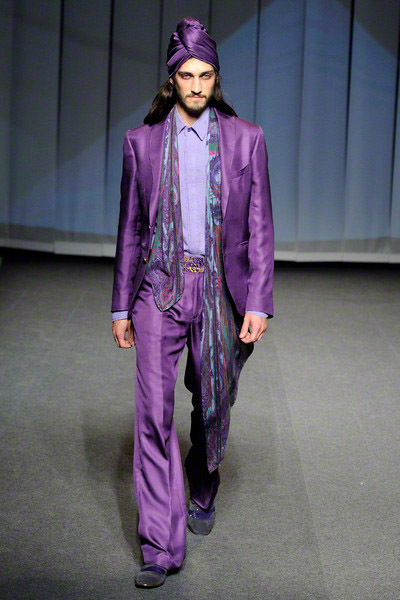 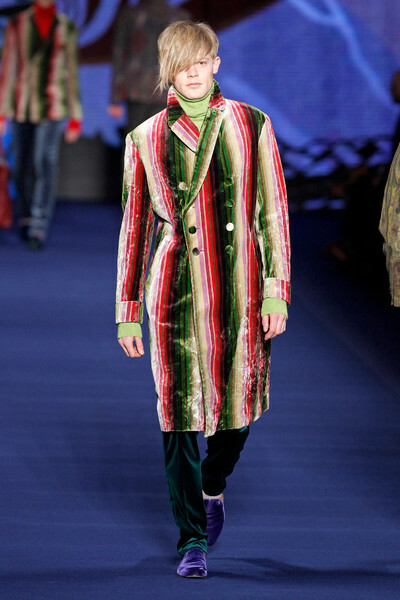 Today’s Etro show was more graphical and lighter than previous collections. 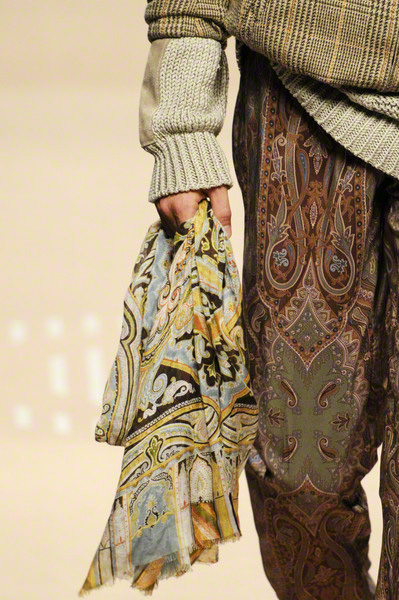 It was out with the good old paisley prints and in with the new digital ones. 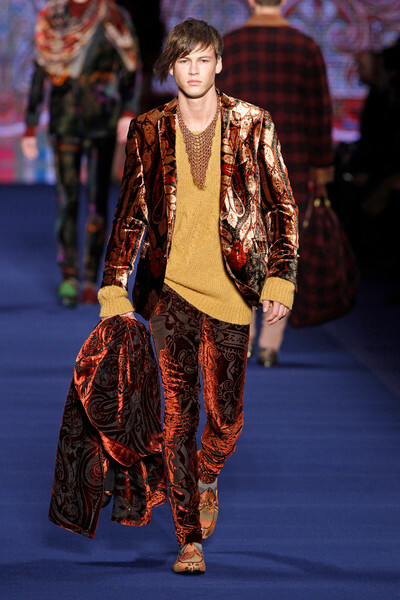 The clothes still looked as lovely as ever. 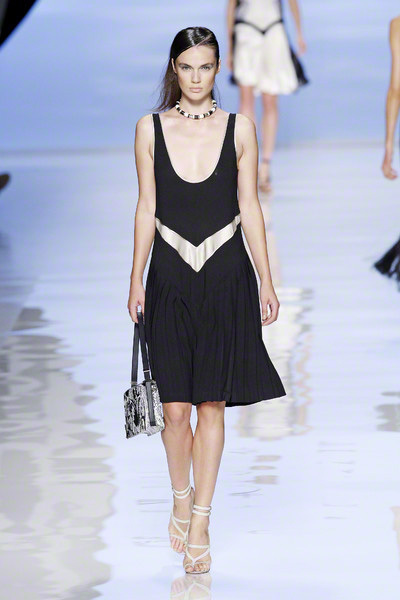 There were modern versions of twenties dresses, high waisted shorts and jumpsuits, done in an original mix of shades. 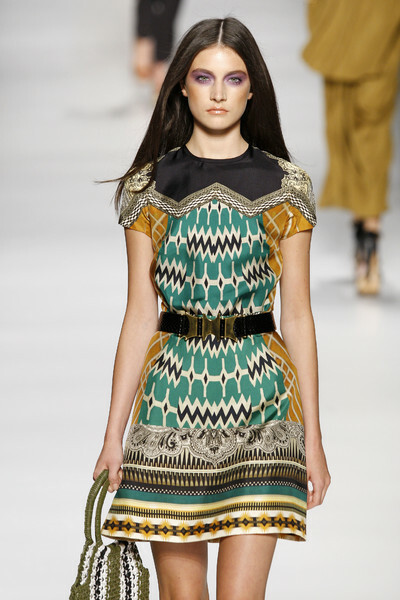 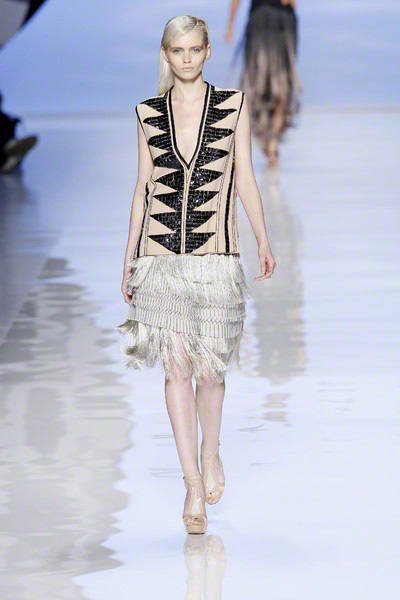 Fringes, pleated underskirts and eyecatching linings made the simple cut dresses extra special. 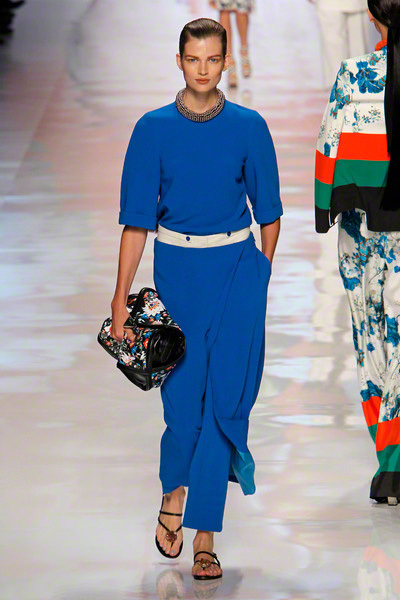 And some enormous earrings and cute handbags topped it off. 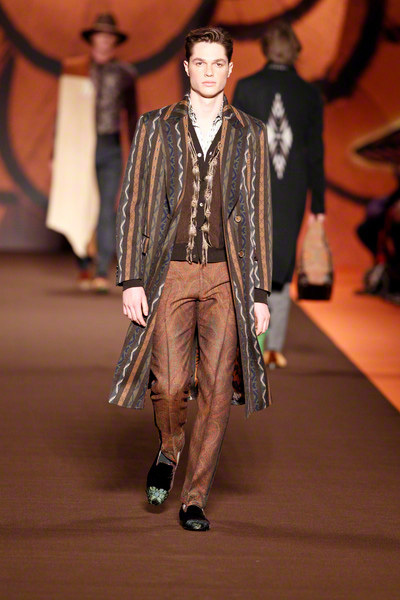 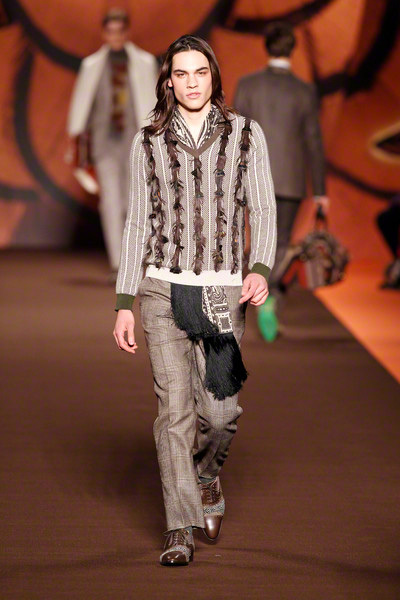 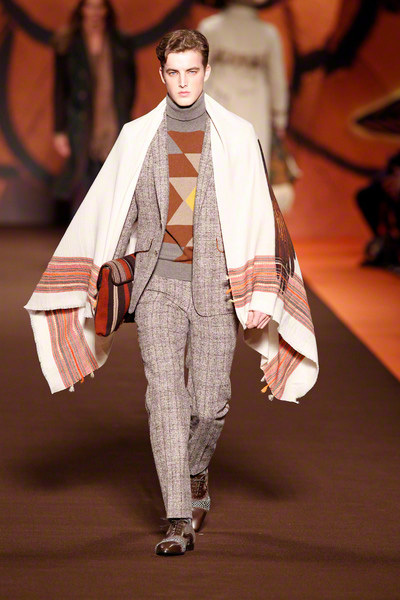 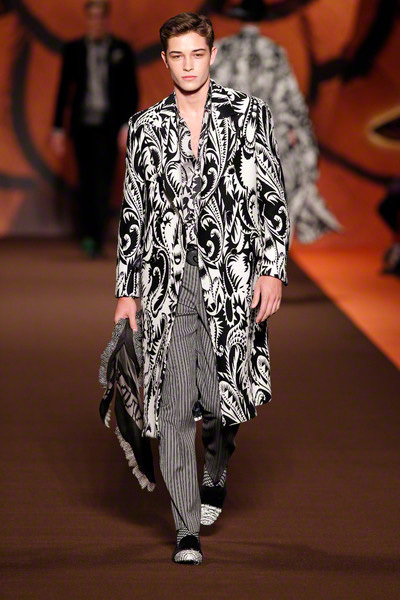 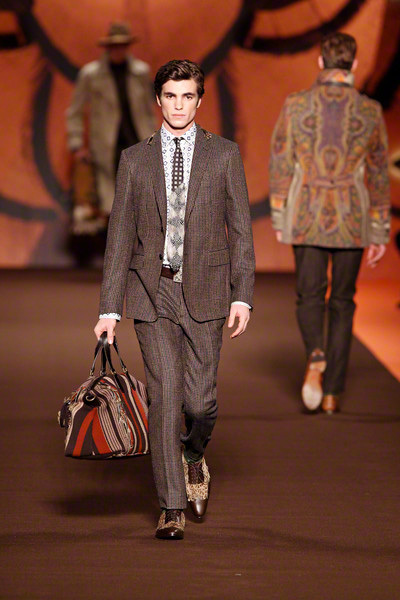 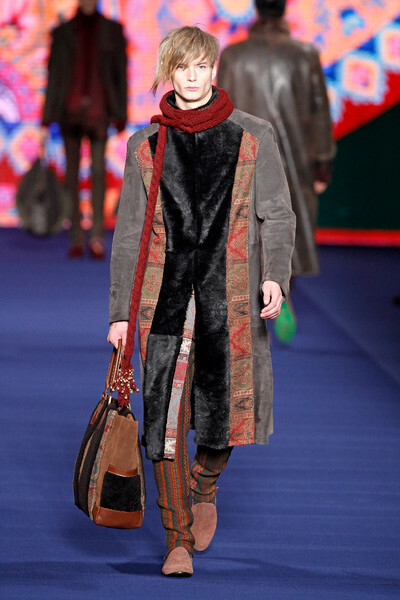 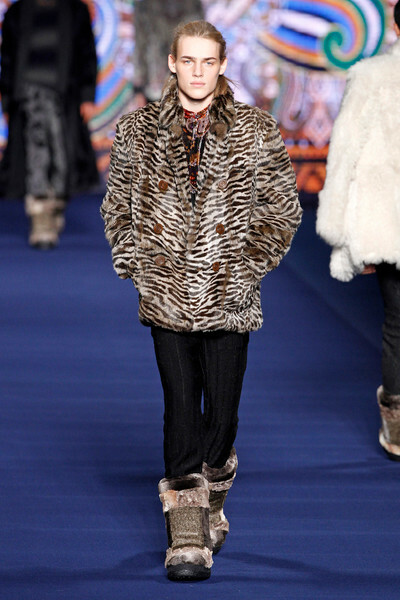 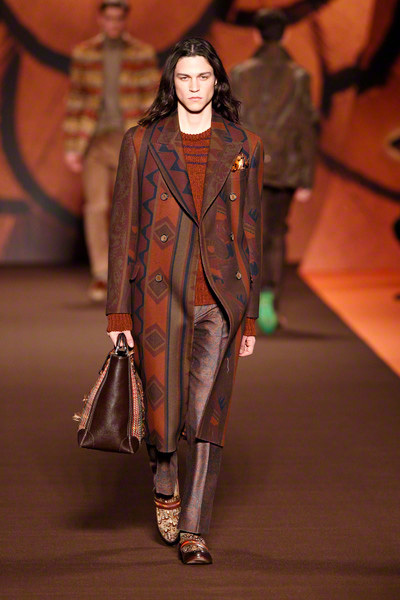 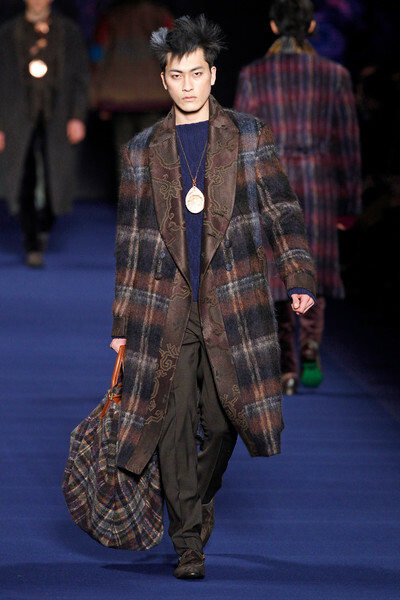 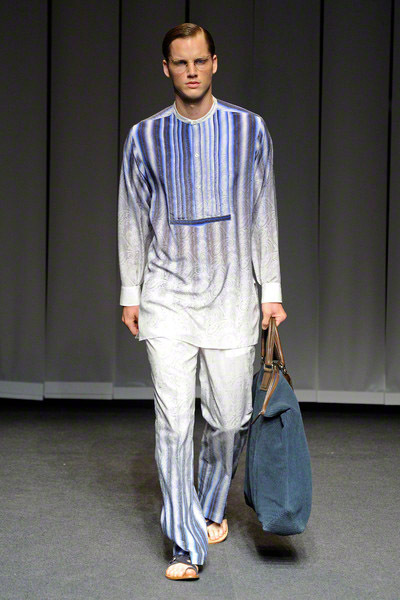 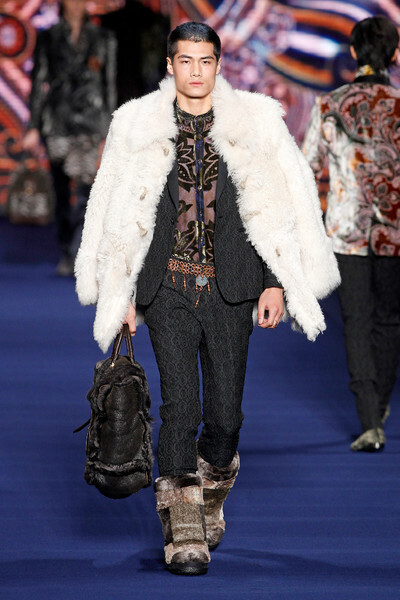 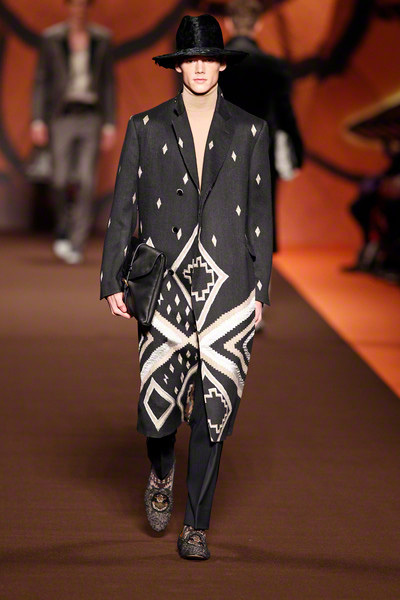 No Etro without the ethnic prints and today was no exception. 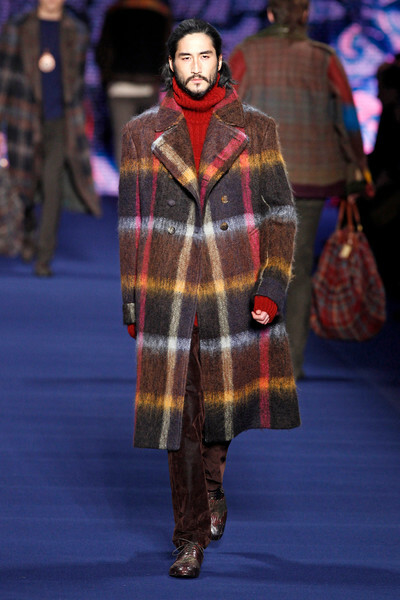 Mixed with checks, stripes and florals they formed a gorgeous contrast for many of the easy to wear looks. 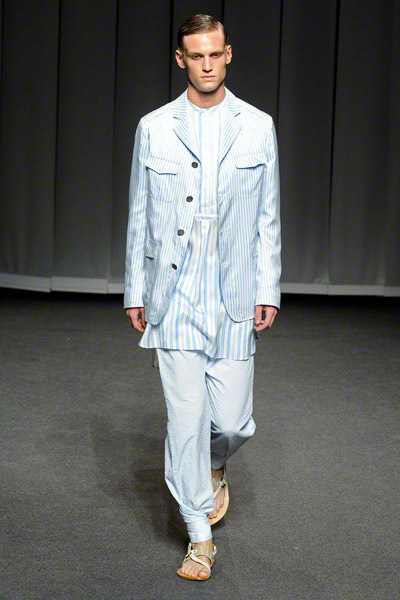 The relaxed spirit came from the loose fits of the clothing as well as the ‘messy’ styling (lots of layering and many untidy shirt collars). 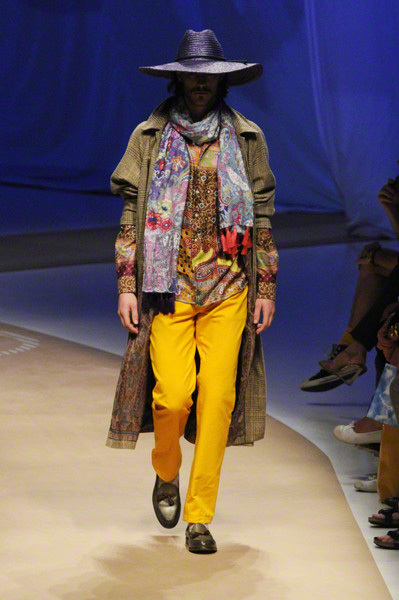 Colors changed from pastels to brights and camouflage and were beautifully picked together. 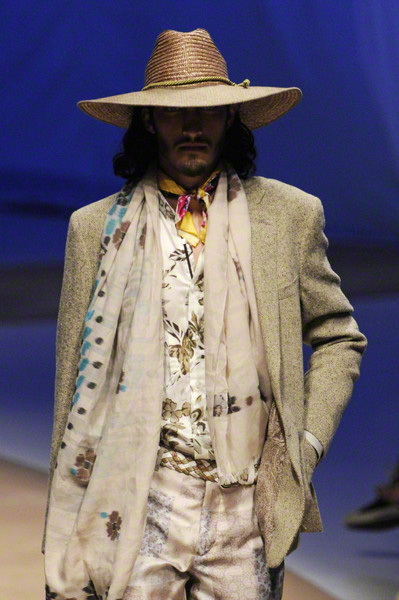 Some of the outfits might have had a feminine touch to them but together with the accessories (straw hats, leather loafers and big bags) it looked just right. 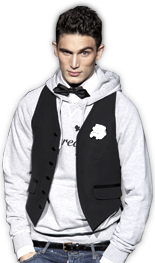 The quality of the clothes was truly visable and the models looked impeccable. 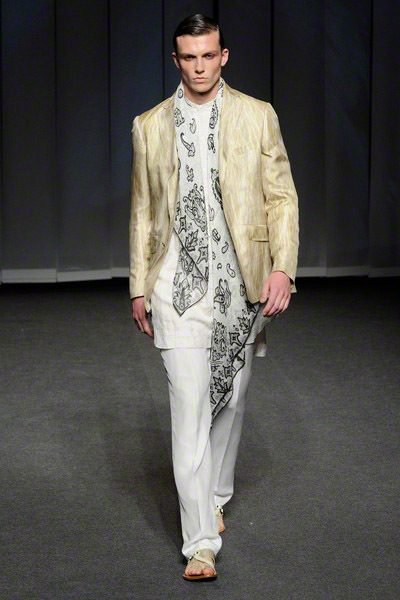 Check out our gallery (above). 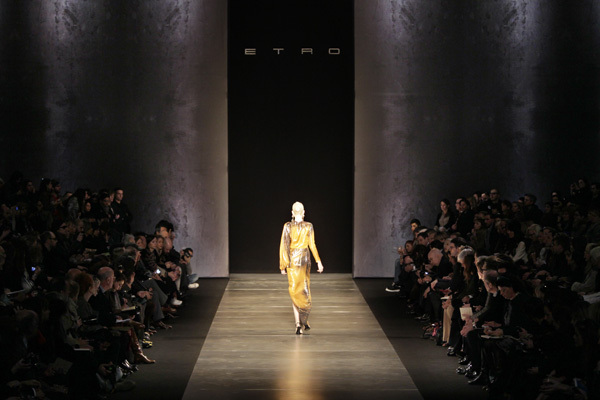 At Etro we were once again pampered with delicious bites, the best drinks and free Etro pillows. 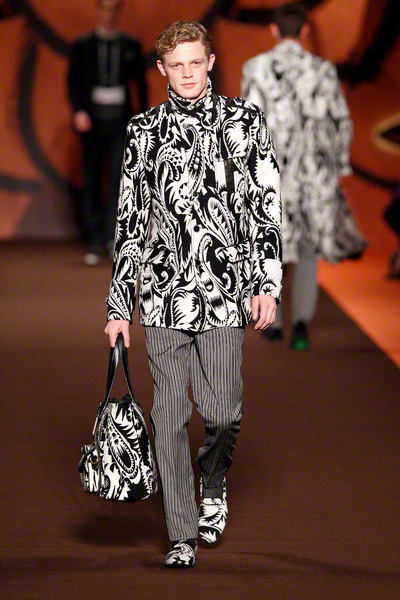 The baroque prints of the pillows perfectly matched the winter season, as did the prints in the collection. 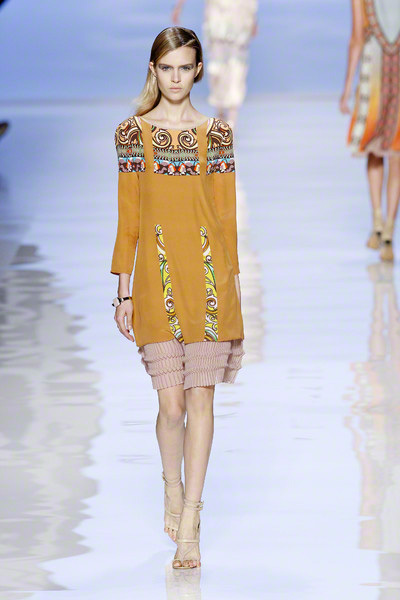 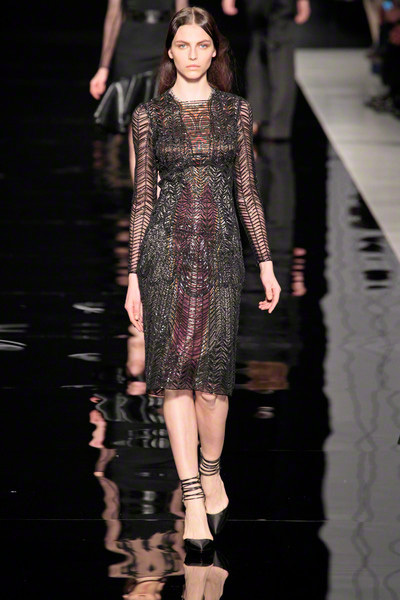 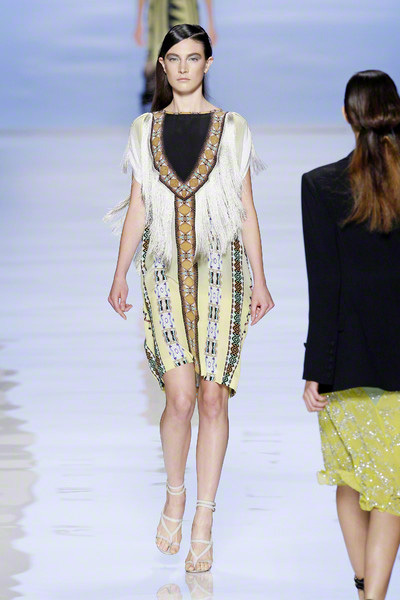 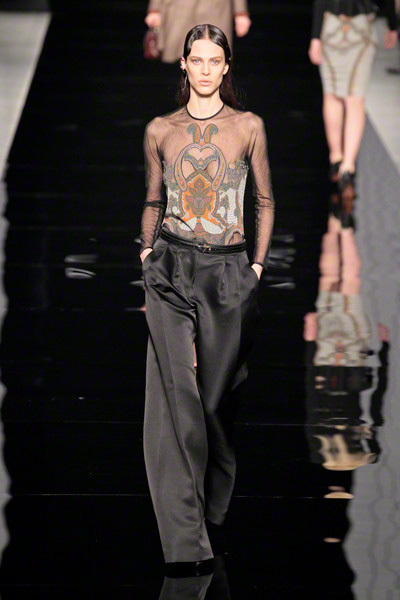 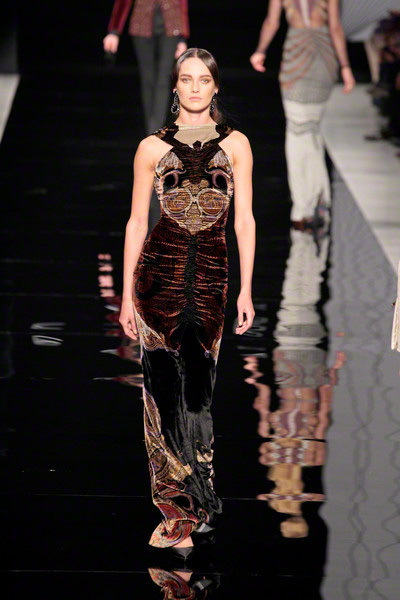 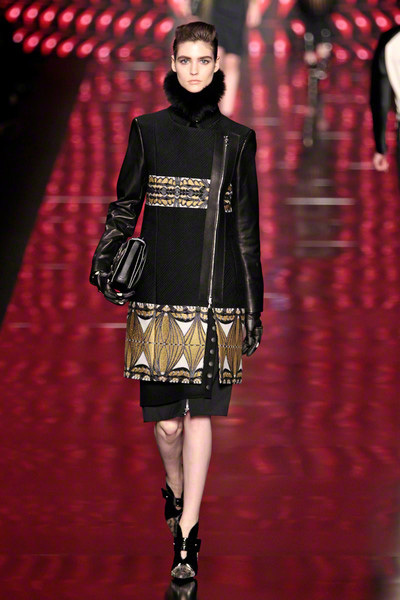 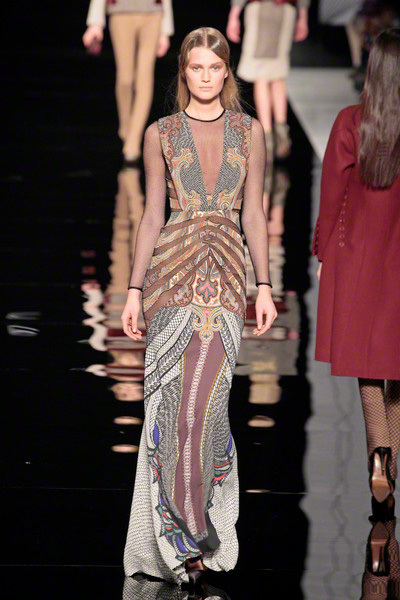 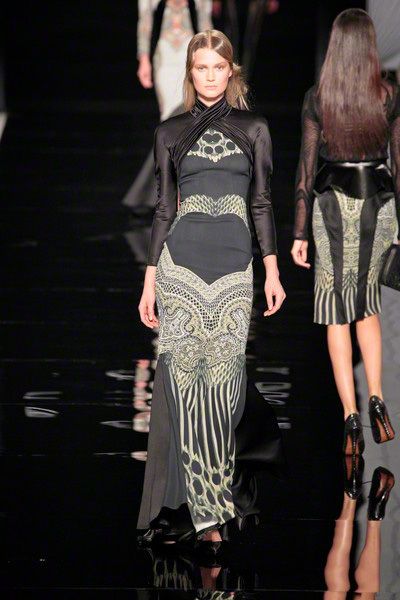 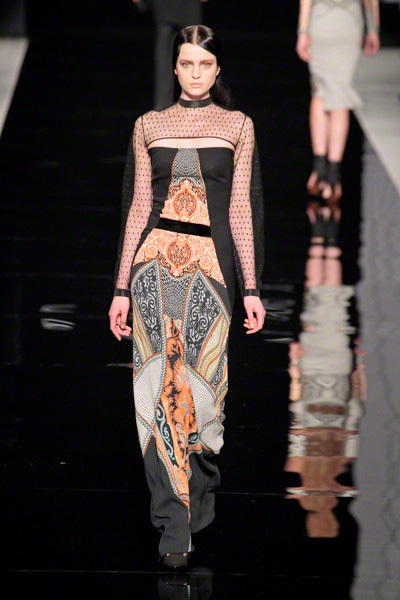 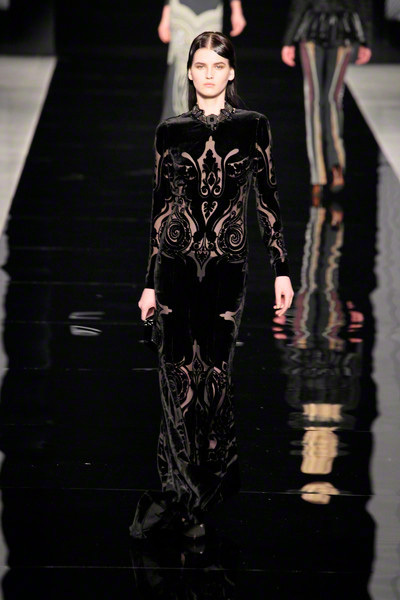 Veroniqua Etro’s inspiration for her ethnic prints this time came from antique carpets, tapestries and embroideries. 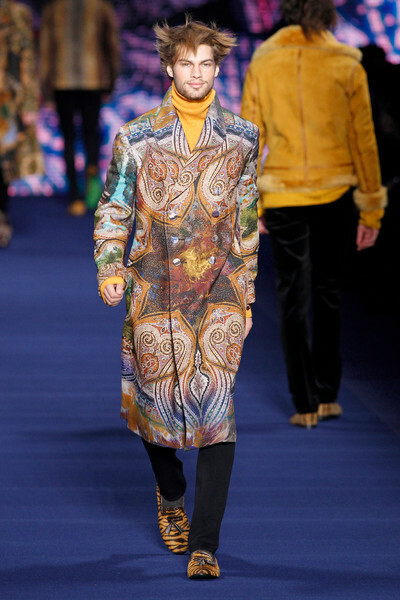 The prints were slightly faded, as if they were aged by time and could be found on wrap dresses, pencil skirts, oversized scarves and dresses with tuxedo jacket silhouettes. 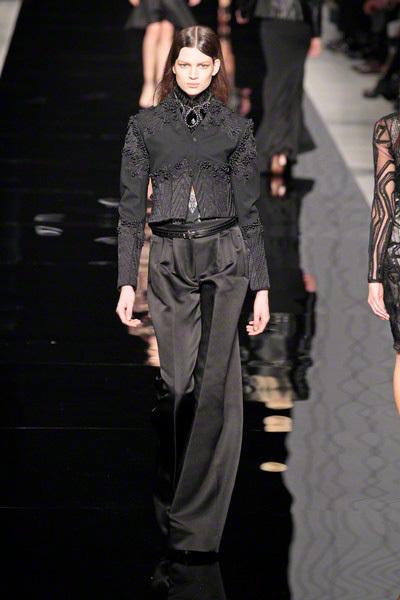 Raw jewelry, like sharp edged earrings, sword necklaces and silver buckles were the perfect finishing touches of this collection. 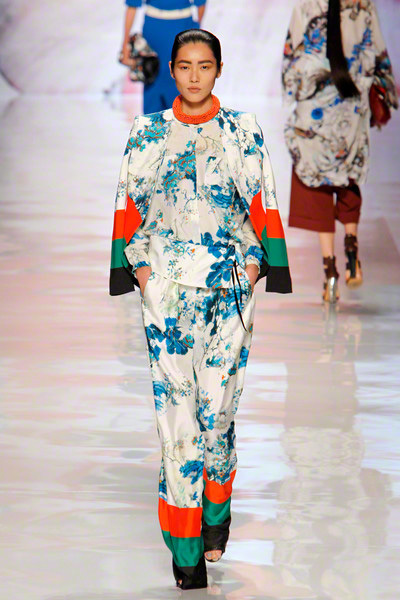 A collection full of pieces which women of any age would love to work into their wardrobe. 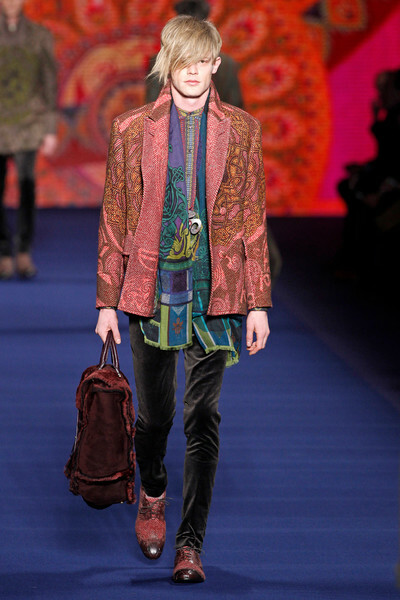 At Etro champagne, brownies, and colorful pillows on our seats set the right mood for the show. 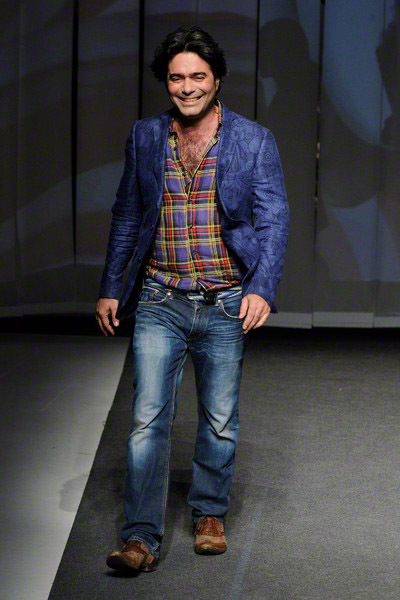 Yet the clothes itself already told a great story. 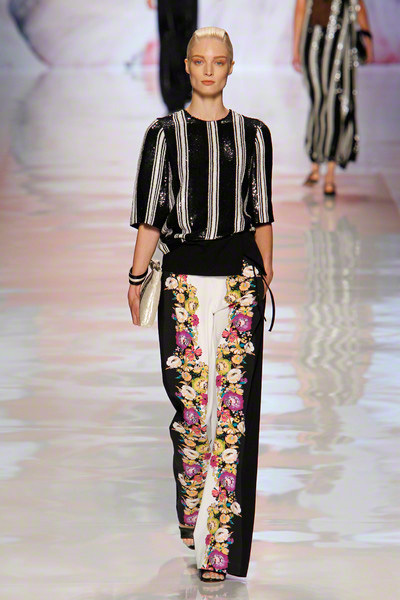 That story started with a high waisted pair of floral trousers and a black & white zig zag printed top. 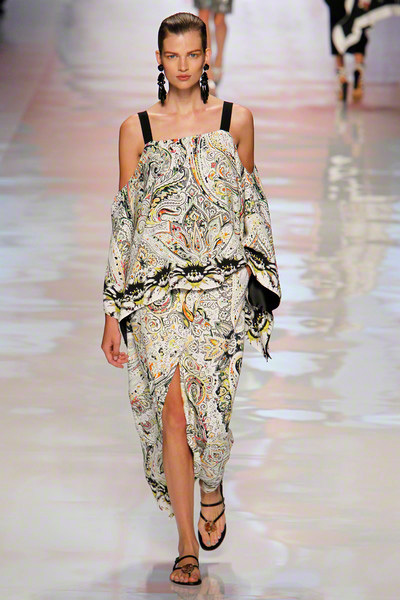 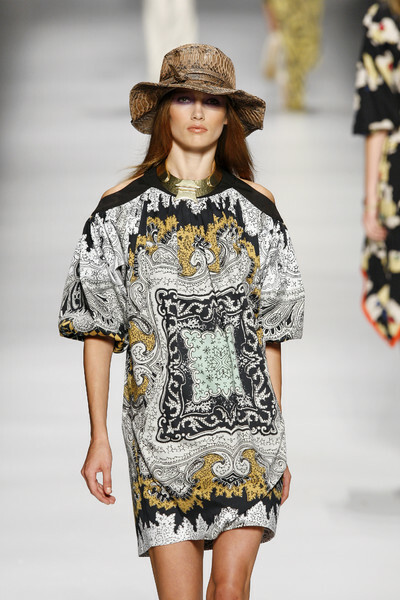 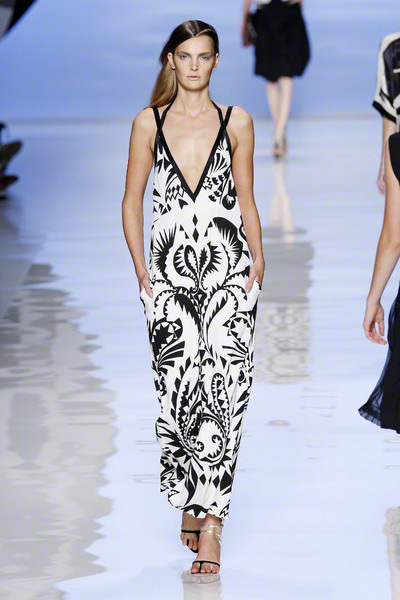 Then Etro’s famous paisley print came by on a t-shirt dress, followed by airy top with open shoulders. 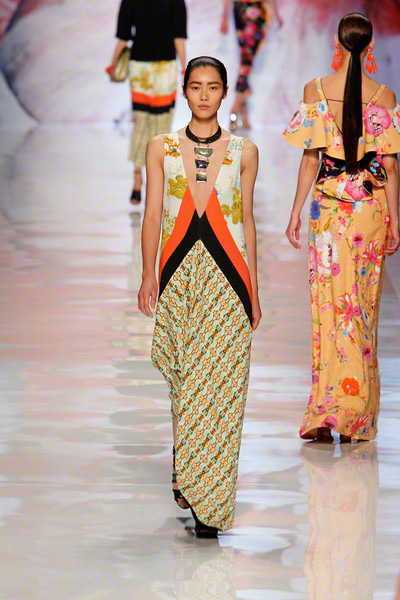 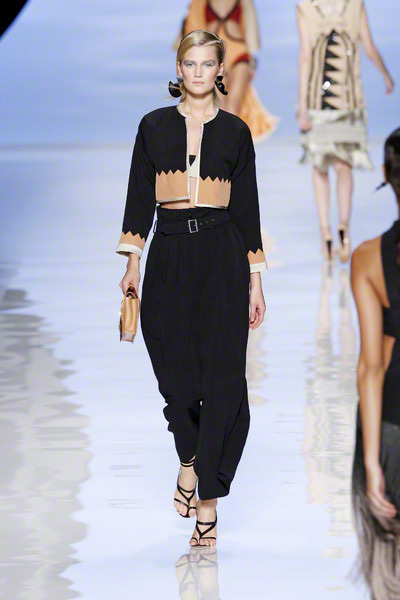 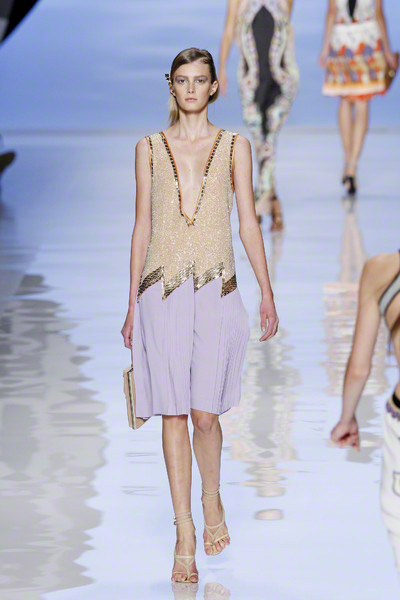 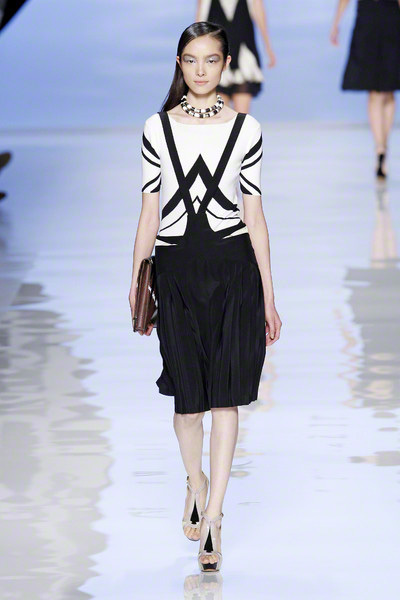 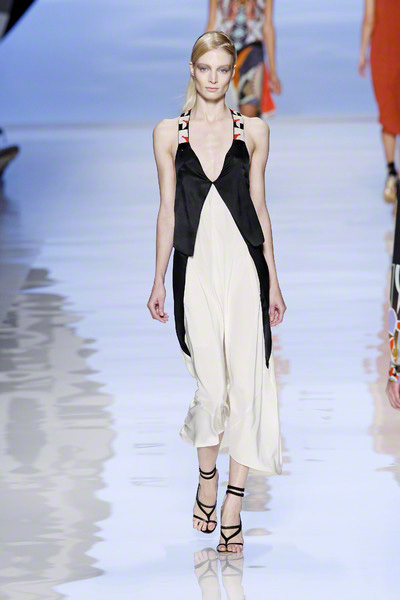 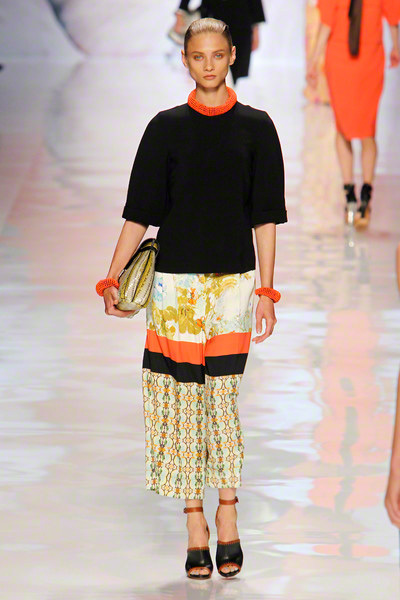 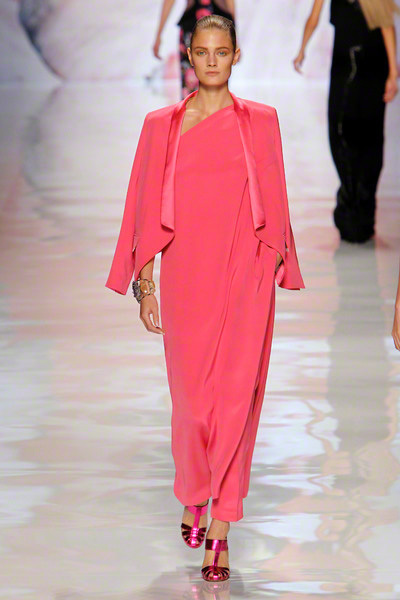 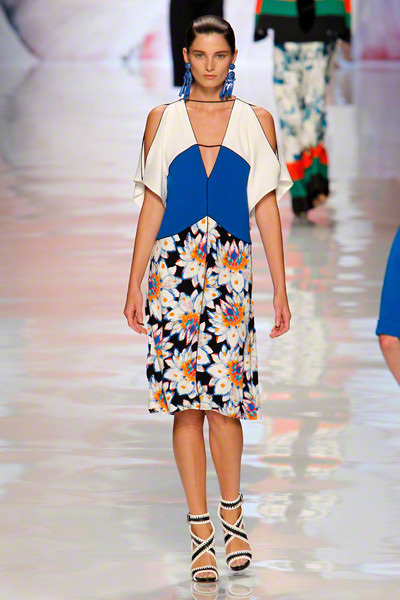 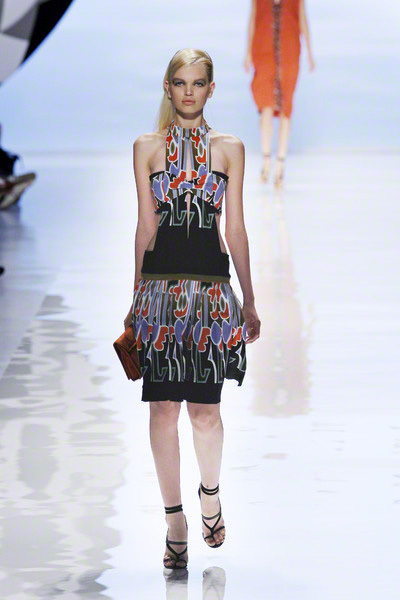 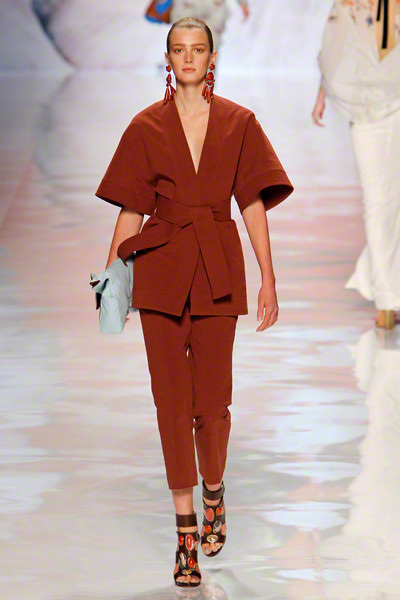 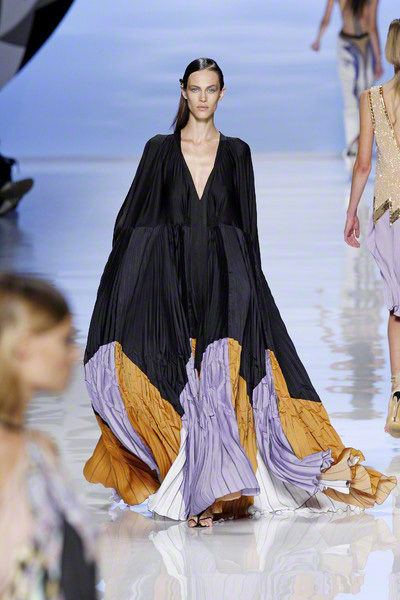 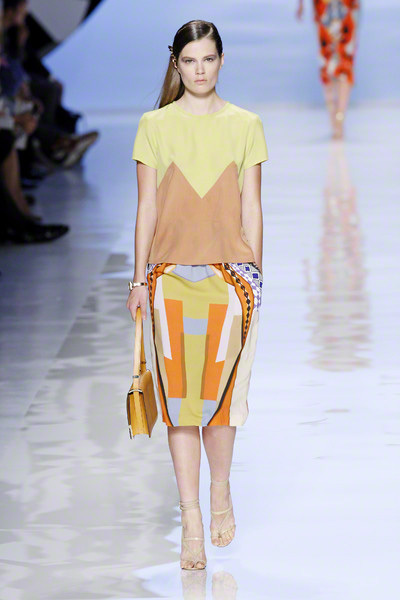 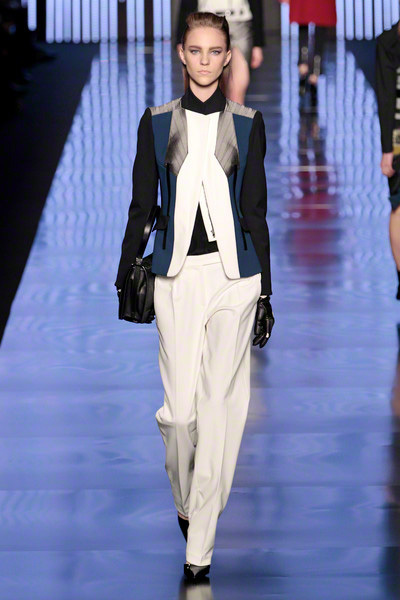 There were asymmetrical halter dresses, slim tunics, silk pants, color blocking shorts and printed pant suits. 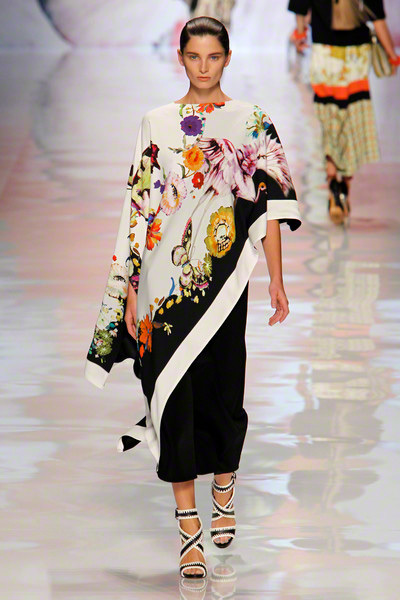 Some tops and dresses had the shape of handkerchief and seemed to be made out of just one square piece of beautiful printed fabric. 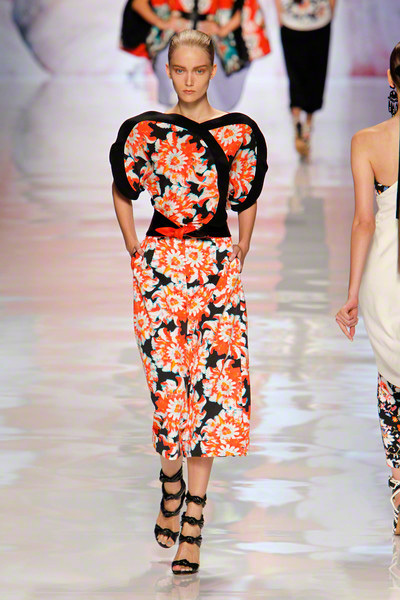 Several outfits were a combination of two prints, yet created the illusion of one piece. 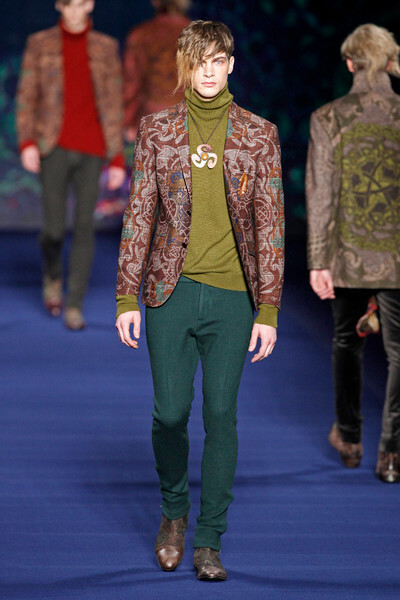 Their earthy tones and popping brights (flag green, turquoise, coral) shades matched perfectly. 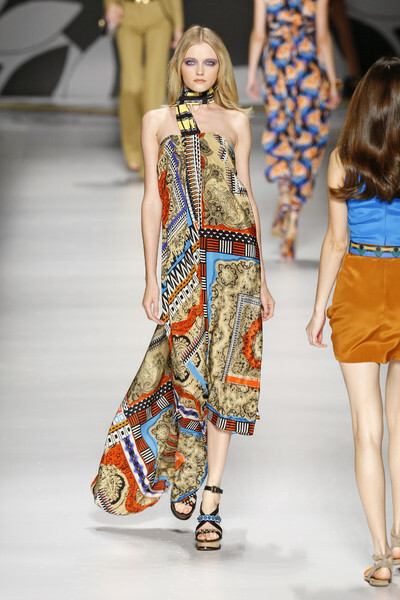 They added to the whole seventies vibe of the show. 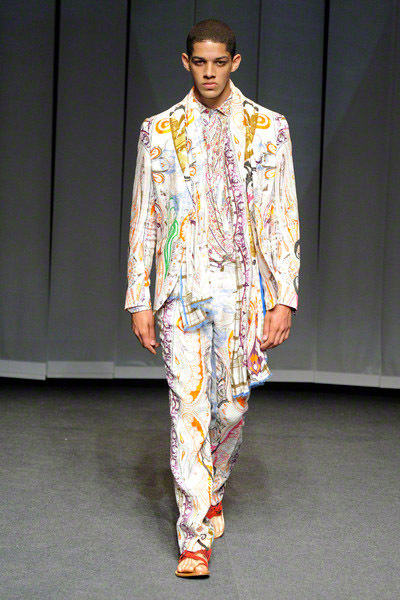 Apart from the prints much attention was paid to decorating the looks as well. 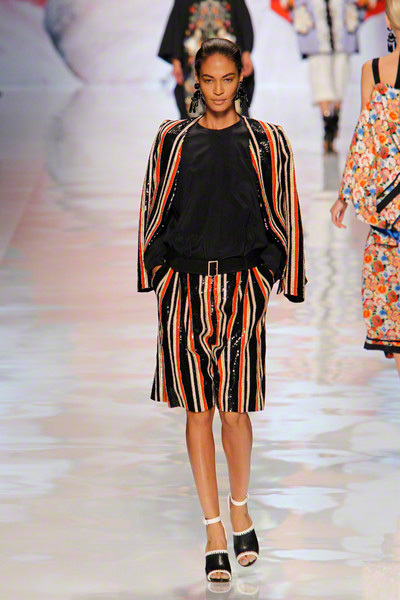 We loved the jackets embroidered with tribal patterns, the tunic dresses with black and white beading, the bags with scarf pattern, the wood platform sandals and the jewellery. 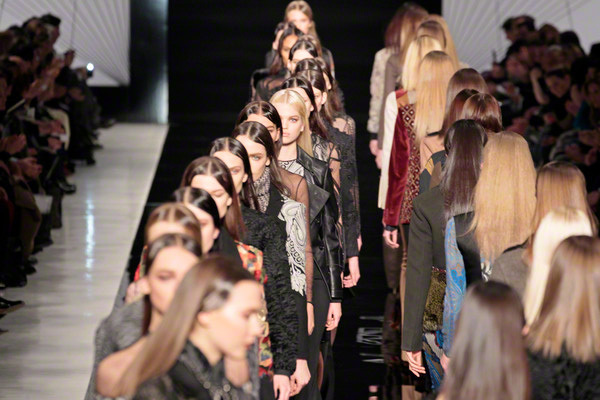 The models looked comfortable and chic. 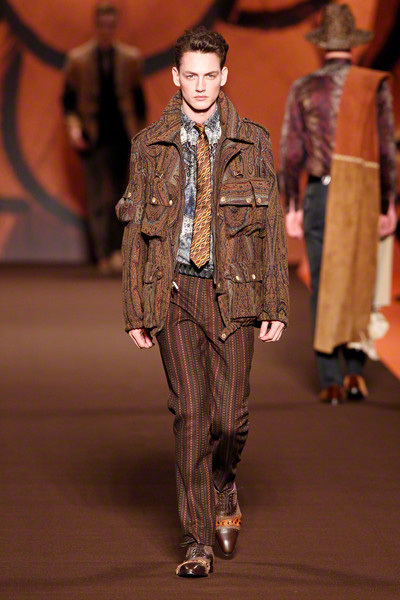 And since the seventies are officially one of the biggest trends for next spring, we’ve got a feeling this Etro collection will become a big hit.